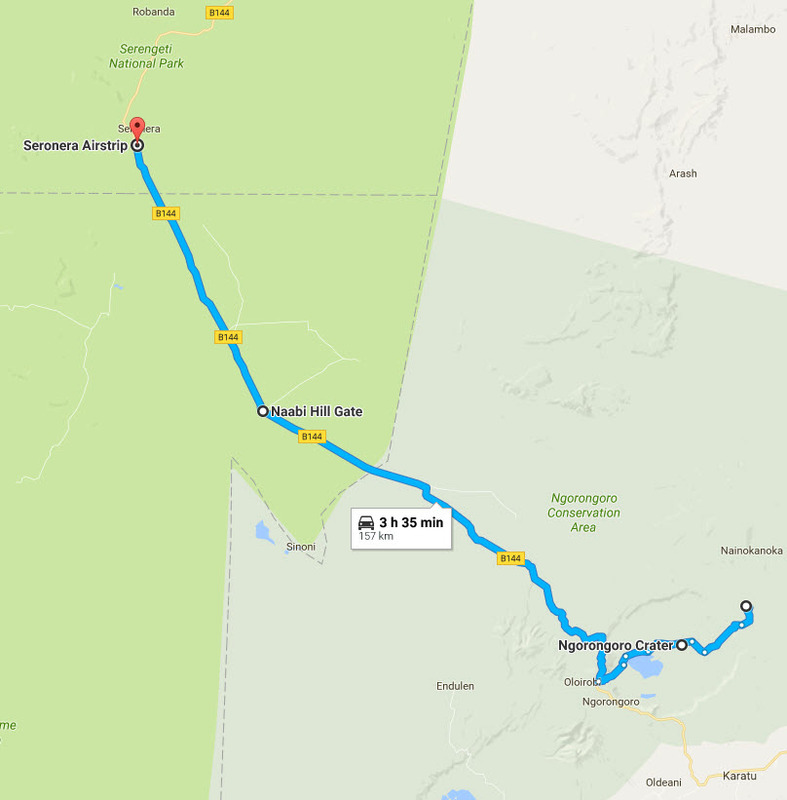 Jambo and Karibu sana! 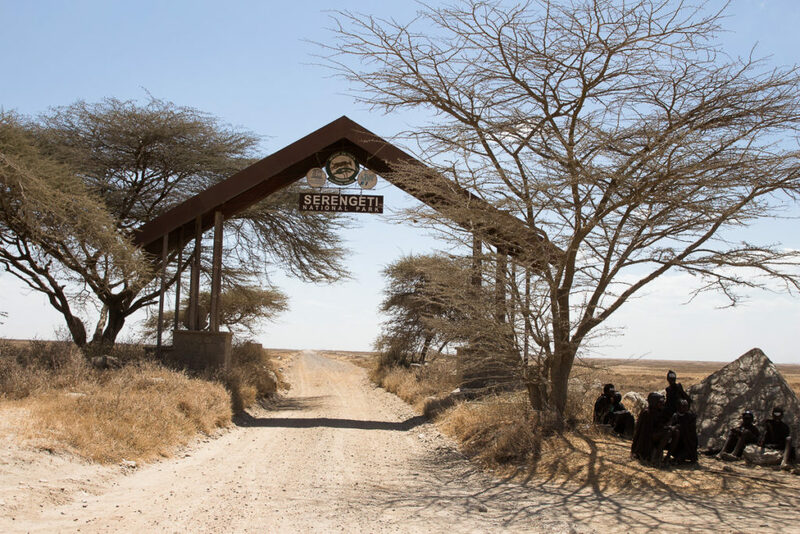 This is our trip report of the 12 wonderful days we spent on our Serengeti safari with Gosheni Adventures. 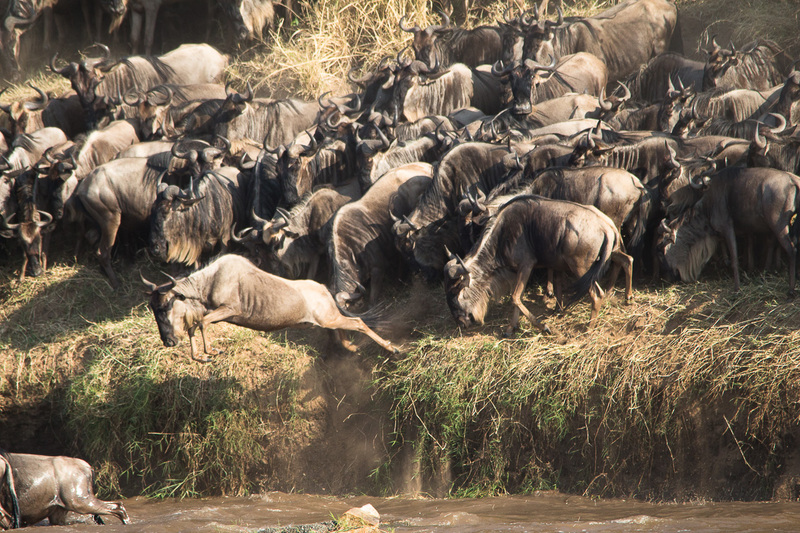 We’ll chronicle the good and the bad, and list out many of our first world problems, so that you can better plan your future trip East Africa! 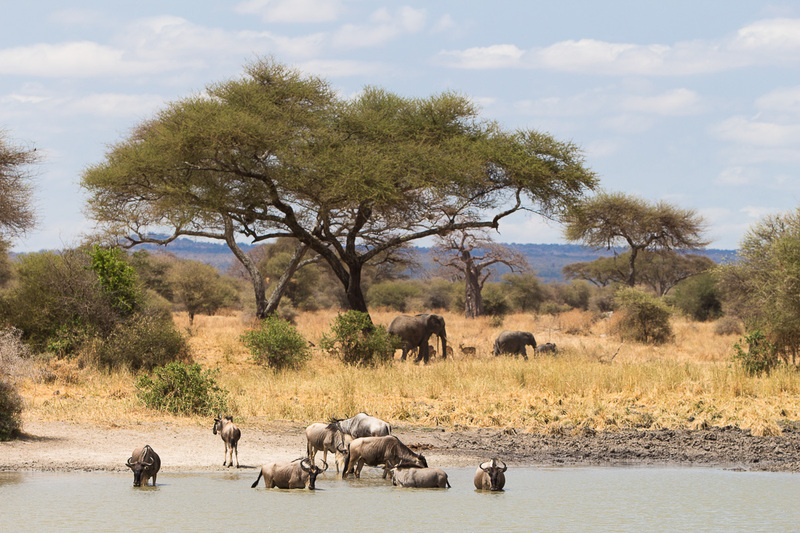 Animals Seen: The Big Five (Lion, Leopard, Elephant, Rhino, Water Buffalo), Cheetah, Giraffe, Hippo, Ostrich, Hyena, Vulture, Nile Crocodile, Baboons, Warthog, and many more! 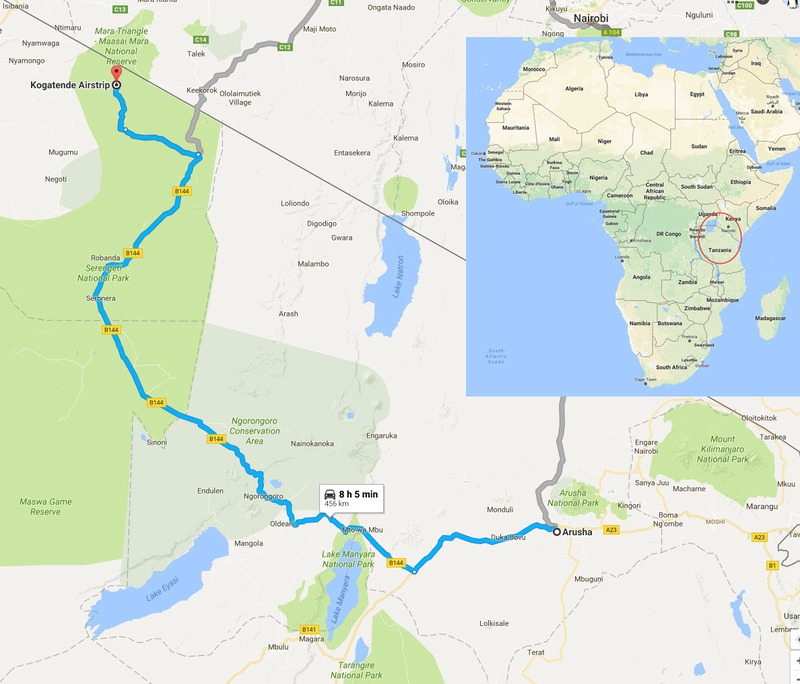 Serengeti…See those driving time estimates? Now, ignore them because you’re not driving 50 mph on a paved road. Flying to Africa from San Francisco takes an iron bottom to withstand ~20 hours of flights with multiple transfers. But Yay! 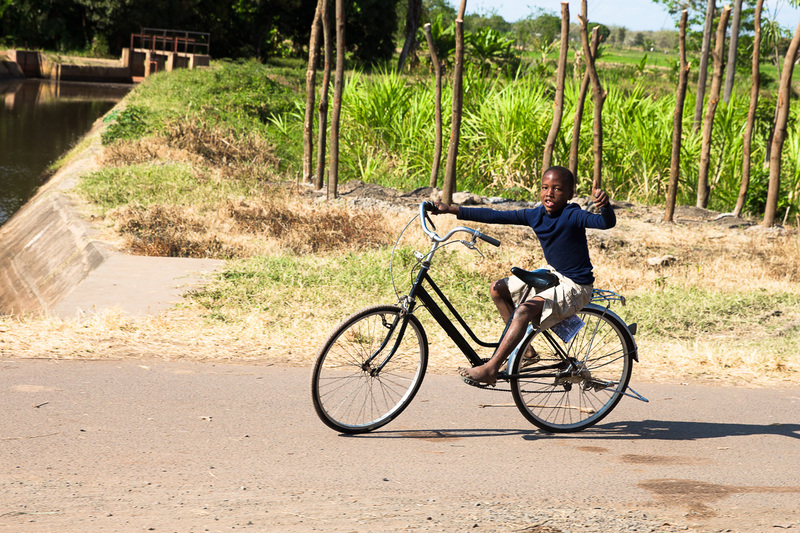 We finally made it to Arusha, Tanzania! At the Arusha airport, we waited in two lines for about an hour total. 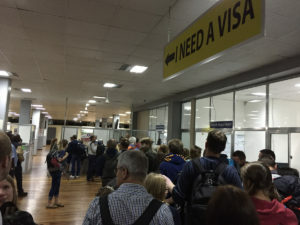 In the first “Need a Visa?” line, we filled out the forms and paid $100 USD per person (no ATMs to be seen, so bring COLD HARD CRISPY NEW CASH). 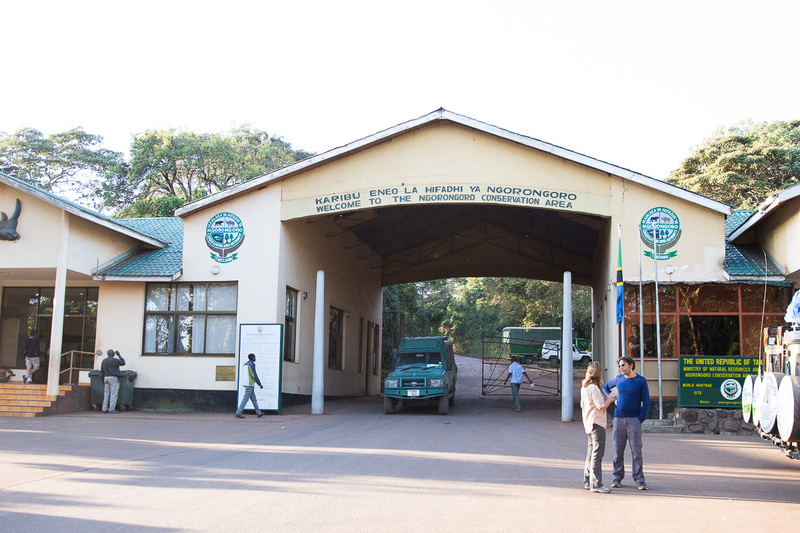 Then we waited in the second line, where an agent reviewed our passports and forms again, took our fingerprints, then granted us entry into the country. 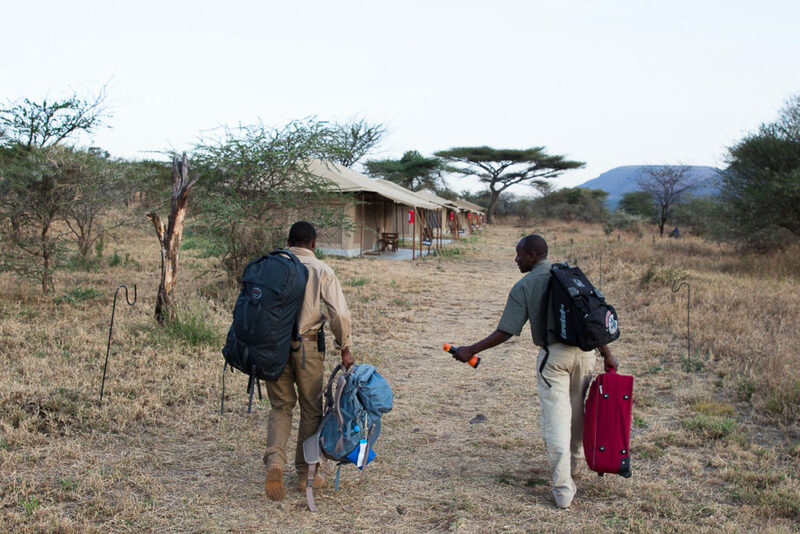 With no check-ins (backpacks are the way to go! ), we made a beeline for the door. Our driver, Zadoc (Biblical name), was happily waiting for us. 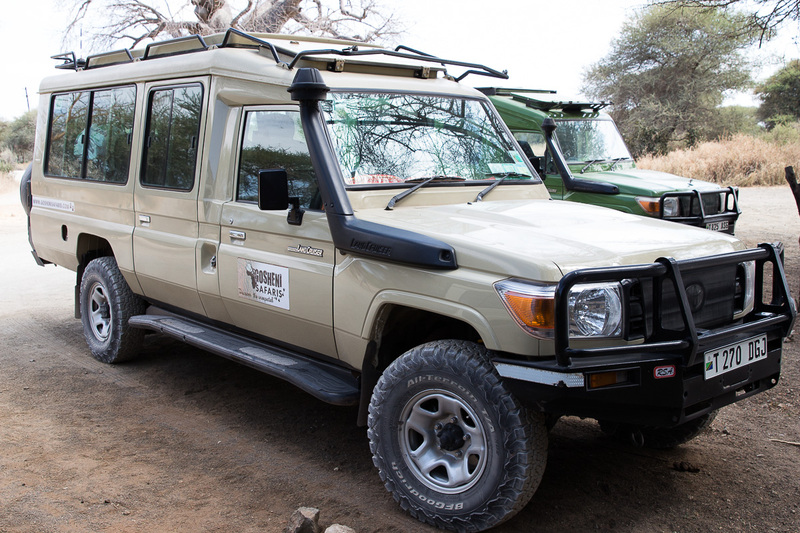 We jumped into the new Toyota Land Cruiser and headed to the Mount Meru hotel in the nearby town Arusha (50km from airport). We learned a lot about Zadoc in our 12 days together. His wife is a teacher and he has two young boys. 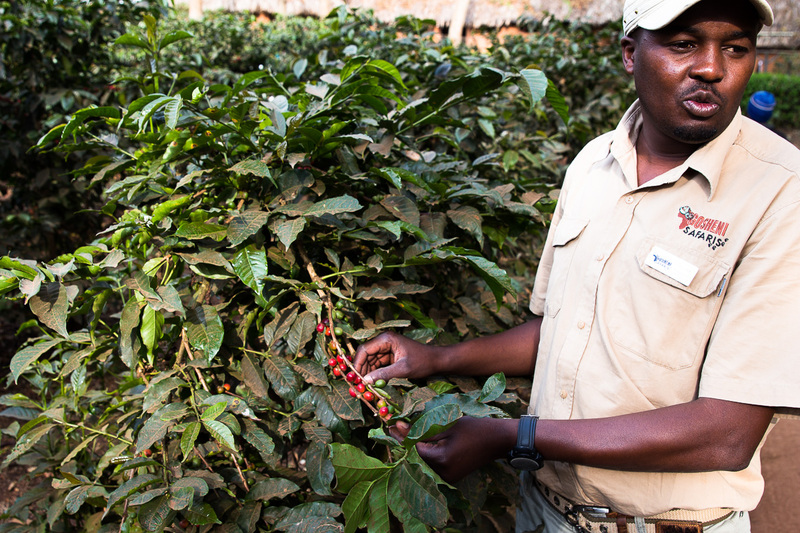 Growing up in Tanzania, he helped his parents grow coffee and bananas and is very knowledgeable about the coffee process. 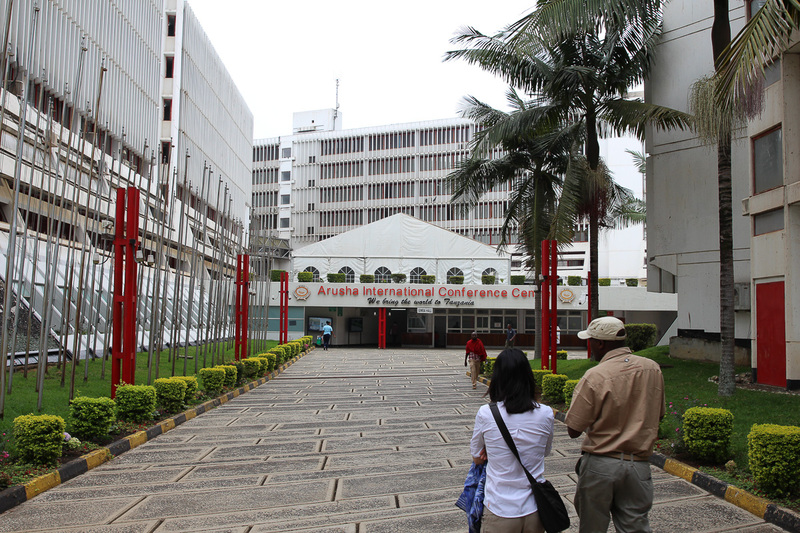 The Mount Meru hotel was modern and nice. We didn’t see any mosquitoes, but wore long sleeves and pants to sleep anyway. It was warm at night and very pleasant weather. 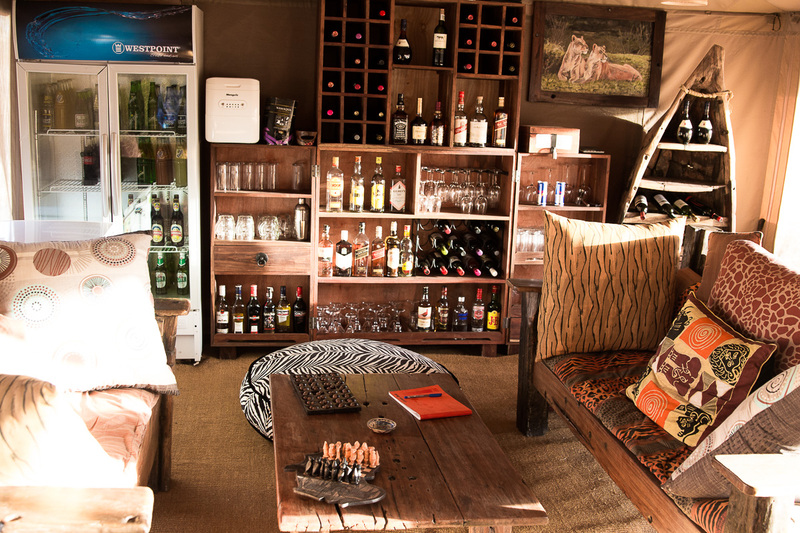 Tanzania is slightly south of the equator and we found the weather in Arusha to be warm. Weather was perfectly warm with an occasional cool breeze, like a nice San Francisco day. The breakfast at the Mount Meru hotel was filling and Western style (nearly all hotels cater to us Westerners in food, which kind of makes us sad but many tourists will only eat Western food so sigh). The coffee was excellent, dark and rich. 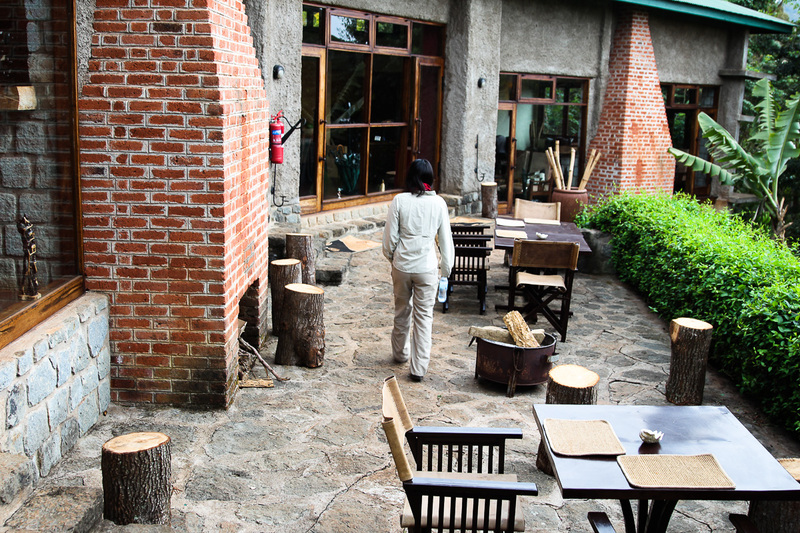 The hotel has their own coffee farm near Lake Manyara. It was Jon’s first coffee in two months so he was really excited. 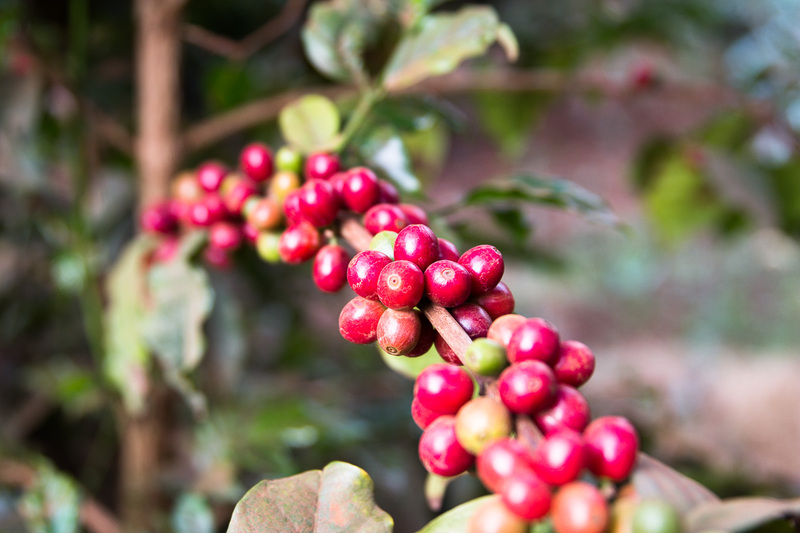 We figured there would be a lot of delicious coffee in Tanzania! 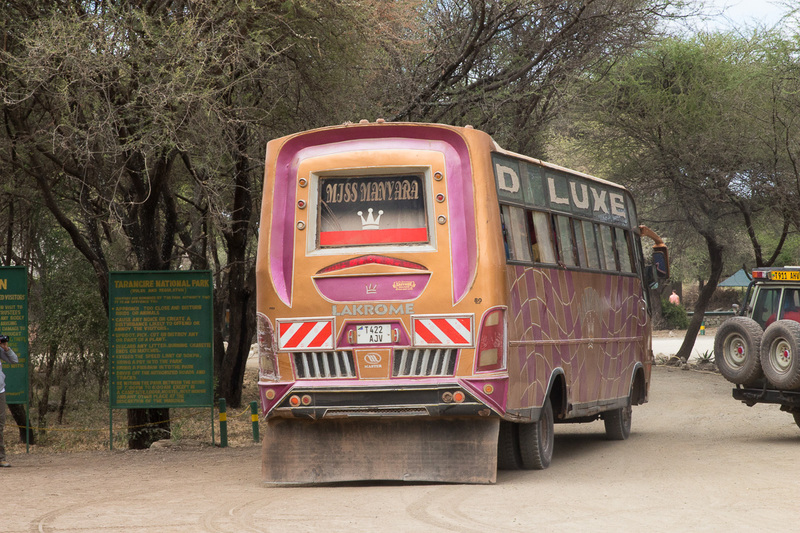 One hour later, we arrived at Lake Manyara National Park. 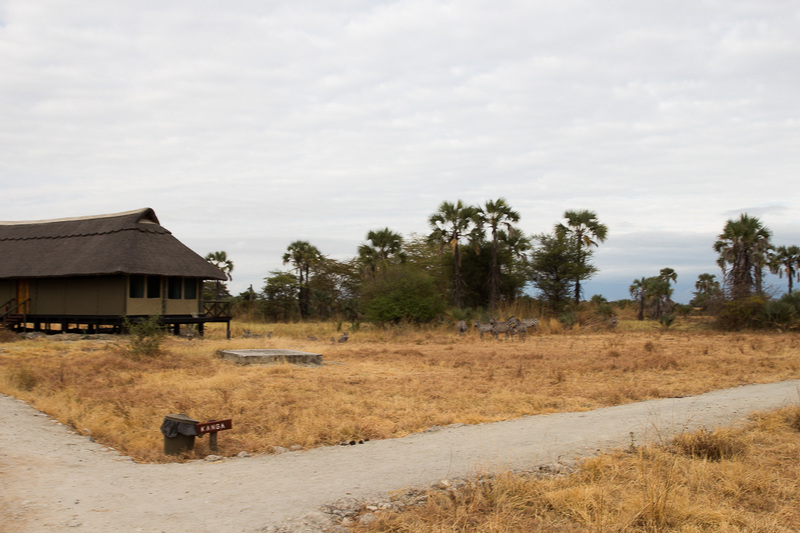 We were so excited to start the first day of our safari! A kid with a clipboard checked us in and gave us a brief introduction tour. 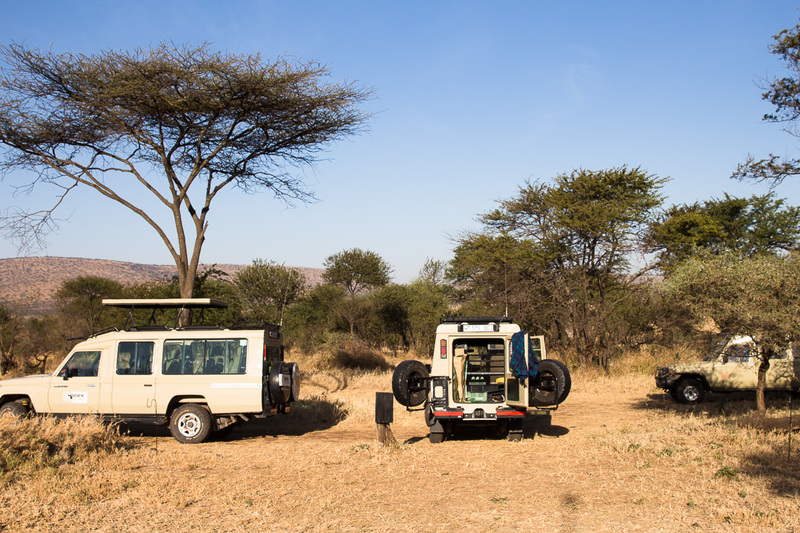 We used the toilets, covered ourselves with DEET (for mosquitoes), and popped the top of our Land Cruiser. 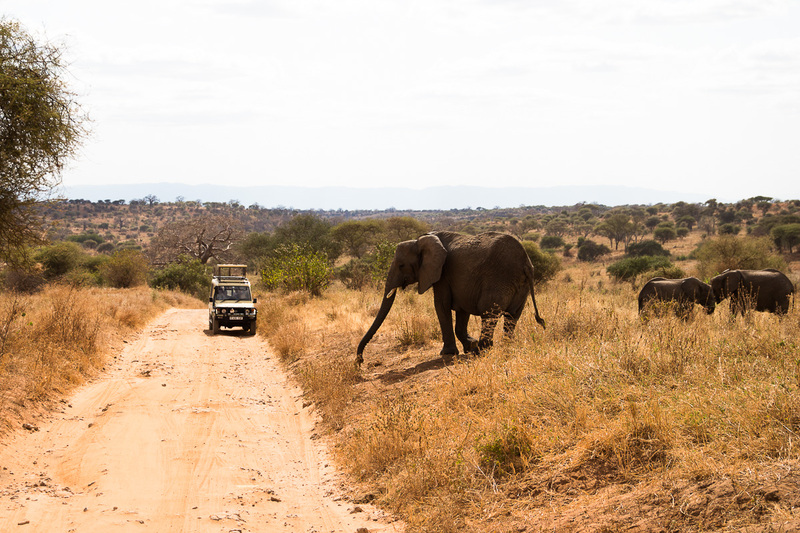 Safari time! 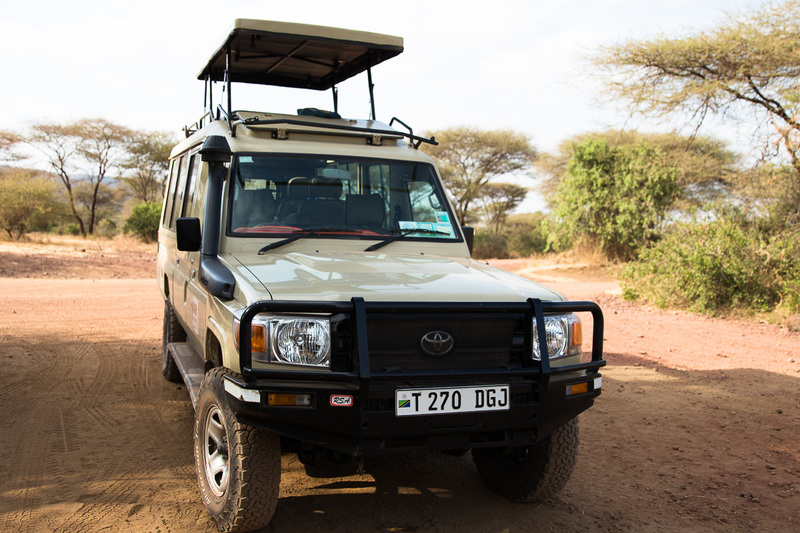 The off-road adventure driving made us feel like we were in an Indiana Jones movie. 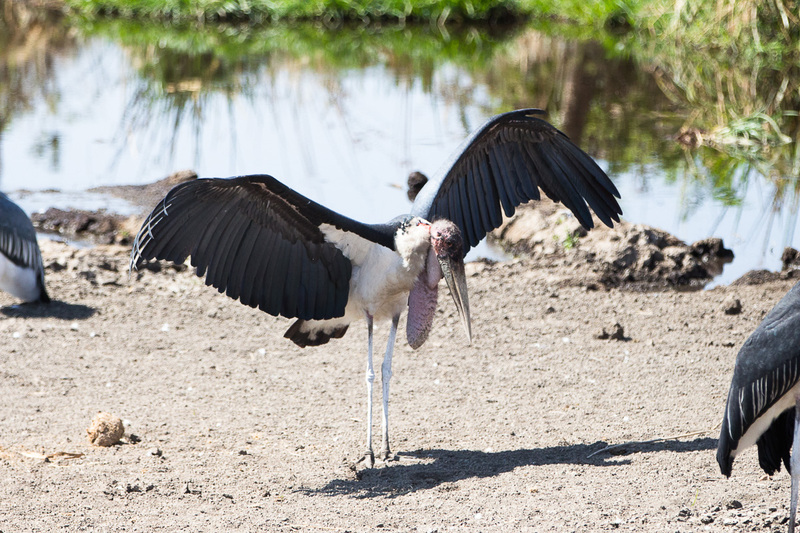 We saw elephants, baboons, sleeping lions, weird looking birds, eagles, storks, zebras, wildebeests, flamingos, and more elephants. 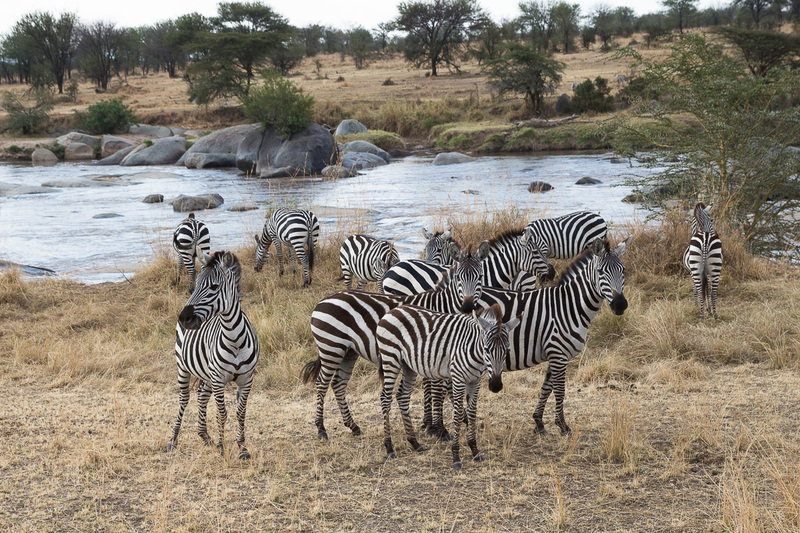 A woman we met at lunch said that we’d soon be tired of seeing zebras and wildebeests because there were so many of them. Anyway, everything we saw was mind blowing! 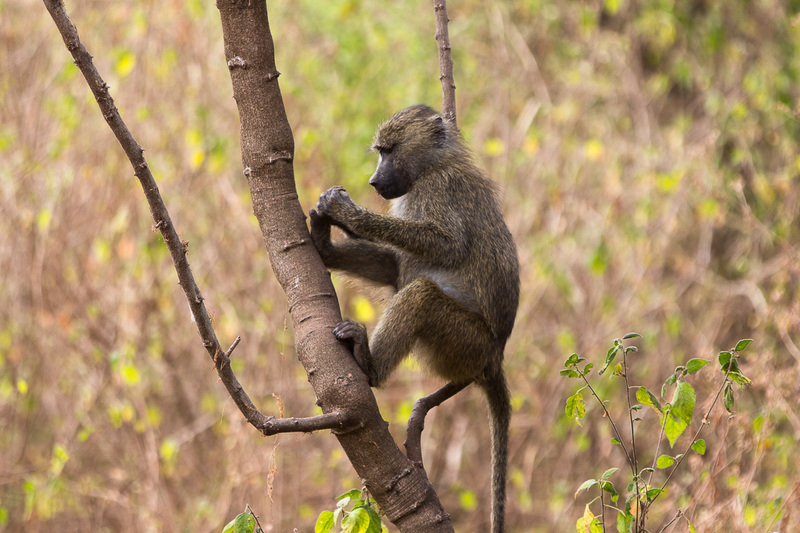 Our favorite animals were the baboon babies and the weird looking birds. Box lunches were just ok…usually the previous night’s lodging packs a lunch for your day. A typical box lunch meal will consist of a piece of chicken, a hard boiled egg, fruit, bread or muffin, candy bar, and boxed juice. We gave our lunches to the park workers who happily took them. We realized we should have a more grateful attitude! 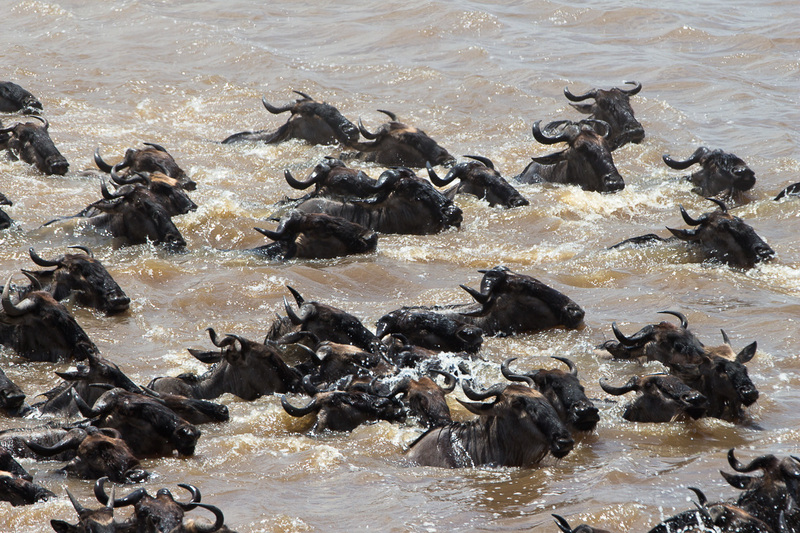 There seems to be mixed opinions on visiting Lake Manyara on the interwebz. 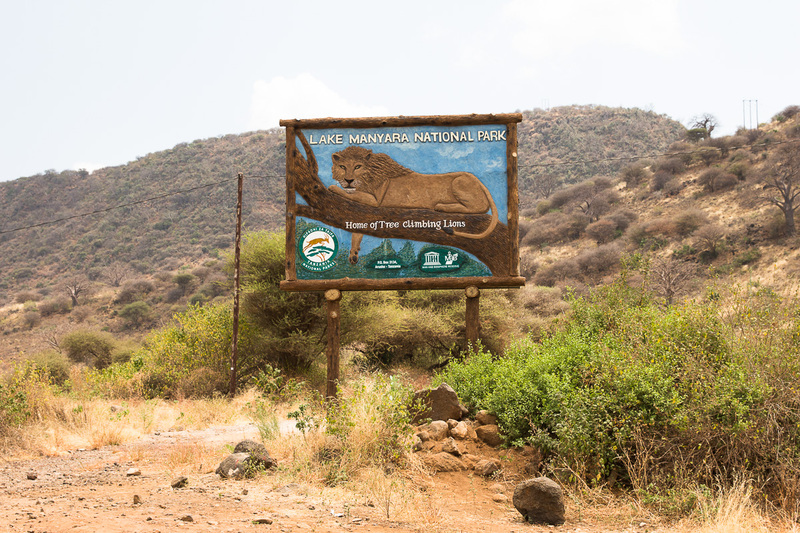 We’d recommend to visit this park at the beginning of your safari since wildlife is the least, and you can even skip this park if time doesn’t permit. 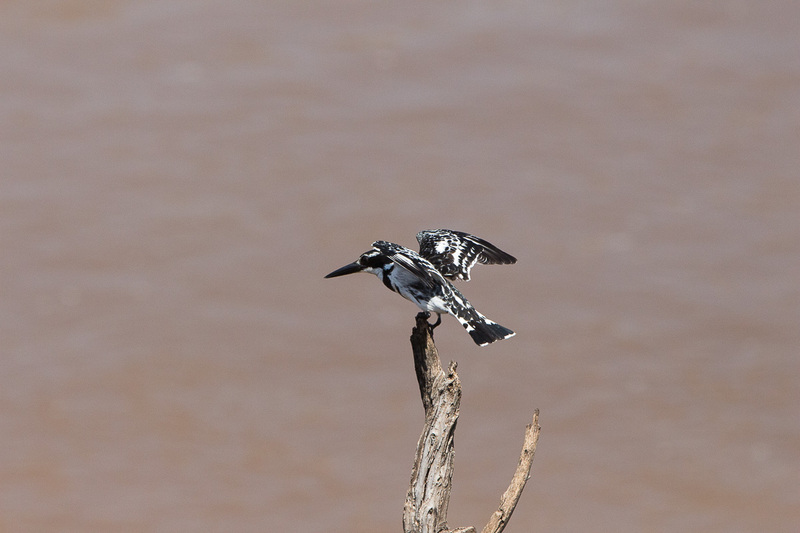 However, many people state in the wet season Lake Manyara is a birder’s paradise. 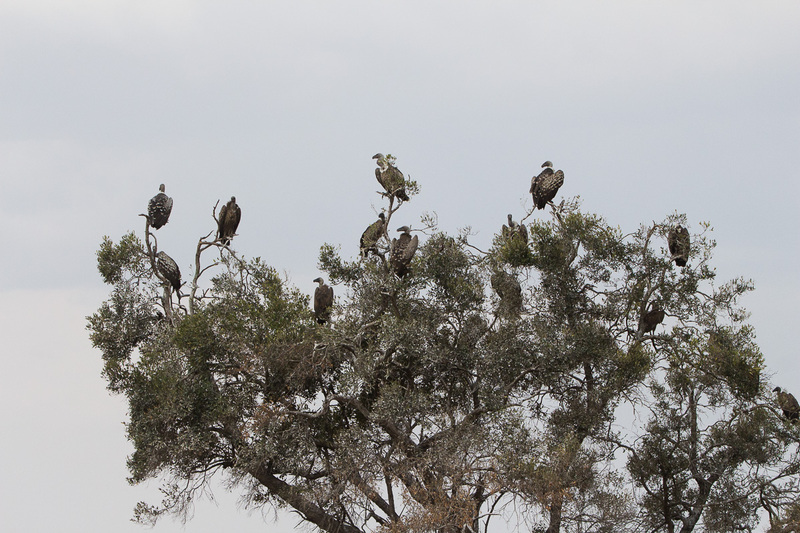 We definitely saw the most birds here and I imagine the Lake would be more full in the winter. 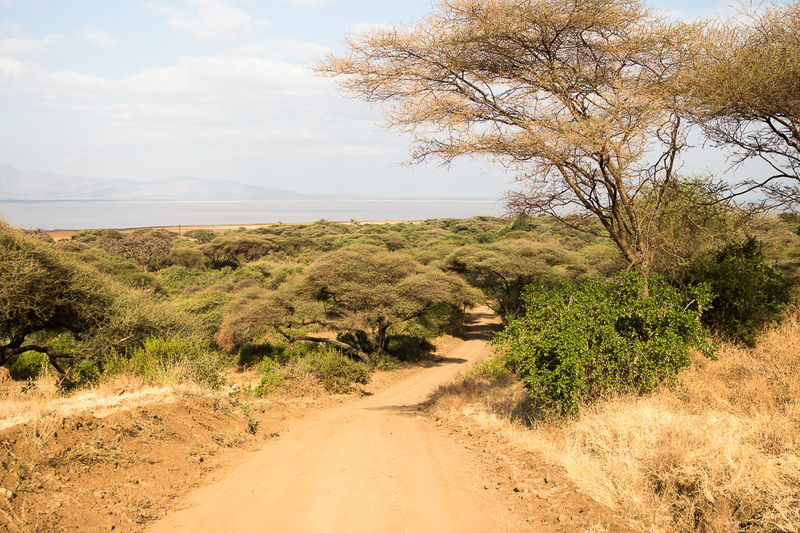 We left Lake Manyara and arrived at the Endoro Lodge, after a bumpy 5 km off the main road, past shanty homes and a coffee farm. 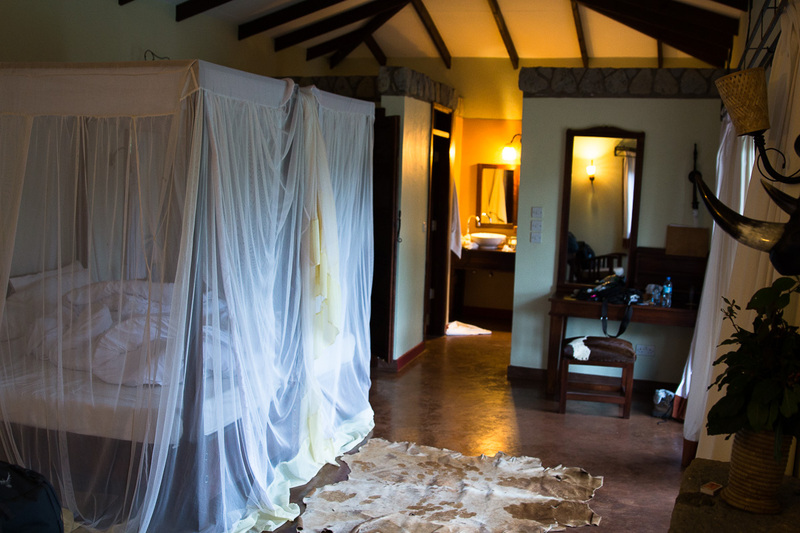 Each room is nestled into the mountain and has beautiful views of the lush, green mountainside. 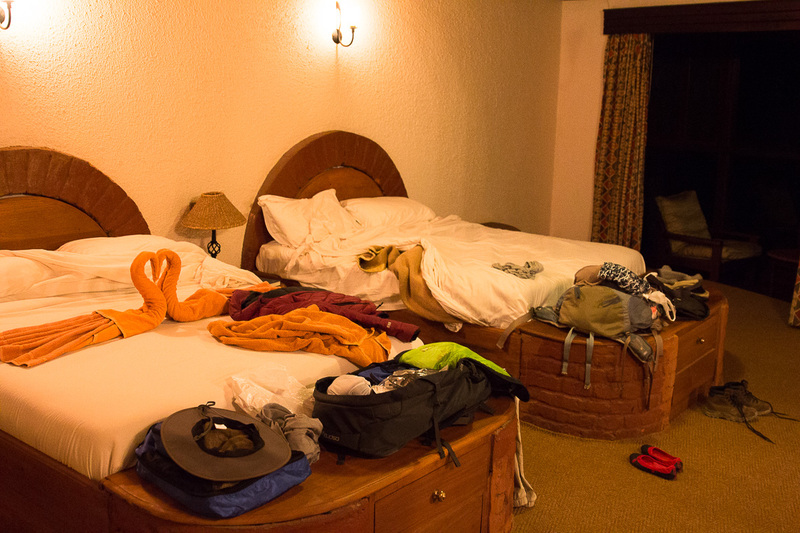 Our hotel room was quite spacious and nice, with a fireplace we kept running all night! 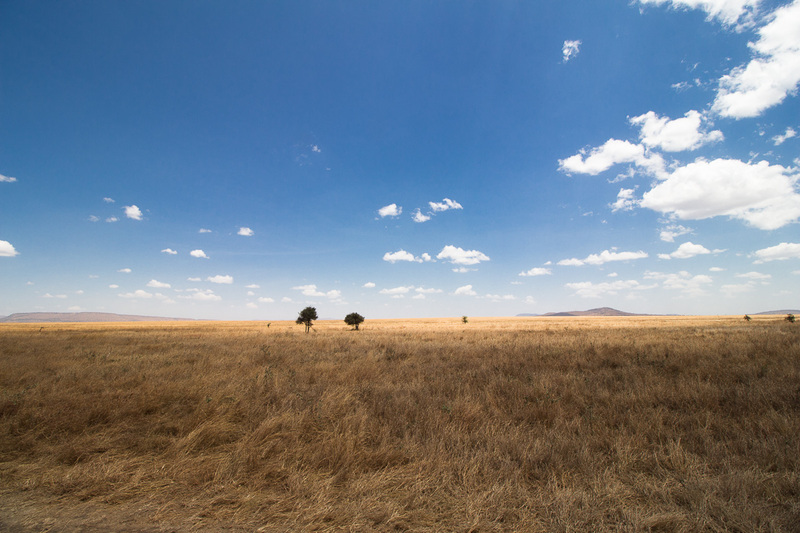 The temperature in this part of Tanzania is very cool and forest-like. We were a bit worried about mosquitoes. 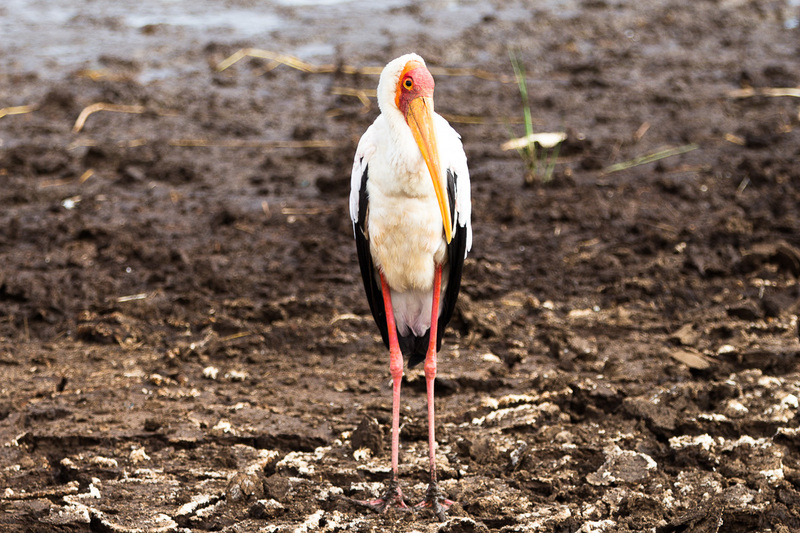 Luckily we didn’t experience any in Lake Manyara or in mosquito town (rice farm town). Zadoc said that the malaria carrying female mosquitoes come out to feed from 12am-6am. He’s had malaria multiple times, as everyone else in Africa. It’s like getting a cold or flu he says. 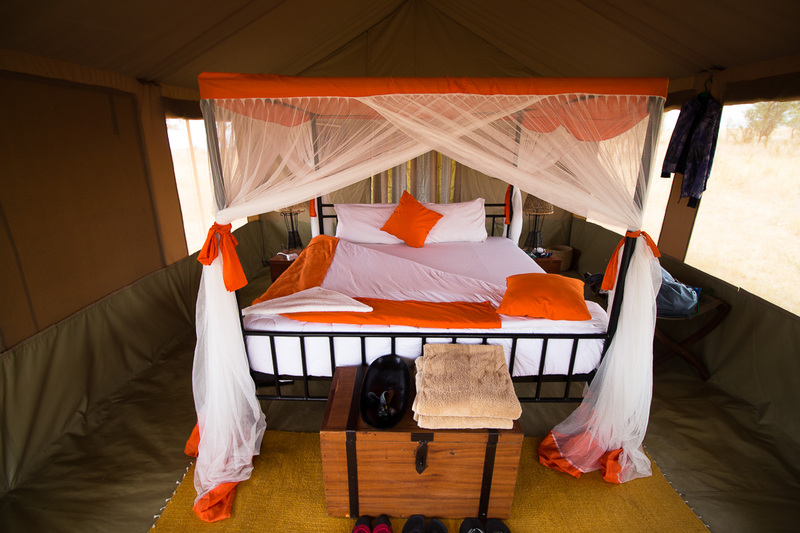 We pulled the mosquito net tight around our bed and fell fast asleep, dreaming of parading elephants and prancing zebras. Note: Click on any thumbnail to launch the slide show, then hit the “right arrow” button to flip to the next picture. Each day’s slide show has a lot of pictures! 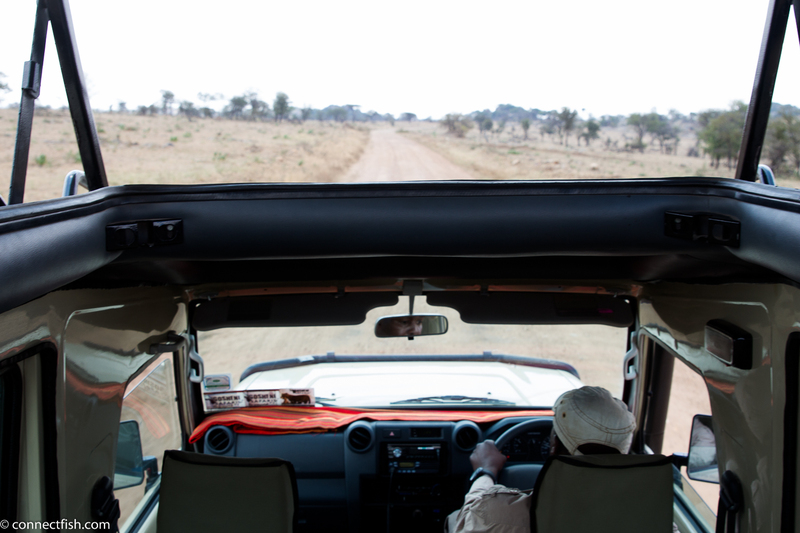 At 8am we picked up our lunchboxes and were on our way to the famous Tarangire National Park! 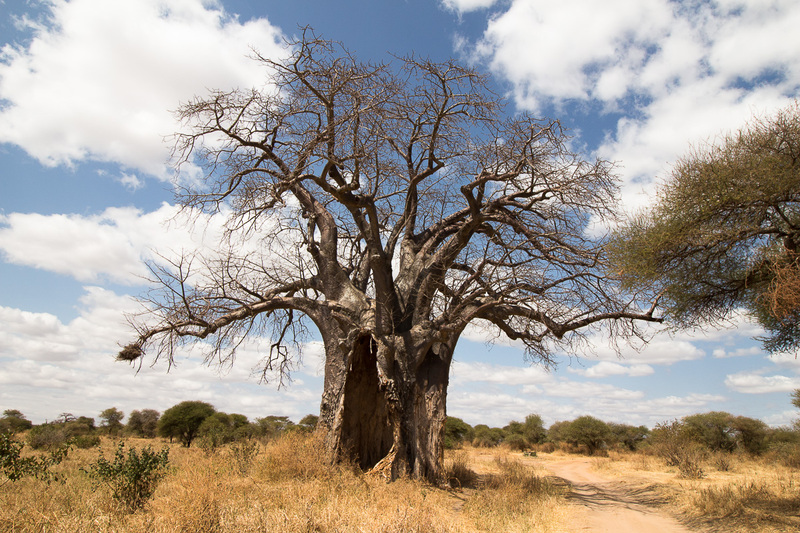 Tarangire is known for its large elephant population and beautiful baobab trees. 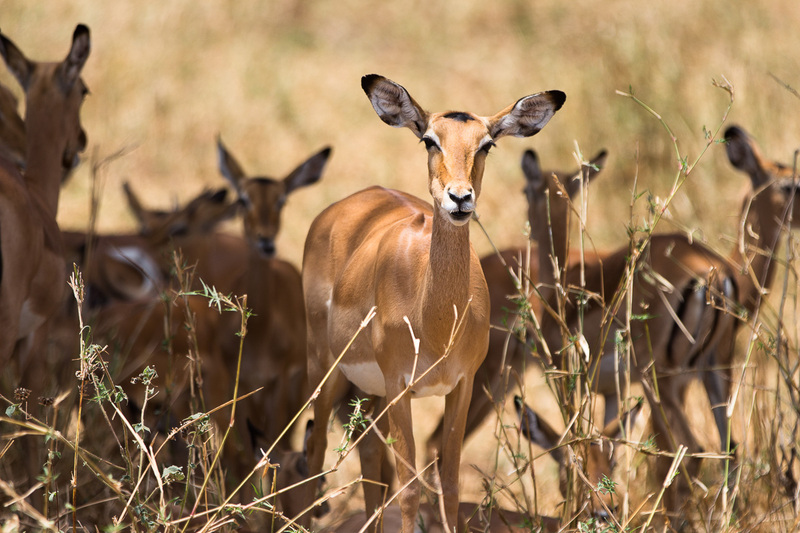 We’d recommend spending a full day or two or three here as this park has the highest concentration of wildlife in Tanzania. We did the typical check in process with some random kid with a clipboard. 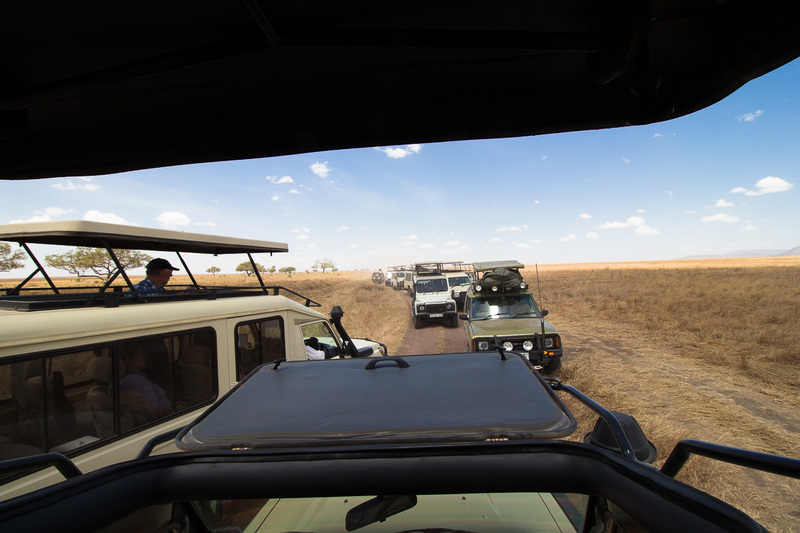 We used the restrooms, popped the top on the truck, and started our game drive. 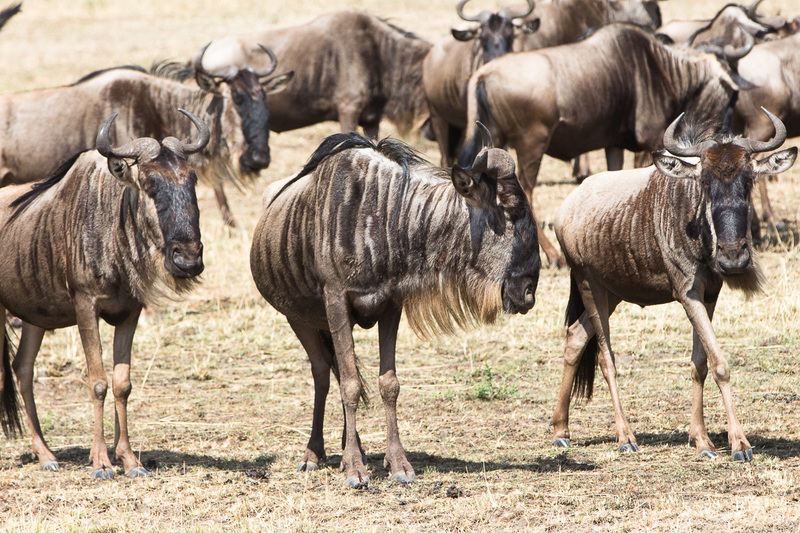 Immediately, we saw tons of zebras, wildebeests, antelope, elephants, and warthogs. It was so exciting to see them close up and in their natural habitat. 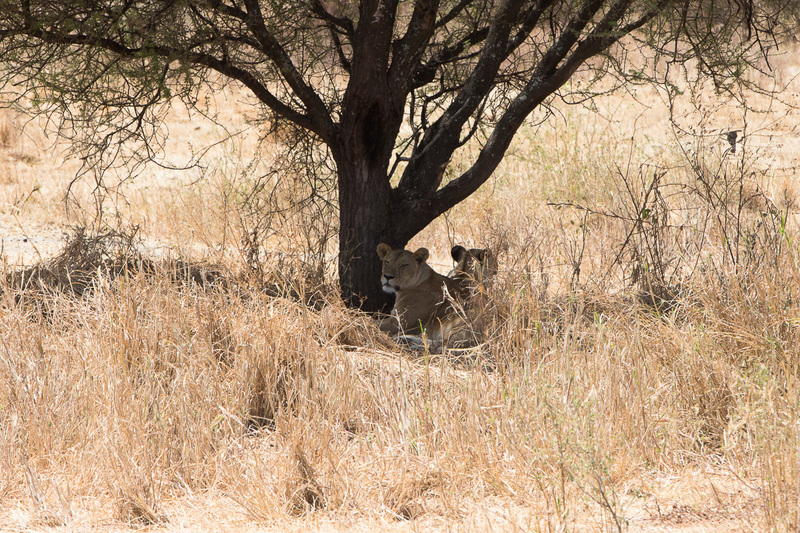 We even saw two lions sleeping under a tree, though they were far away. 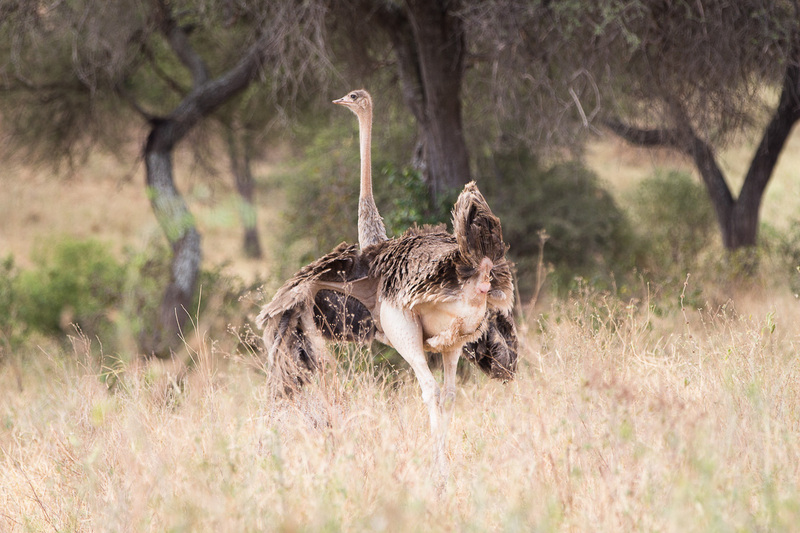 When I saw the Lion King movie as a kid, I always wondered if there were ostrich in Africa since Simba is dancing around with them, and my question was answered when we spotted some. 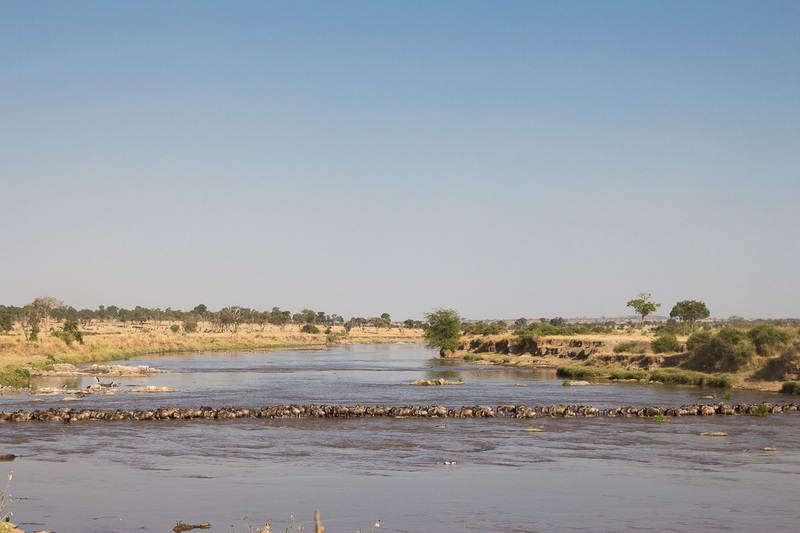 At lunchtime, we stopped at a popular rest area overlooking a cliff and the Tarangire river. 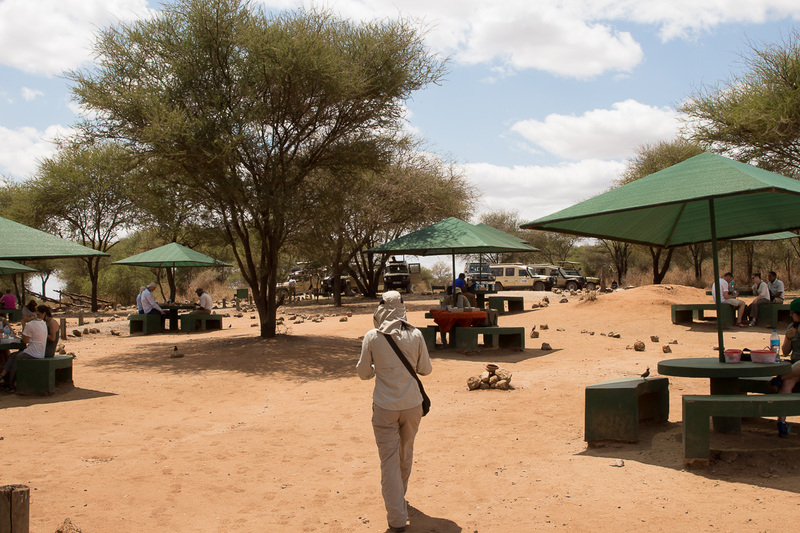 It’s a very lovely picnic area as you can watch the elephants and other animals in the distance. 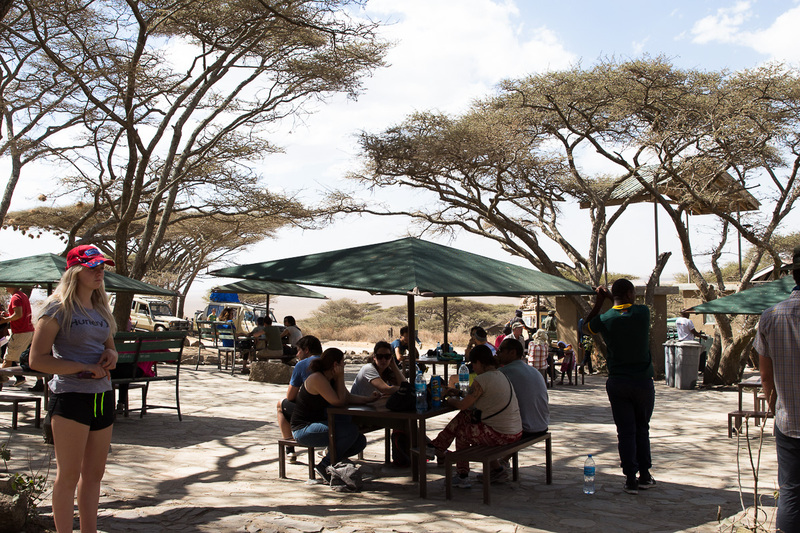 After lunch, we continued our game drive. 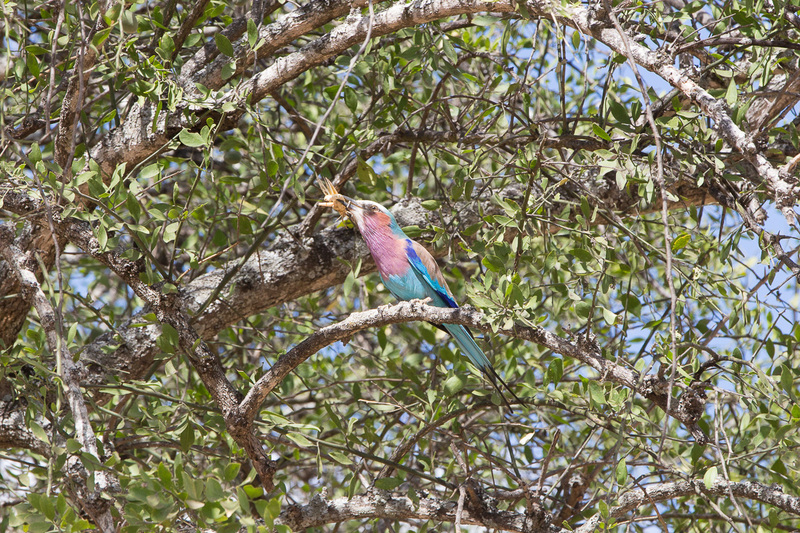 We spotted giraffes, elephants, lions, zebras, and beautiful birds like my favorite, the lilac breasted roller. 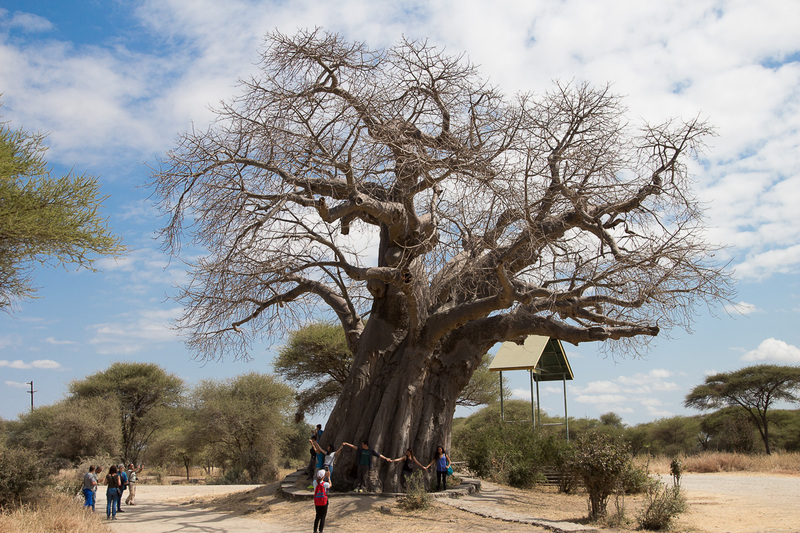 We also stopped at a large baobab tree that poachers once hid in. The day went by quickly. Zadoc recommended we leave early for the Maramboi Tented Lodge because it was a beautiful and unique place. 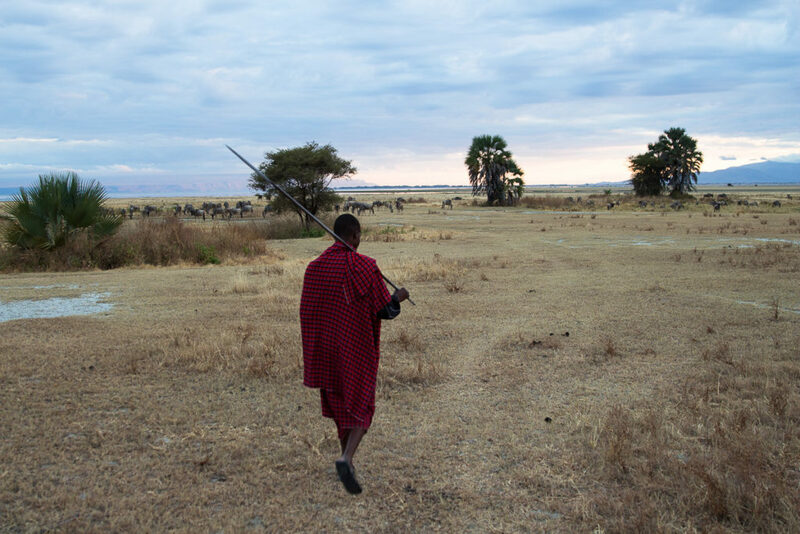 Driving there on the main road there were many young Maasai boys tending cows alone. They couldn’t be more than 4 years old! Anyway, we drove to the Maramboi, with a quick pit stop at a cheesy souvenir shop, where the sleazy sales guy told us to sneak him half the money into his own pocket. 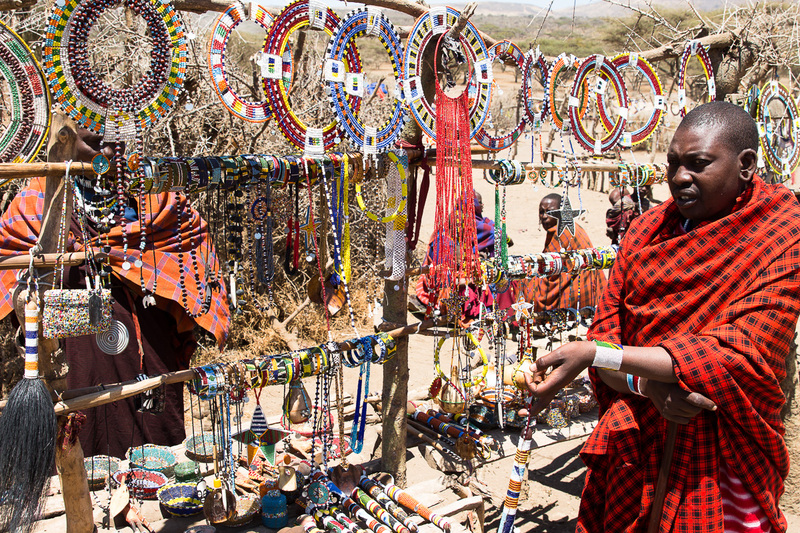 We bought a Maasai blanket and small painting for 50k Tanzanian schillings. The Maramboi lodge was excellent, with an infinity pool overlooking Lake Manyara that also opened up to a huge plain with animals roaming freely. 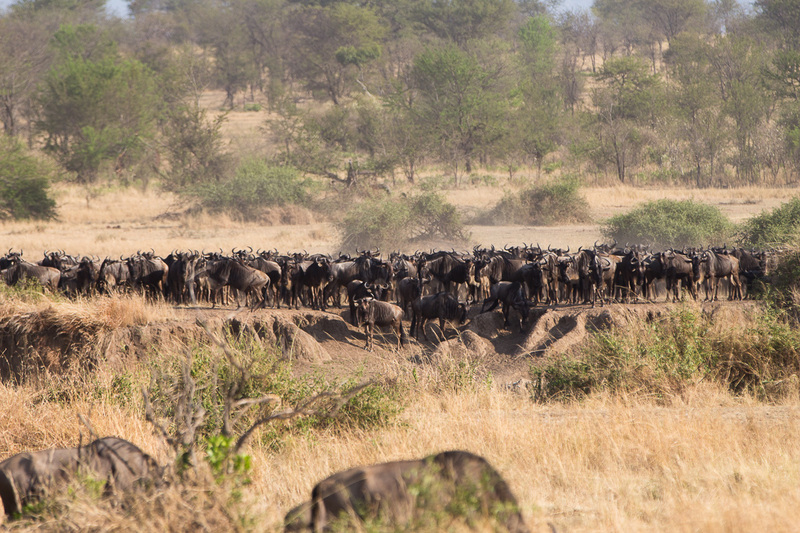 There were zebras, wildebeests, giraffes, and warthogs wandering around, drinking from the watering holes. We hung out near the pool for happy hour (6-7pm) and a beautiful sunset. Drinks were inclusive, all night long! 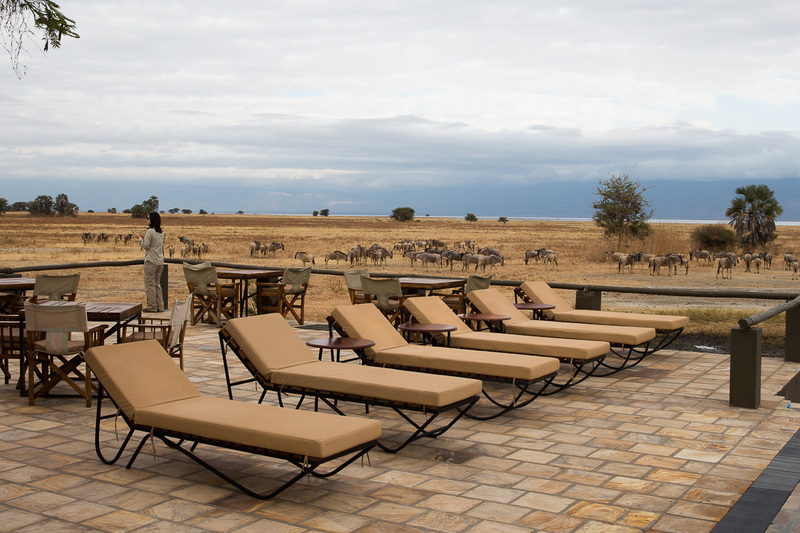 The dinner buffet was served al fresco under the stars and made for a pleasant atmosphere. Note: You have to have security walk you to and from your room because of all the wild animals roaming around. Before bed, the Mrs. noticed something large crawling on our bed’s mosquito net! I didn’t have my glasses on, but I jumped out of bed and found 2 bats! Yuck! they were crawling on the bed and the curtains. Since I am a weenie, I screamed aloud and called security to help us remove them. I think one crawled out of the room by itself via a hole in the roof. 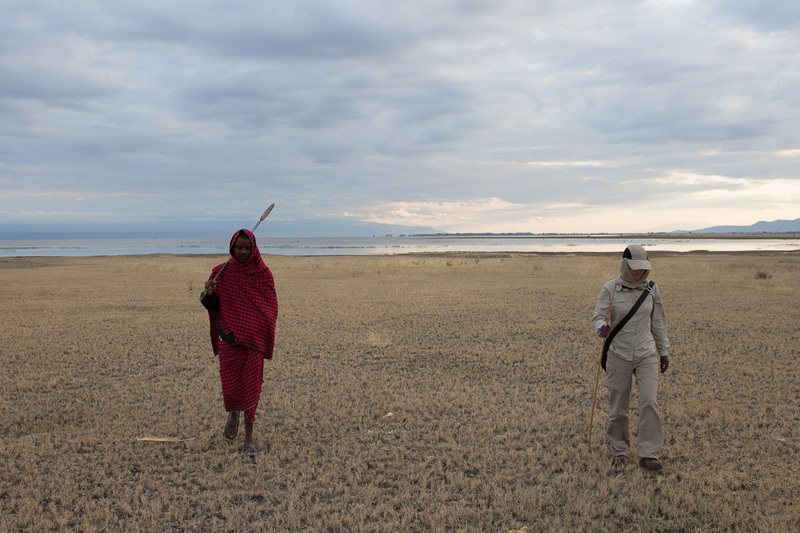 We woke up at 6:30am for a Maasai guided walk to Lake Manyara (Maasai is the local tribe). 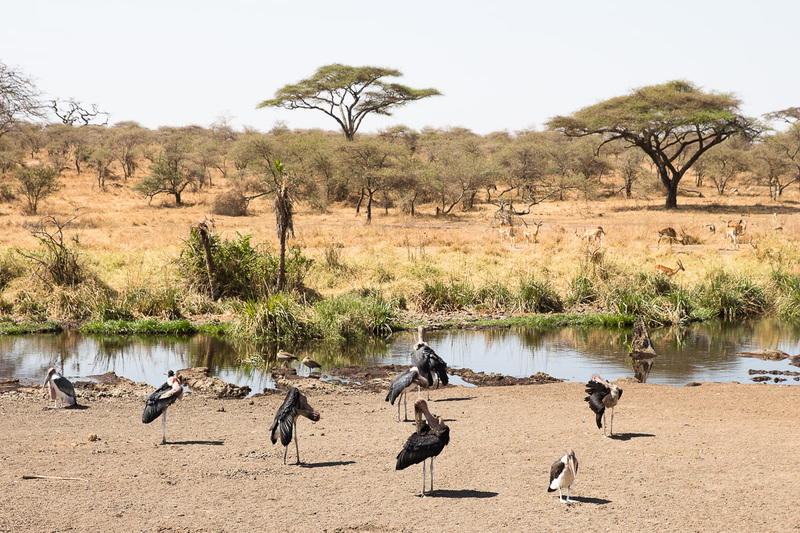 We were able to walk on the plains to the lake and saw some flamingos and fishermen in the distance. 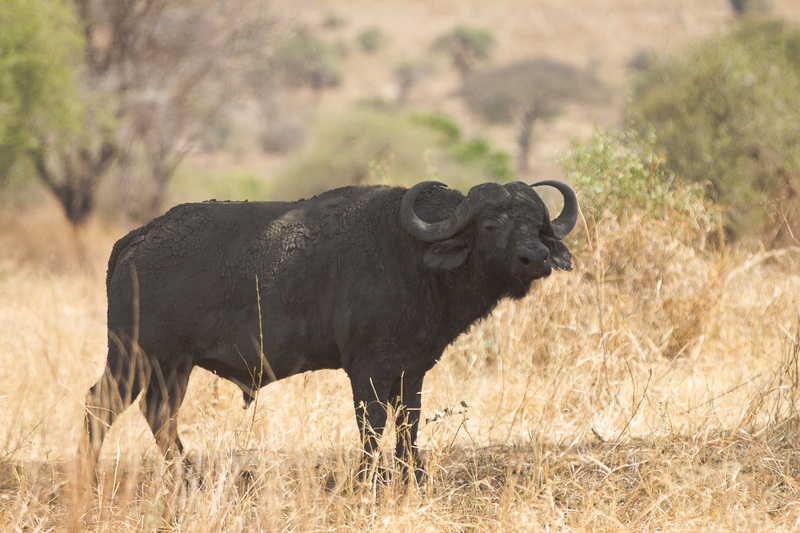 We passed ostrich, zebra, and wildebeest on our way (note: these animals are quite shy so you can walk right next to them without fear for your life). 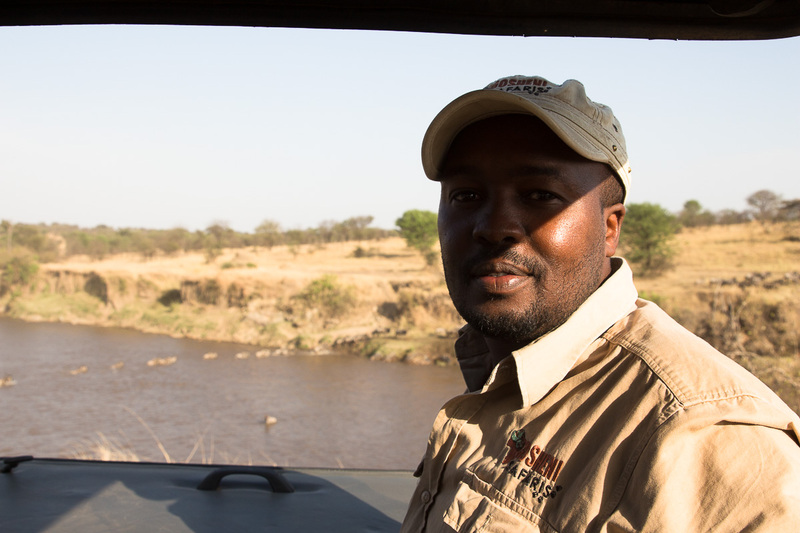 Highlight: our spear holding Maasai guide explained the difference between zebra and wildebeest poop. 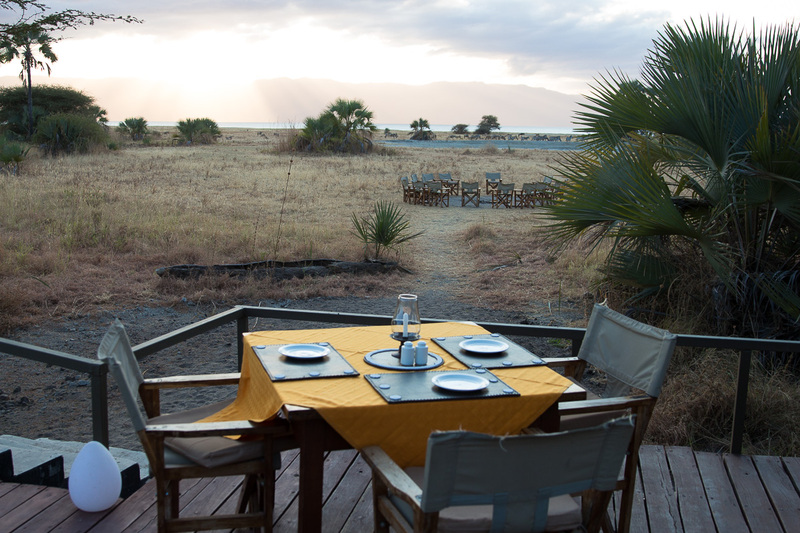 Lake Manyara is alkaline so animals cannot drink out of it, but is the ideal environment for tilapia and catfish. Breakfast was good, served with fresh coffee from their local plantation. 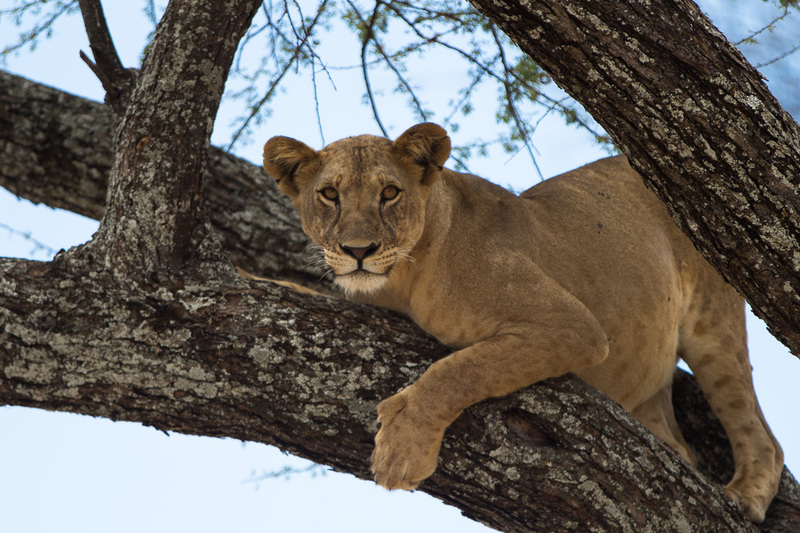 Then we drove back to Tarangire National Park where we saw a lioness chilling in a tree! Wowsers! 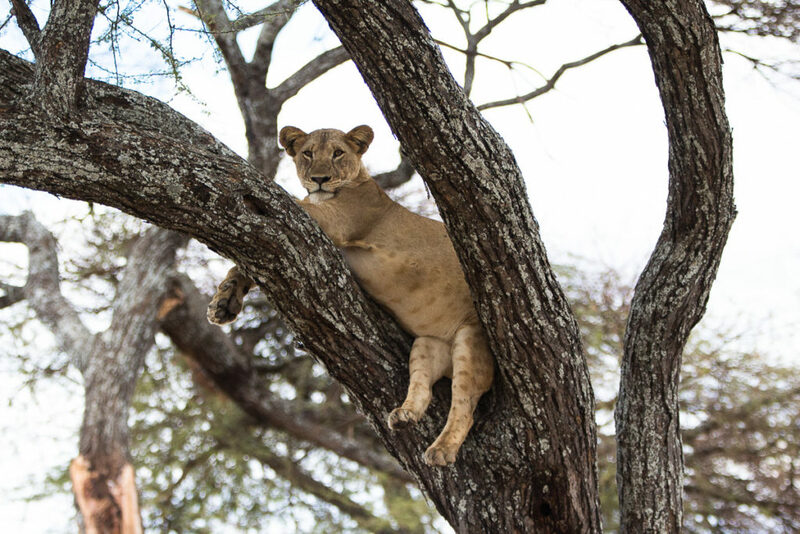 Lions in a tree are not common and 45 minutes later we watched her jump down, cross the road, and run off into the hills later to reunite with her friend, who suddenly appeared out of nowhere! 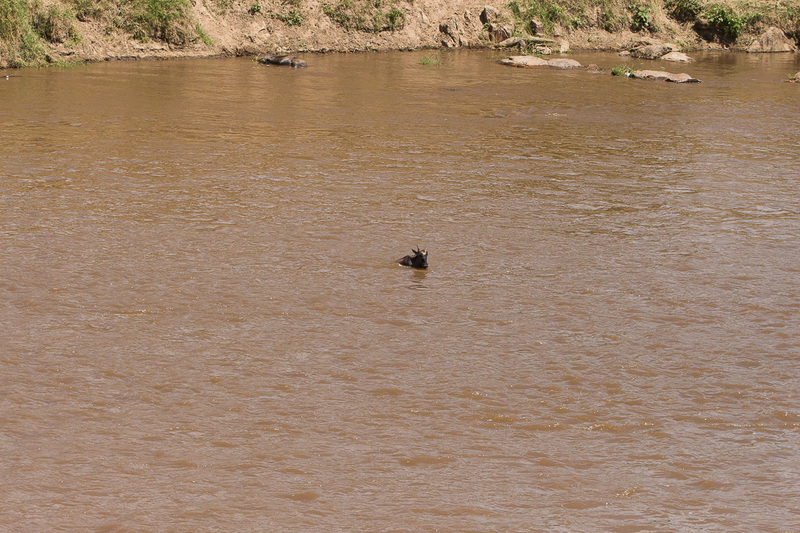 We also saw a giraffe up close and a pod of elephants playing in the river. 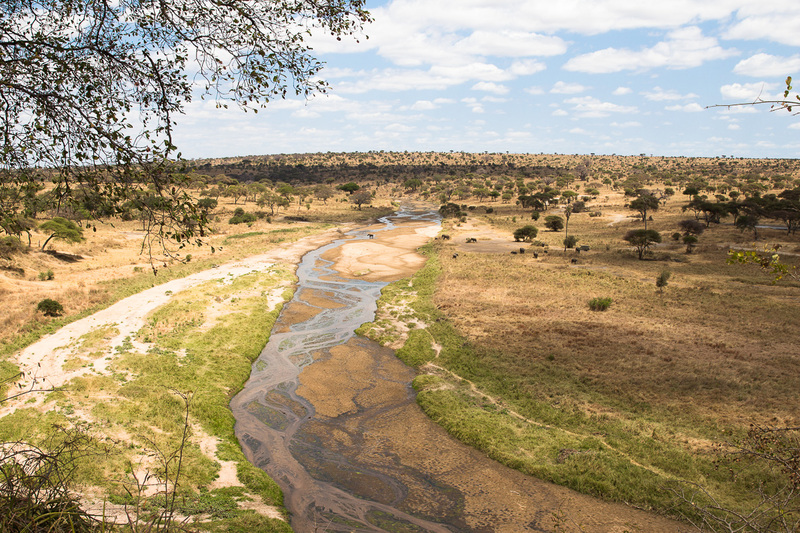 We stopped for lunch at the same picnic site overlooking the Tarangire River valley. 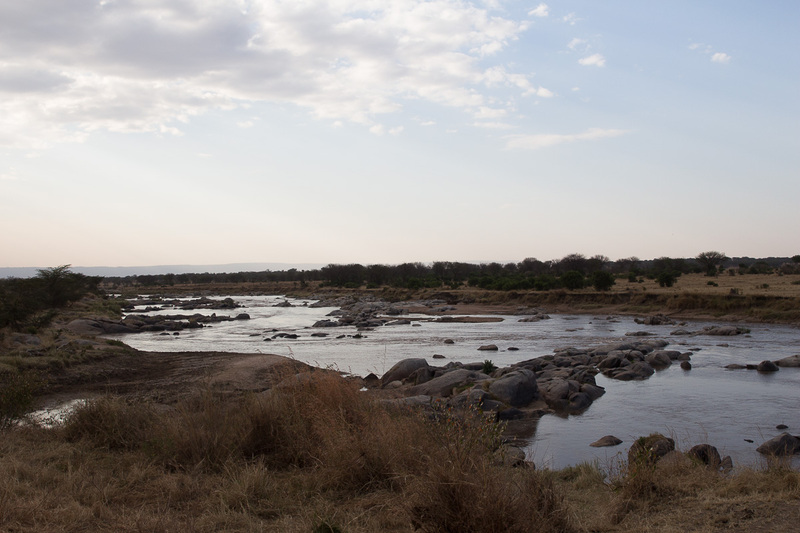 After lunch, we drove down to the Tarangire River. 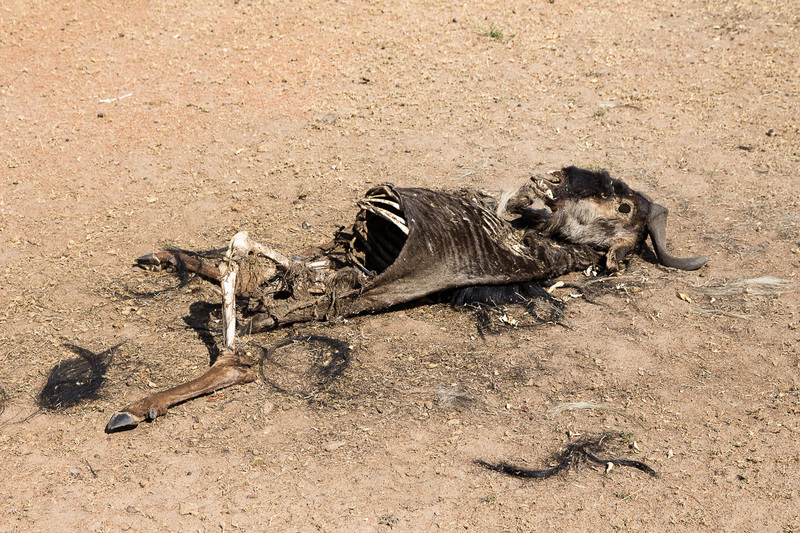 The riverbank was empty since it was so hot. 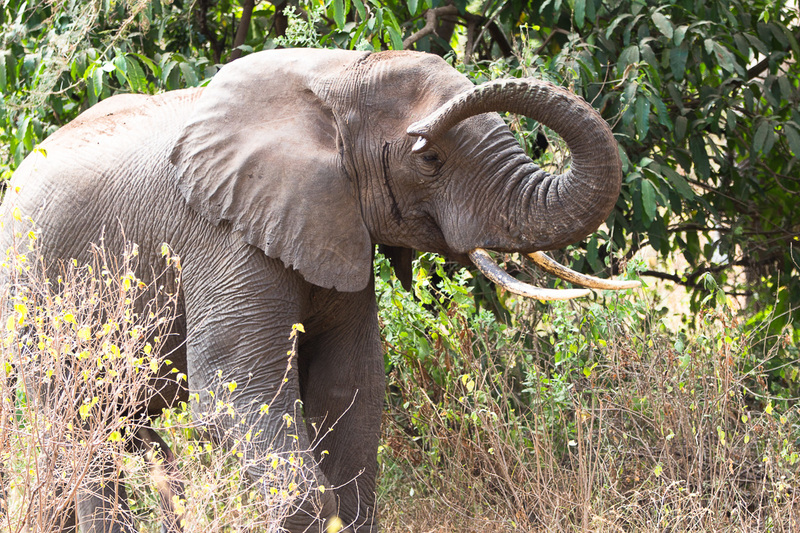 All of a sudden, we saw several elephants approach from behind us. 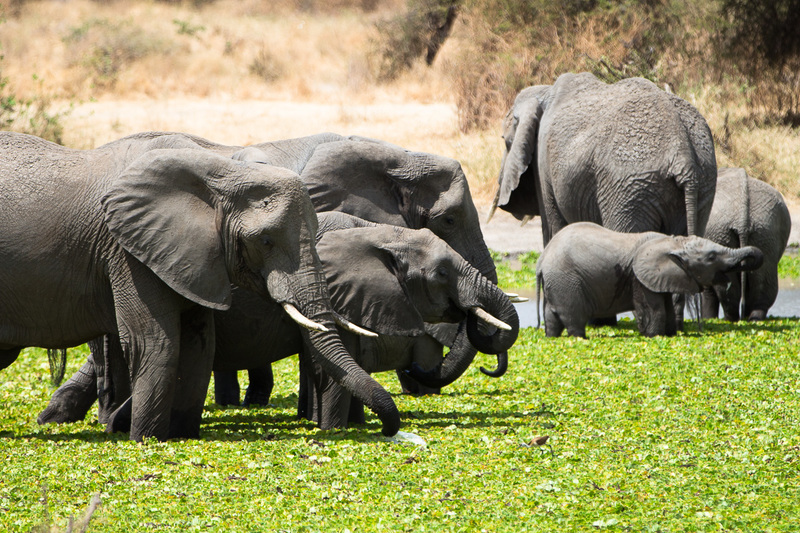 Within a matter of minutes, a large parade of elephants of all sizes were filing one by one down to the river that was several meters away from us. 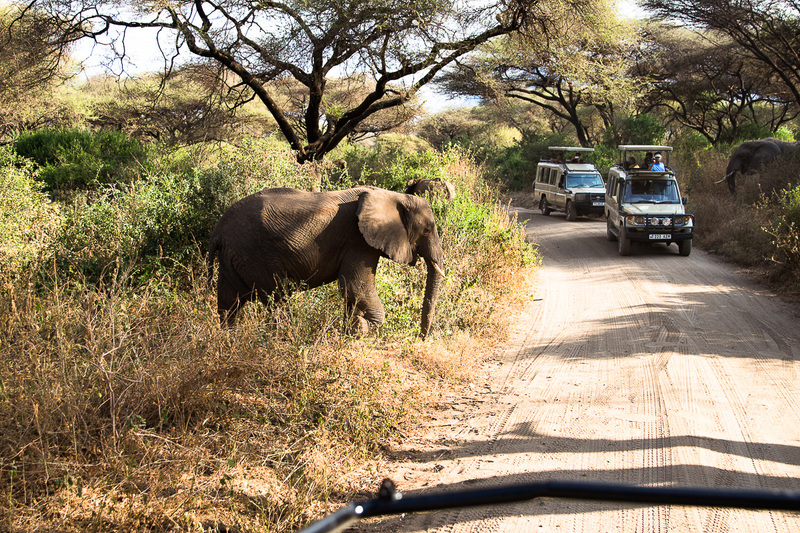 There must have been 30+ elephants that passed right by our jeep. 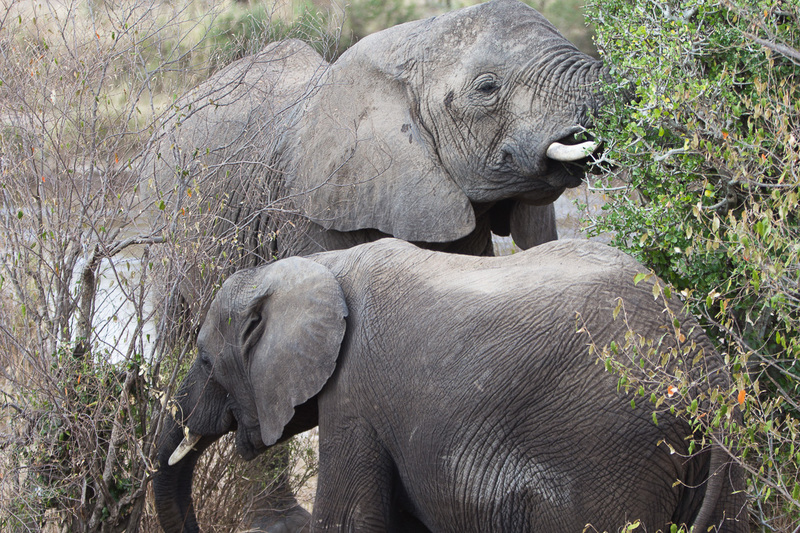 The little tiny baby elephants were so adorable! I just wanted to take one home with me! 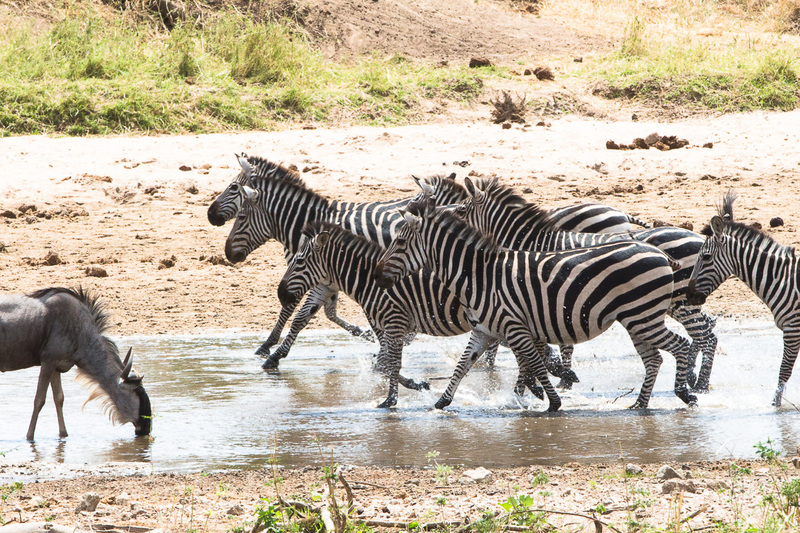 As soon as the last elephant made its way into the river, a large herd of 50+ zebras came parading single file down to the river too! 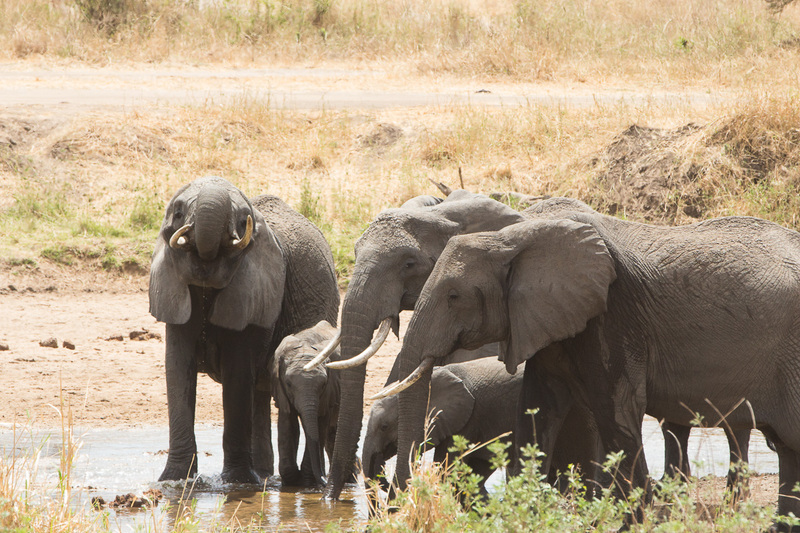 It was such a spectacle to watch as each species took their turn to come down for their afternoon drink. 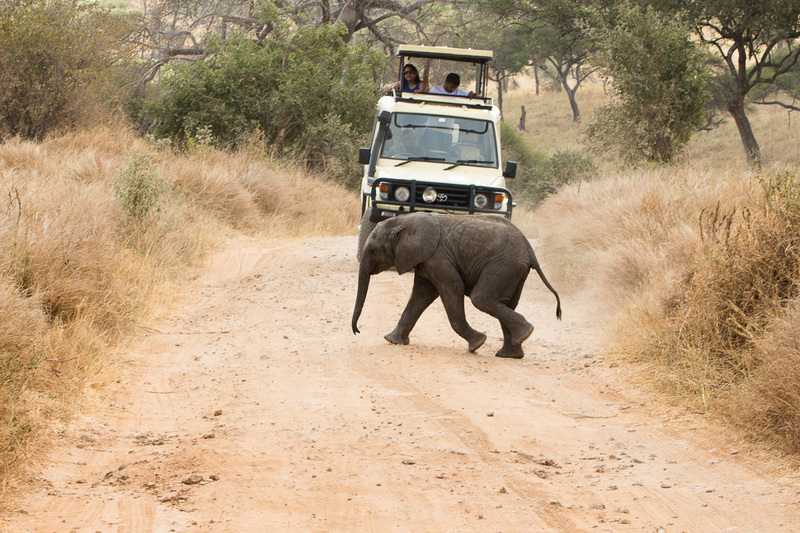 After our exciting afternoon, we drove further into the park and saw many more elephants, giraffes, and another lion. 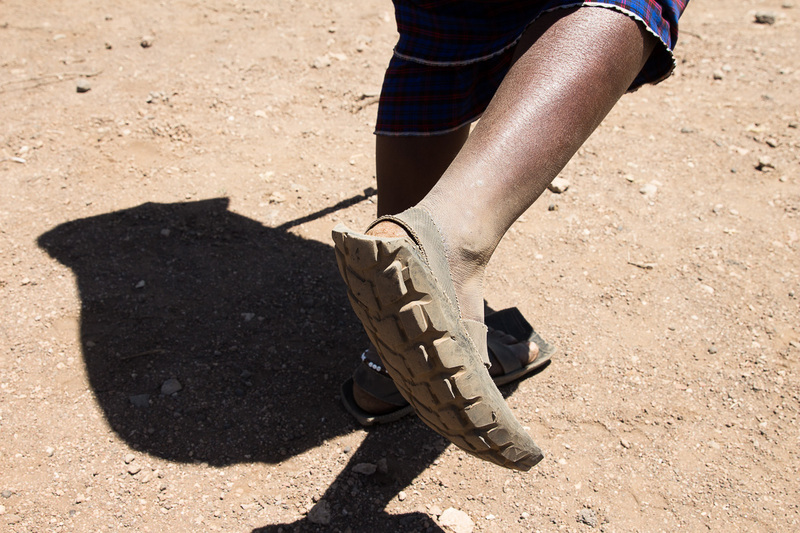 A tsetse fly bit my hand today and a mosquito bit my foot last night. 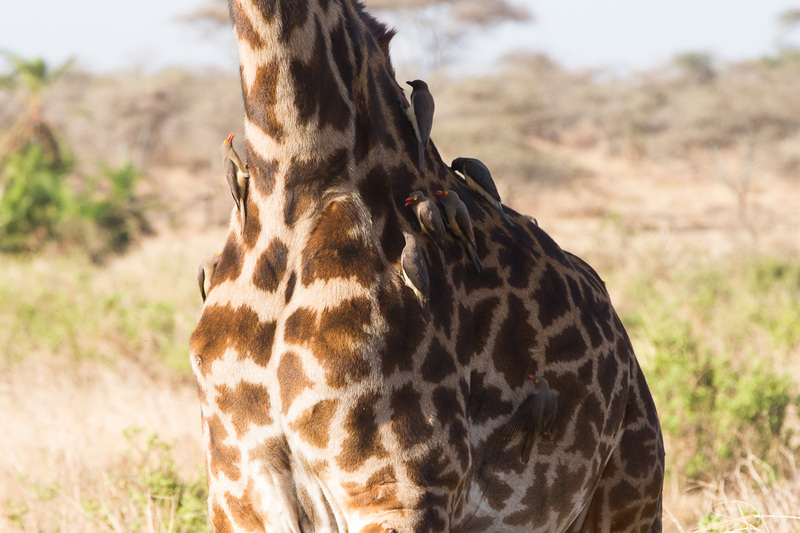 Tsetse fly bites are super itchy. 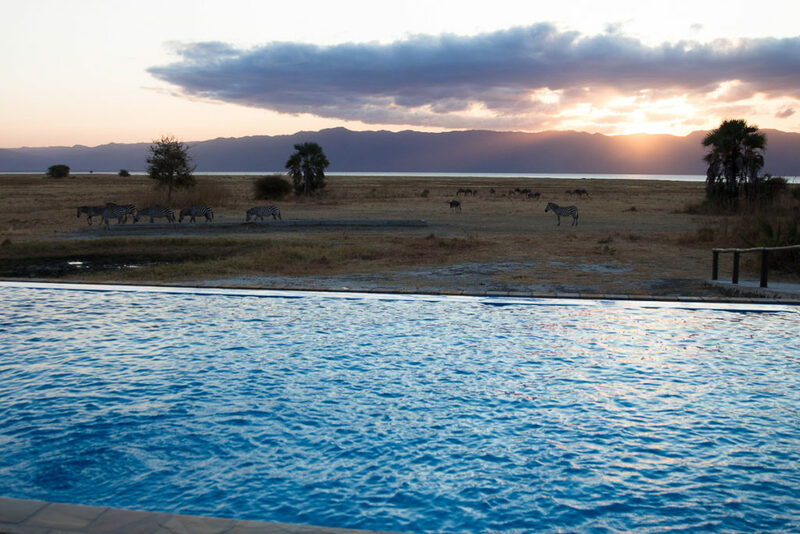 The Sopa Lodge situated at the top of the Ngorongoro Crater was so beautiful, but we missed the coveted sunset from the crater rim. Doh. Rooms are large, though a bit older. It was chilly outside, so good thing we brought our down jackets (elevation is high so no mosquitoes but very cold)! The buffet dinner was generous and served in a large rotunda. We had a table next to the window. After dinner, we went outside to take some long exposure night photos. We also hand washed some laundry in the sink. 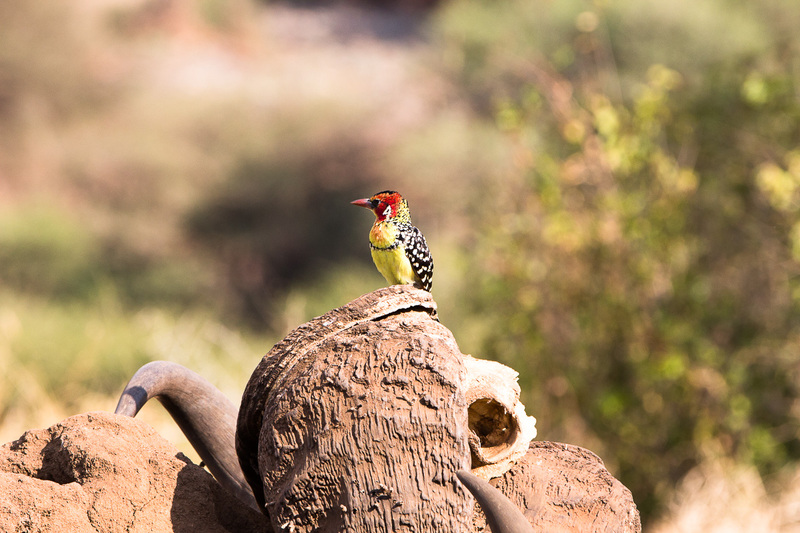 Note: Wish we got to the Sopa lodge a bit earlier, but overall it worked out, because we got to see more animals at Tarangire. 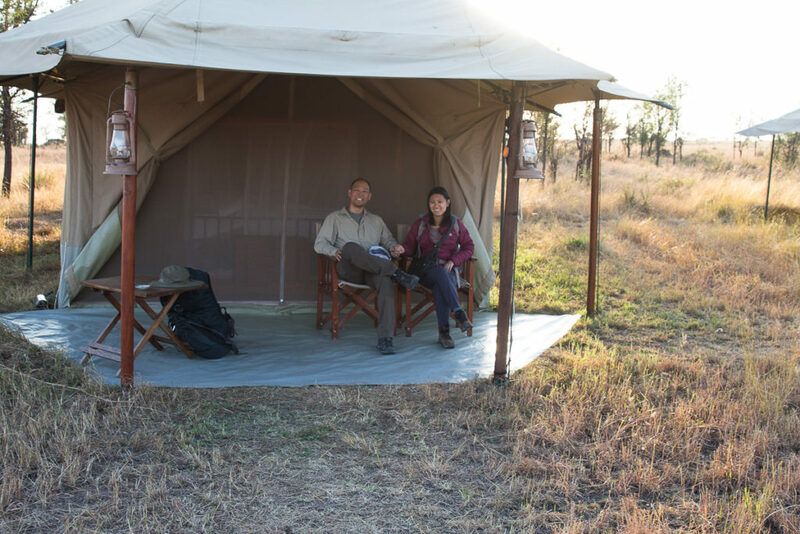 At 5:30AM, we were abruptly woken by our alarm and quickly dressed for the Crater game drive. 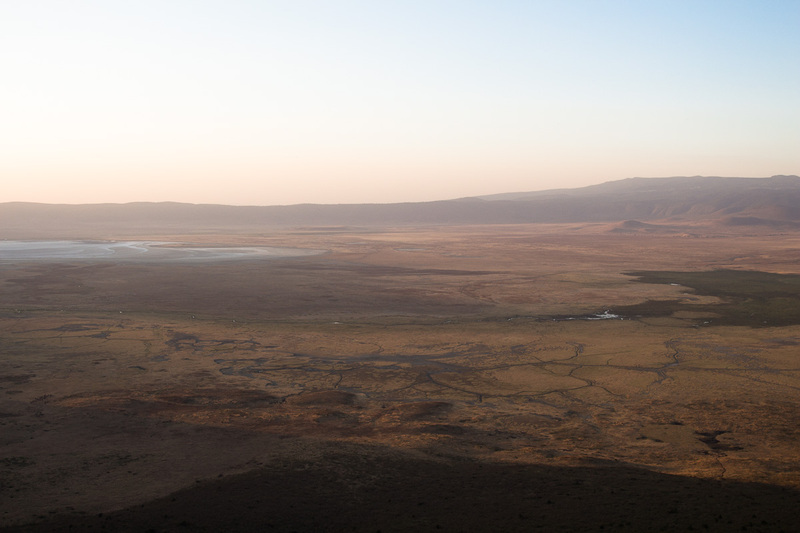 We were the first to arrive at the Crater gate at 6am sharp. What a beautiful crater! 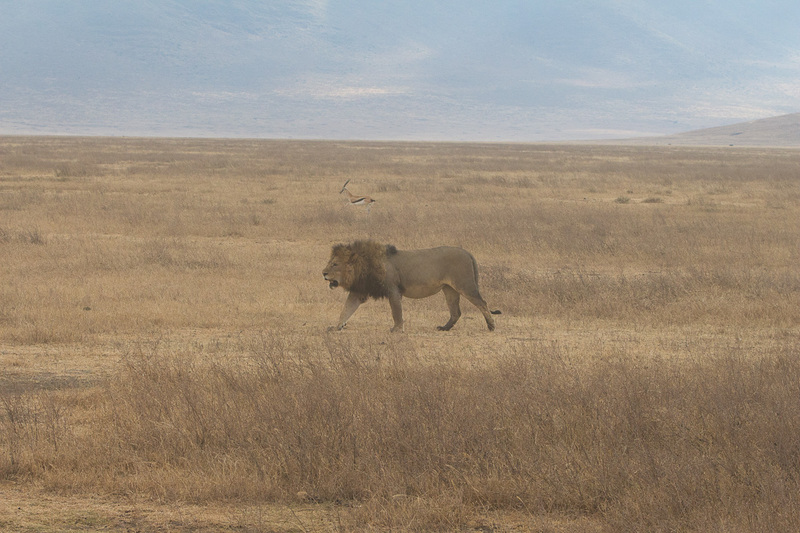 Ngorongoro is the world’s largest intact volcanic caldera and is 20kms wide and 600m deep. The crater is definitely a must-see in Tanzania! 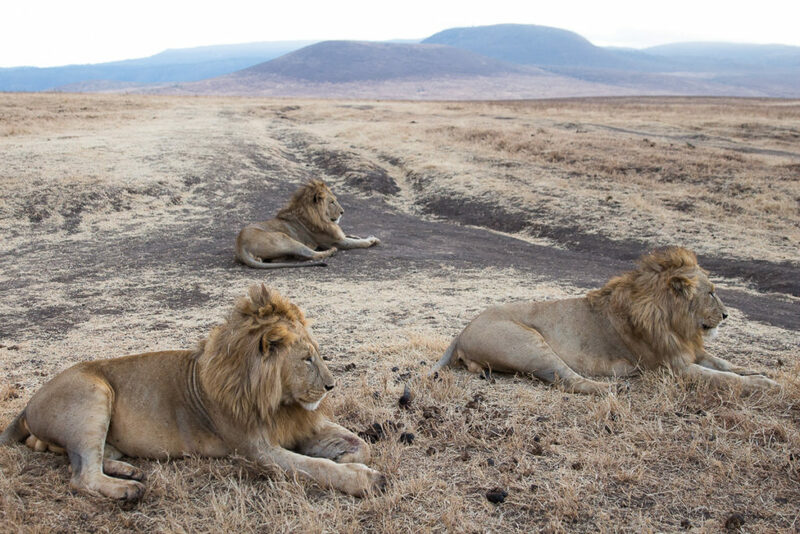 Because we were first to the gate (thanks to the wise insight by my wife), we spotted a large pride of male lions lying right next to the road! We got to enjoy them close up and personal. 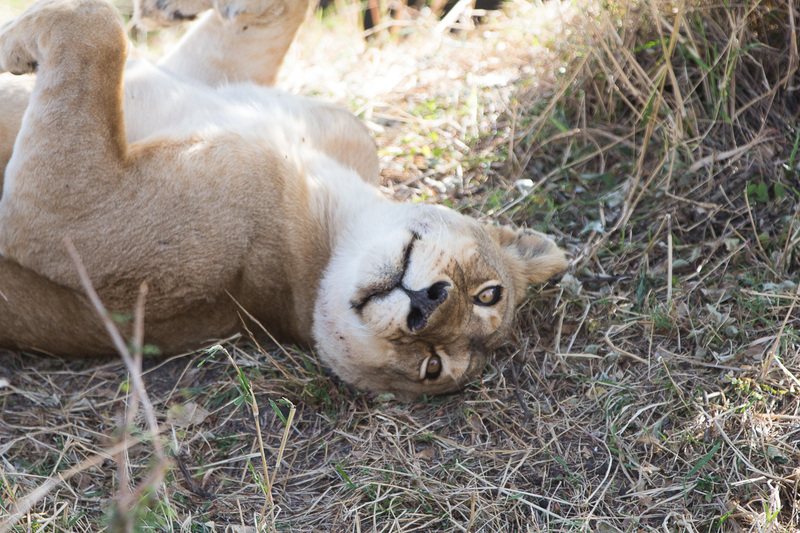 What an experience, we were so close we could reach out our hands to pet them! 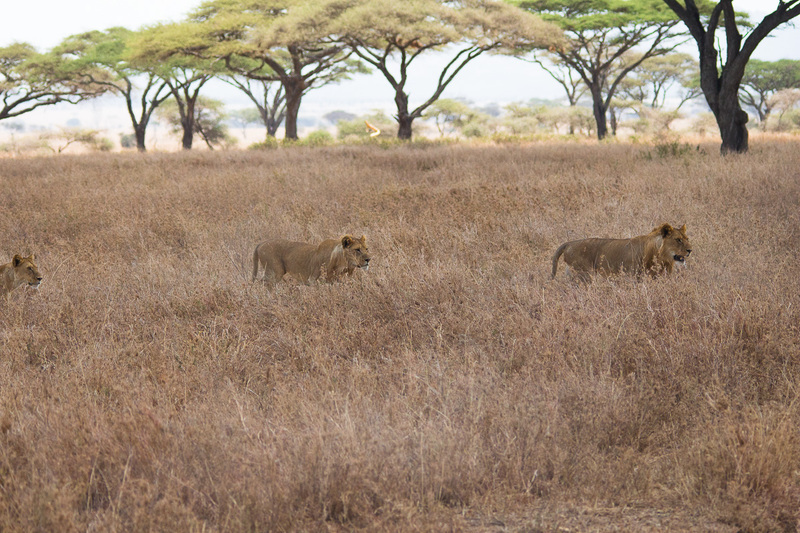 We took a gratuitous amount of pictures and had the lions all to ourselves for 30 minutes. 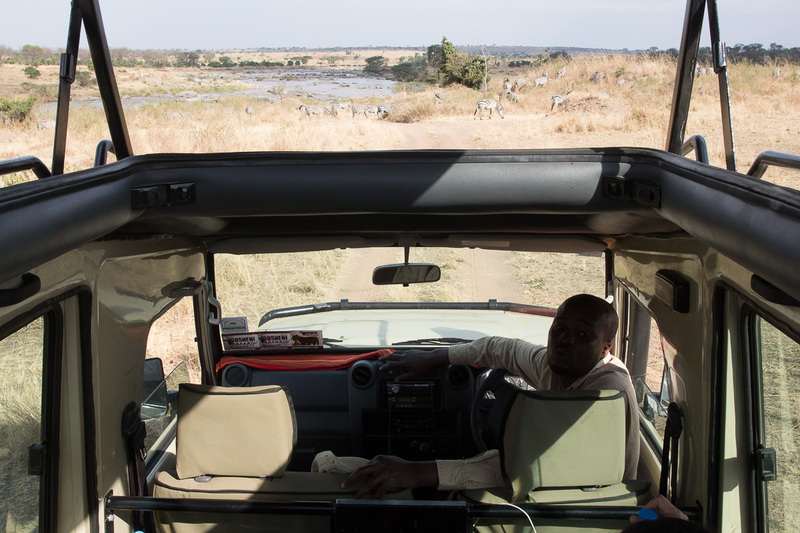 Zadoc was always considerate about giving other safari drivers time and not blocking their view. 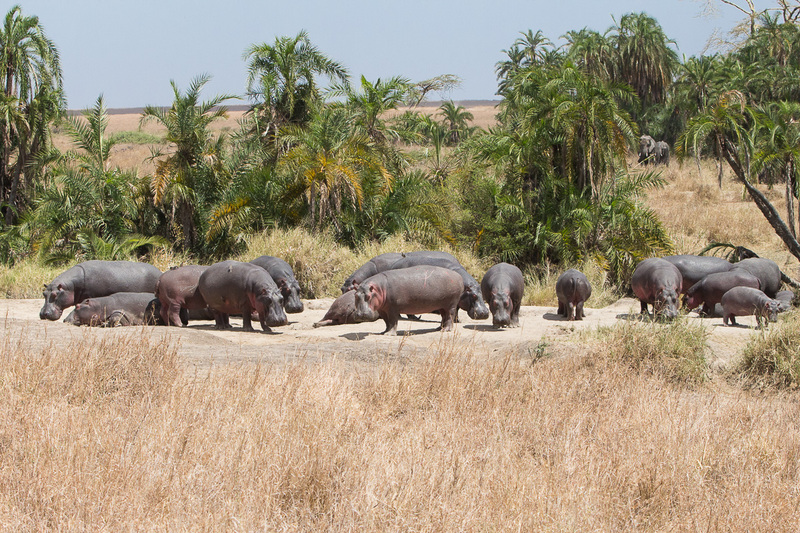 So after a few more safari trucks arrived, we left and drove around to see the hippo pool, zebras, buffalo, and wildebeests. 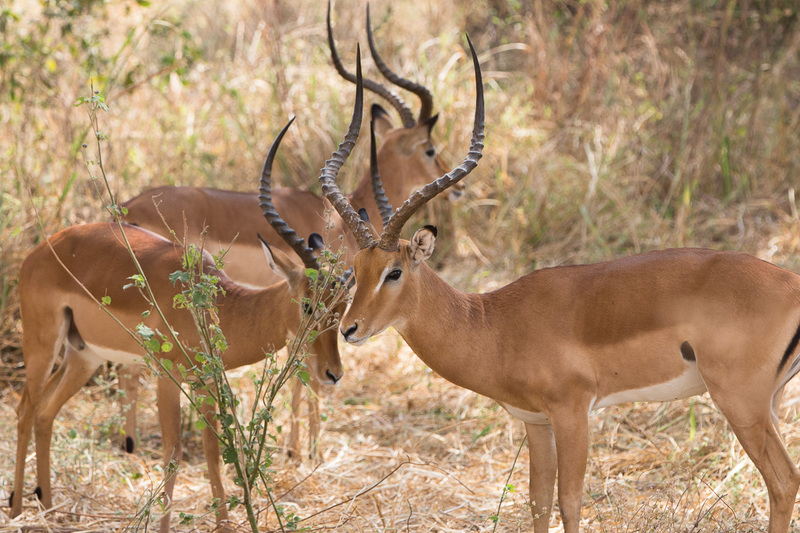 Thompson gazelles were everywhere. 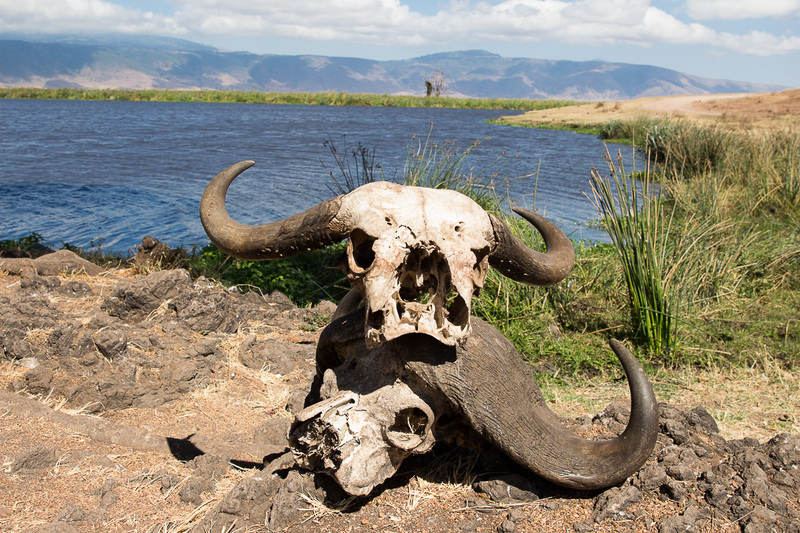 We stopped for breakfast by the lake and took photos with a wildebeest and water buffalo skull, which later became our Christmas card photo. 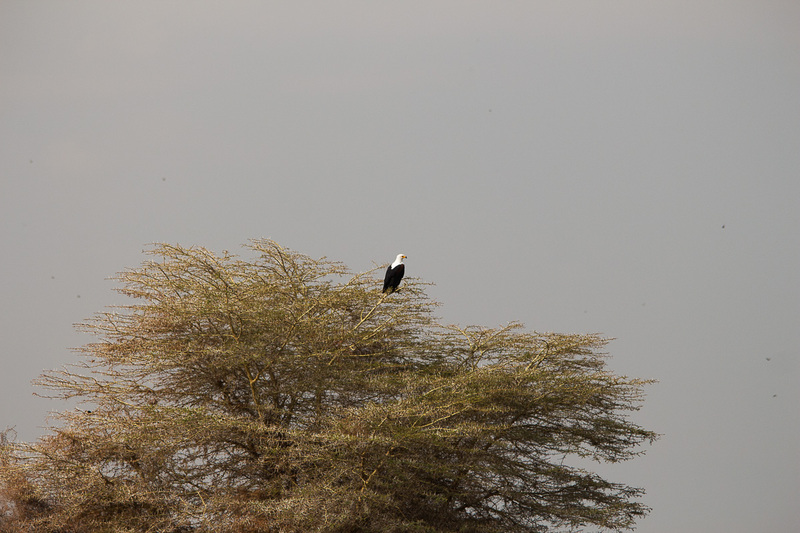 On the rest of our drive we spotted flamingos, hippos, ostrich, elephants, and a pair of lions walking along the road. 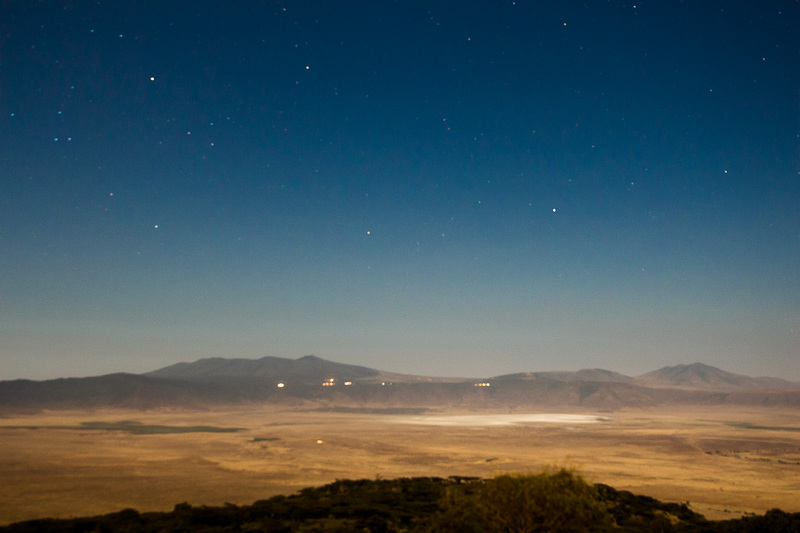 The Crater feels like an eerie fishbowl of sorts, but breathtaking nonetheless. 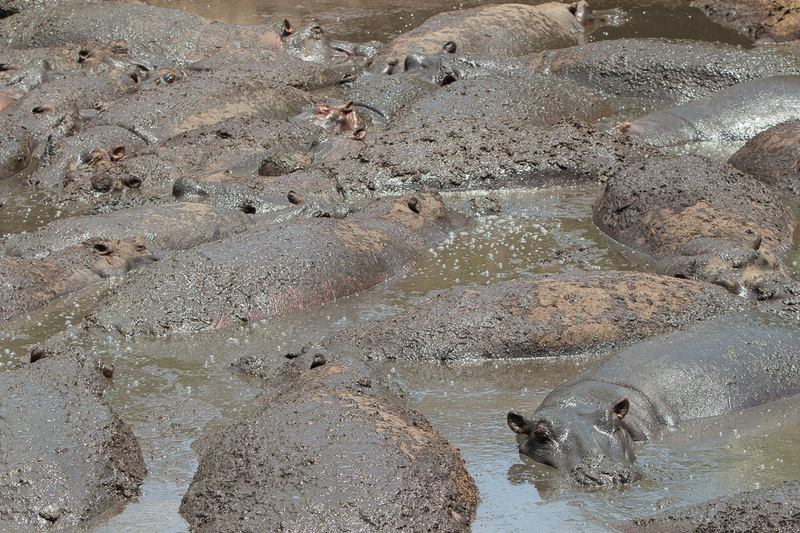 The animals are all stuck in the Crater! 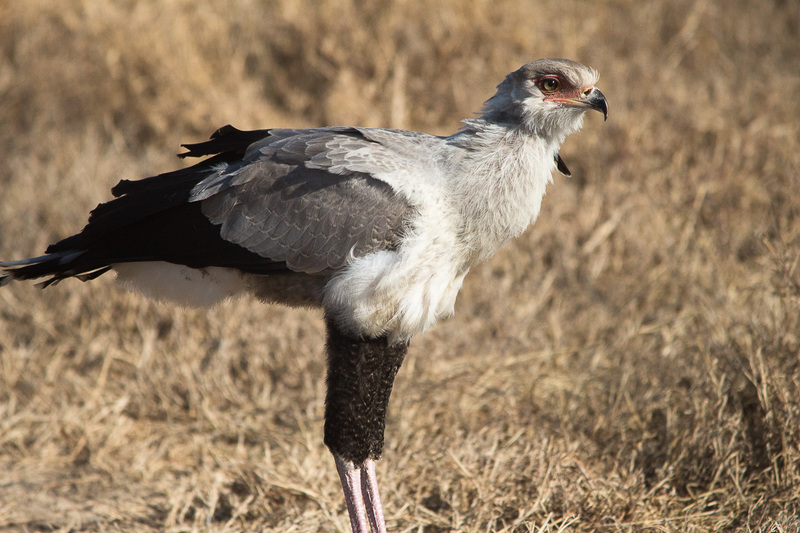 Zadoc mentioned that there is a lack of genetic diversity and problems with inbreeding. 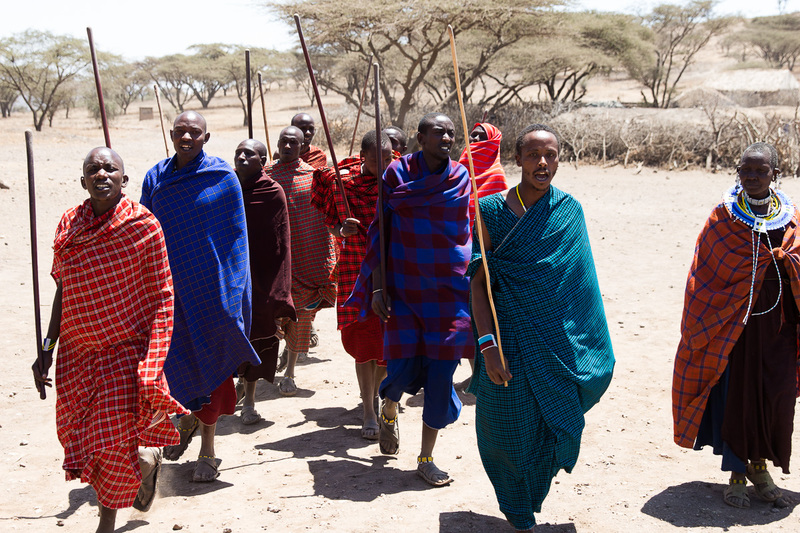 Massai villagers will roam around with their cattle herds in the Crater. The allotted 6 hours in the crater goes by very fast. 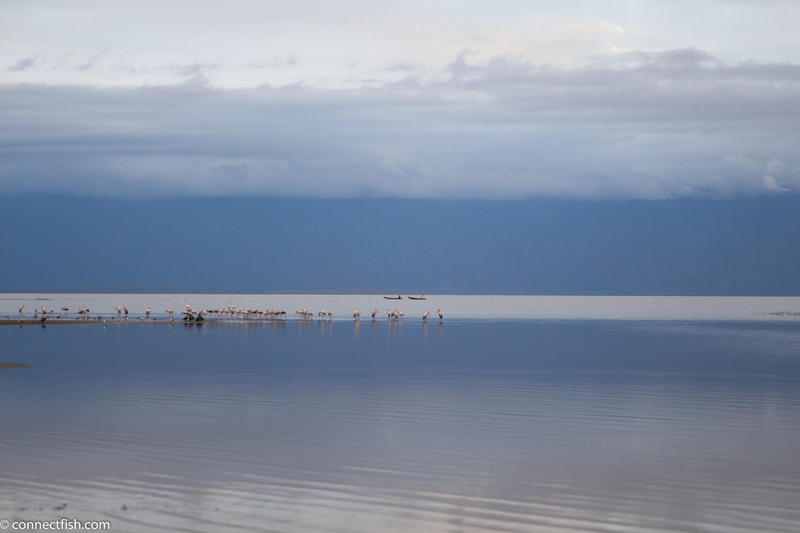 The lighting is best and animals are most active in the morning, so choose the AM permit. 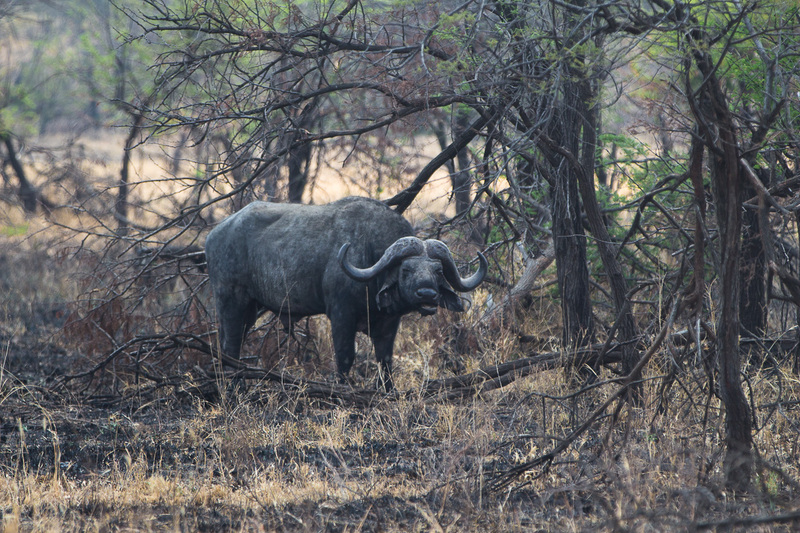 Unfortunately for us, the black rhinos were nowhere to be seen. Drats. 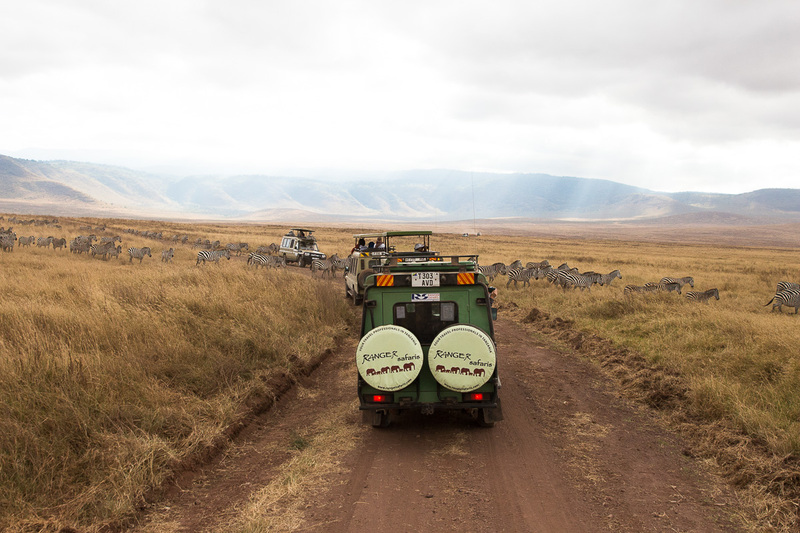 Our time was up at the Crater, and we drove for an hour to a Maasai village. It was a very cheesy tour, where they kept asking for donations and wanted us to buy their souvenirs. 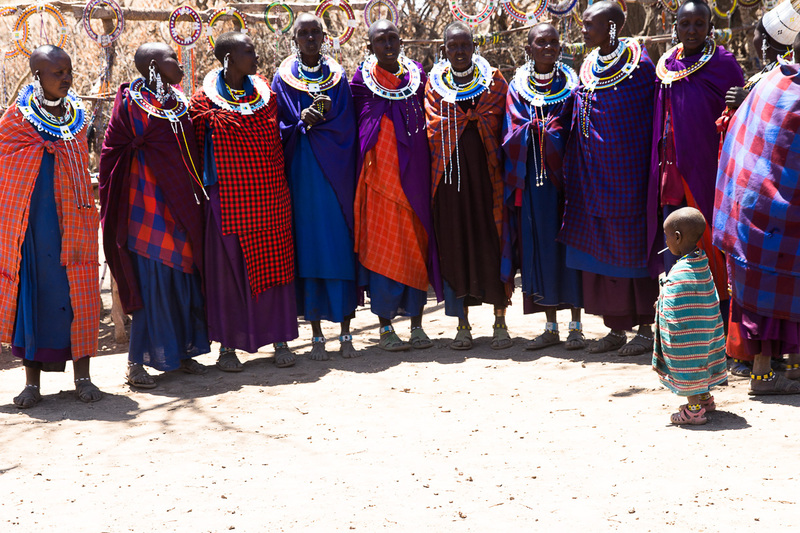 Their huts are made out of cow dung, and the people wear colorful clothing and jewelry. 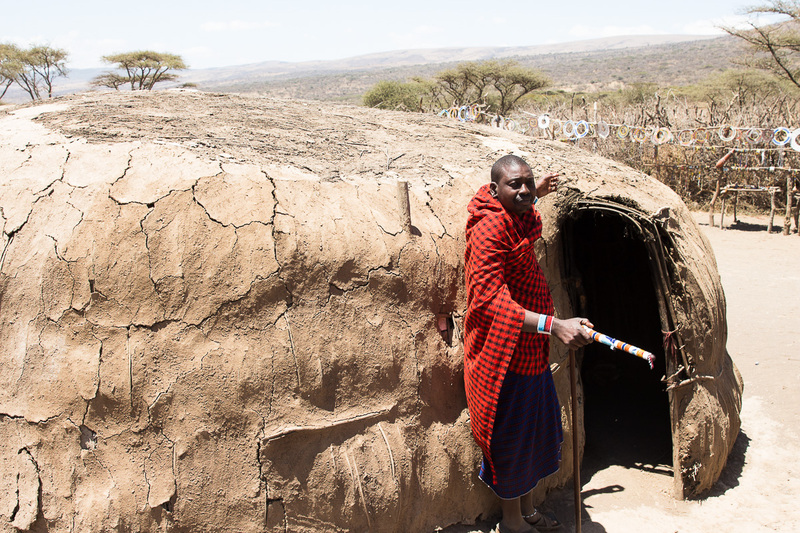 Supposedly many Maasai don’t actually live in the village and the children are made to sit in fake classrooms to hustle more money from tourists. We felt very uncomfortable and jammed outta there. 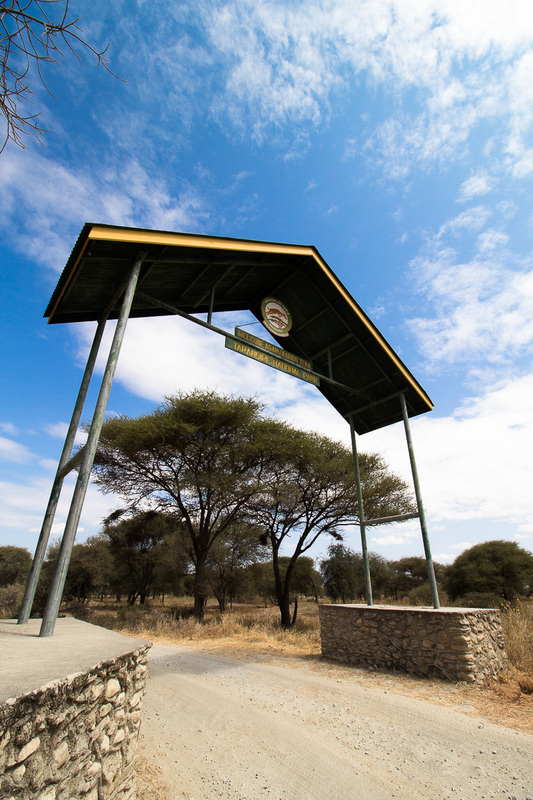 We survived the hot, one-hour drive @30mph to the Naabi Gate, entrance to the world-famous Serengeti! 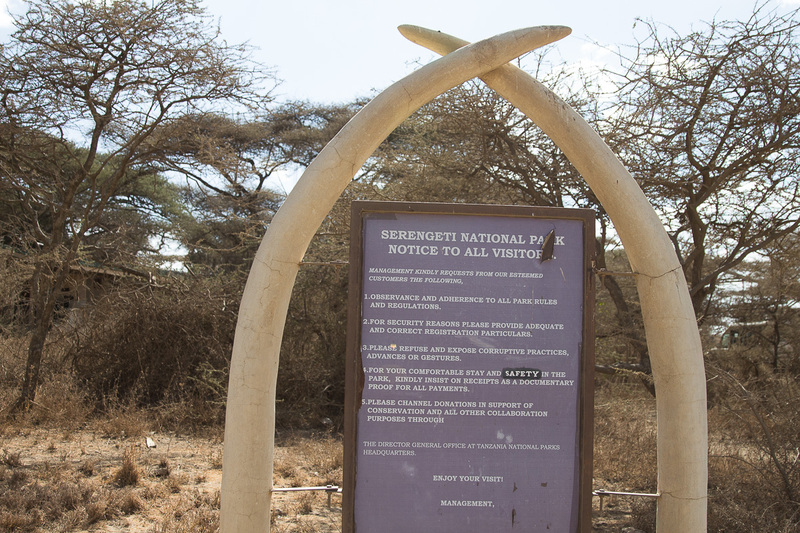 We ate our lunch boxes at the gate, then waited for 2.5 hours for Zadoc to obtain the permit to enter the park. 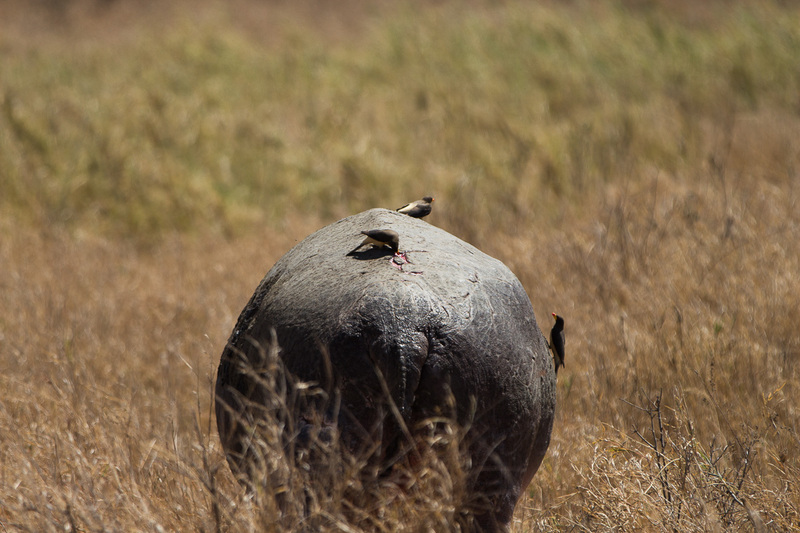 There was a small kopjies (huge granite rocks, think Pride Rock from The Lion King) that we hiked up to for a fantastic view of the Serengeti. 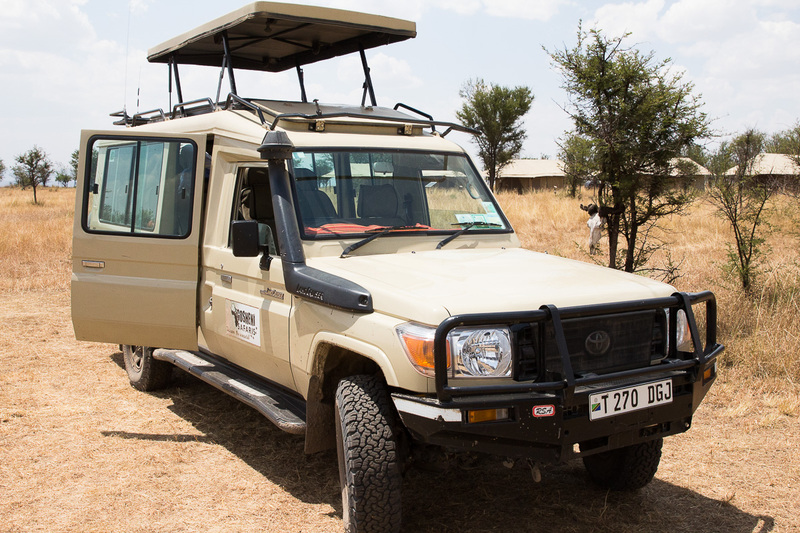 With the permit in hand, we entered the Serengeti and drove another 1.5 hours to the Acacia Camp, owned by Gosheni. No complaints, very kind staff, and good food. Anthony the chef is really friendly. They also served fresh coffee from the Maramboi plantation. 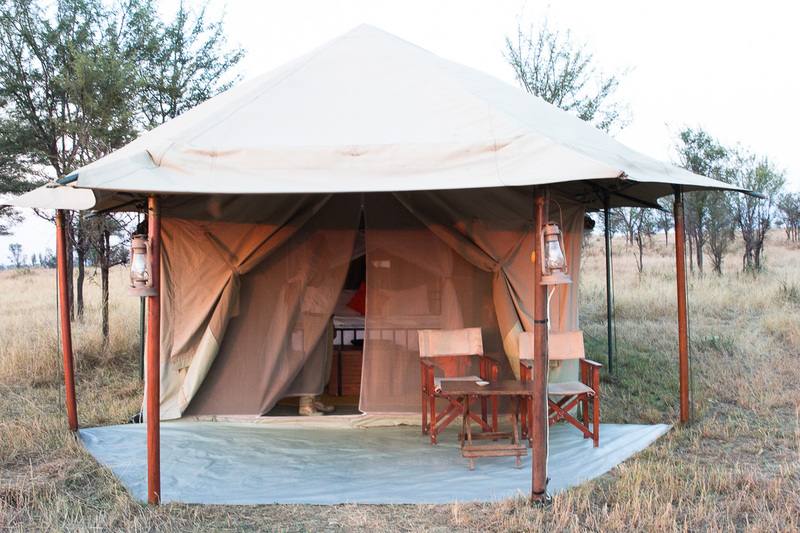 On the first night, we relaxed at the camp fire and kicked back some Safari beers and popcorn while swapping stories with other guests. 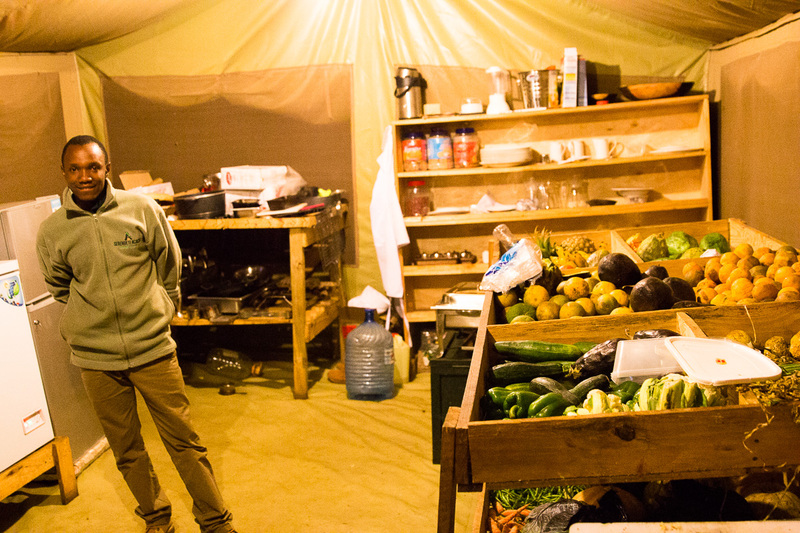 Peter, the owner of Gosheni, had driven all the way to the camp (he regularly checks in) with a surprise for us: all guests were being treated to a bush dinner tonight! 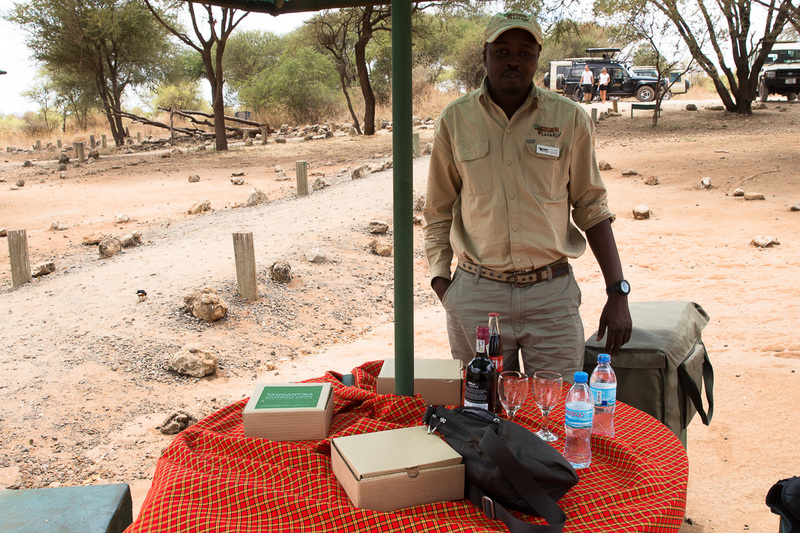 The staff set up tables in the middle of the wilderness, complete with tablecloth, wineglasses, and dinnerware. 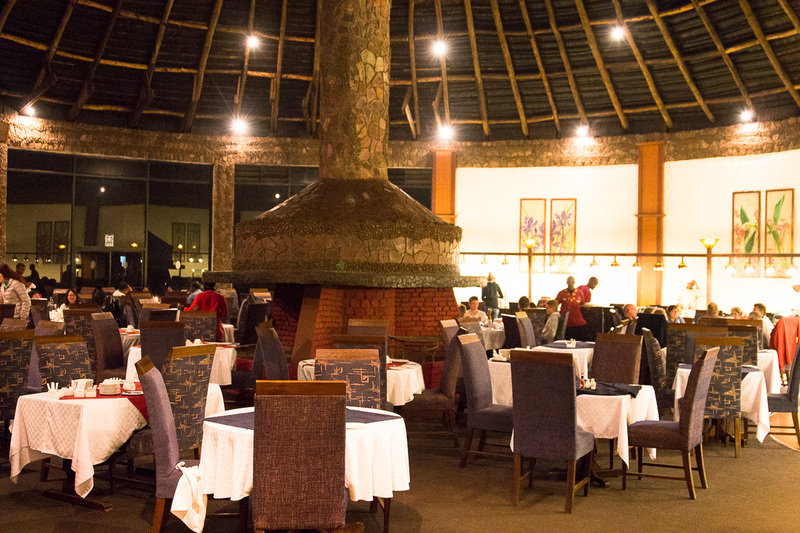 The dining area was surrounded by twinkling gas lanterns hanging from the trees, and it felt like a romantic scene straight out of an episode of the Bachelor (minus the camera crew). We wish we had better pictures to capture how special it was, and we highly, highly recommend a bush dinner for the amazing experience…when else are you going to dine under the stars of the Serengeti among all the animals?! Porters carrying our gear (Just the 2 backpacks on the left). Luxury! It was fairly chilly at night, but thankful because there were few bugs. Day time weather is like a nice warm day in LA. Breakfast was excellent. Sausage, coffee, eggs, tomato, and fresh hibiscus juice. 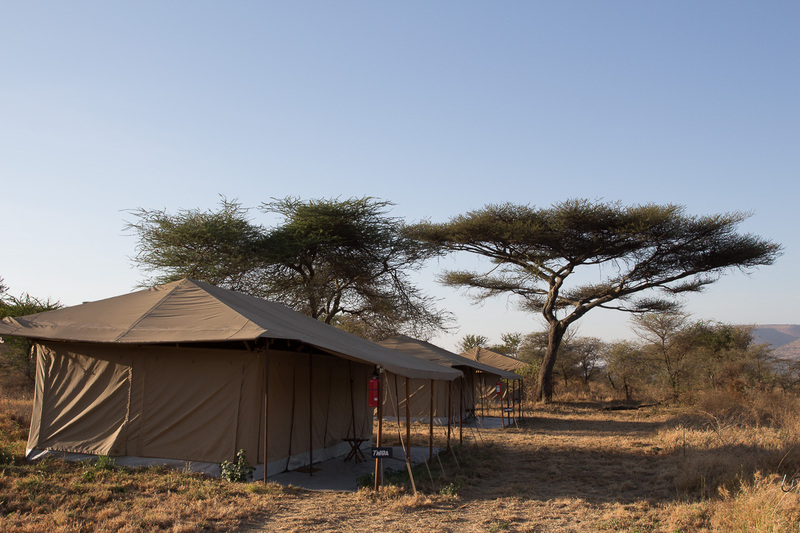 The Acacia camp staff are all very nice and attentive. 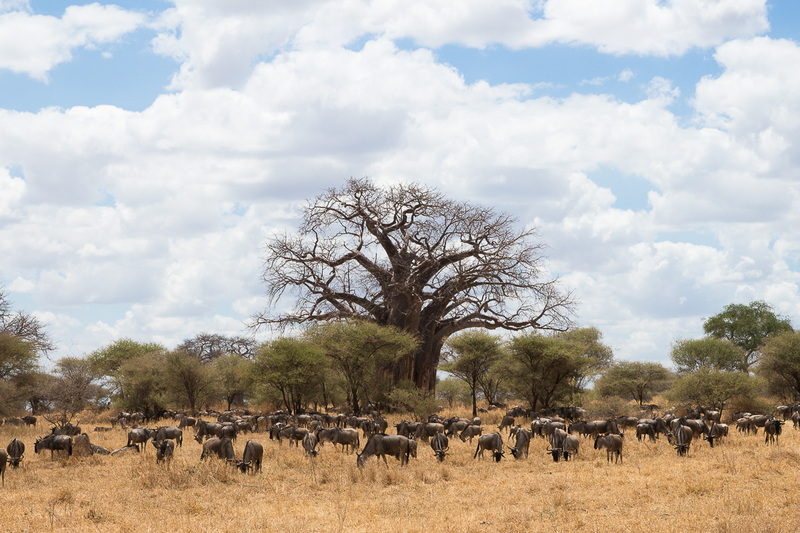 Note: Tsetse flies live around areas with trees, so prepare to quickly close the windows and pop top! 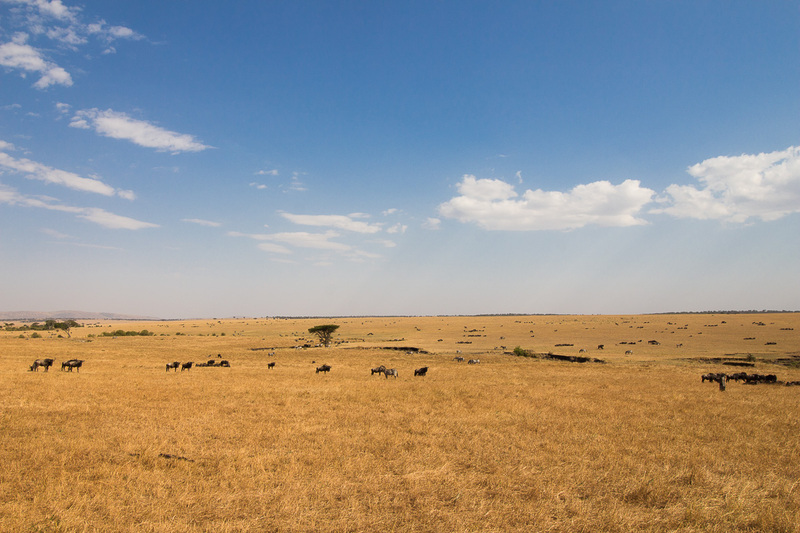 Once you are out on the Serengeti plains, we could open the top again. 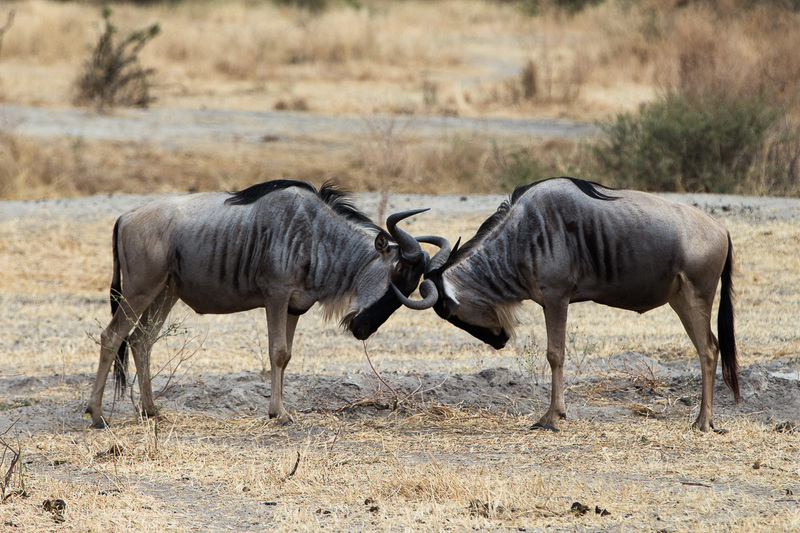 Tsetse flies are really tough little buggers. They will not die no matter how many times you hit them or step on them! 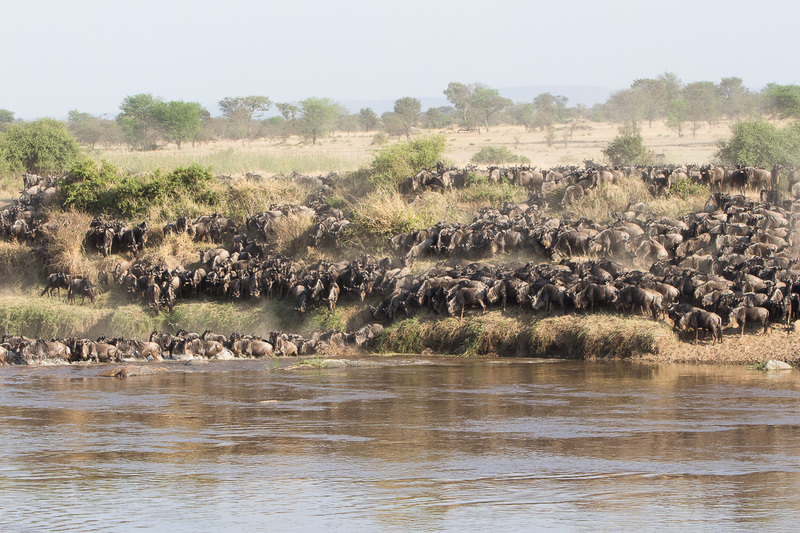 They also carry diseases, like the sleeping disease which almost wiped out the wildebeest population. 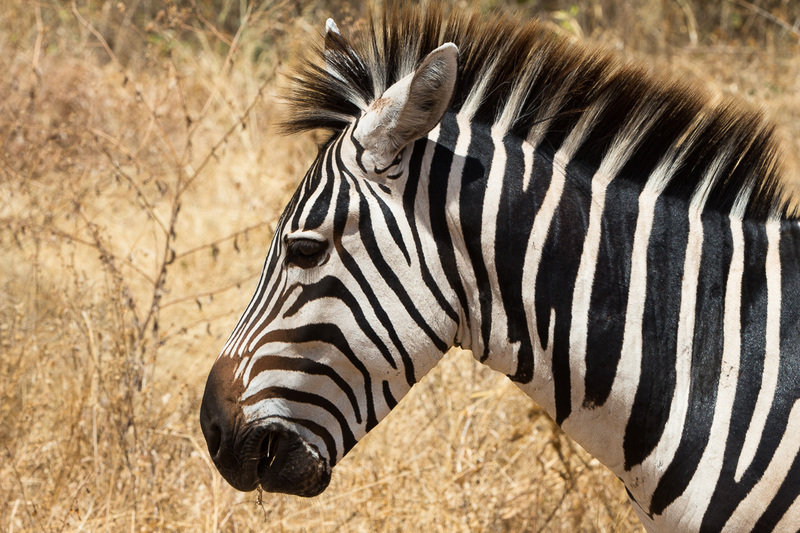 They are attracted to the color blue and black, so avoid those colors! 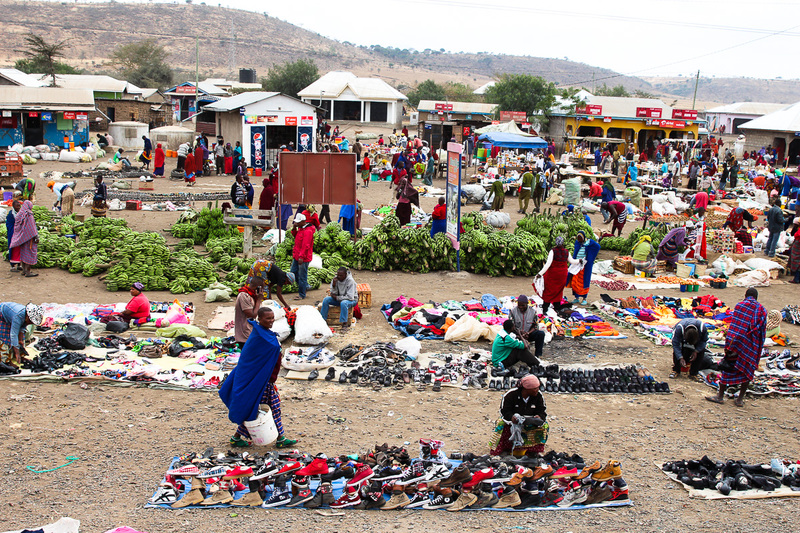 Camps will hang black and blue pieces of cloth to attract them away from tents. 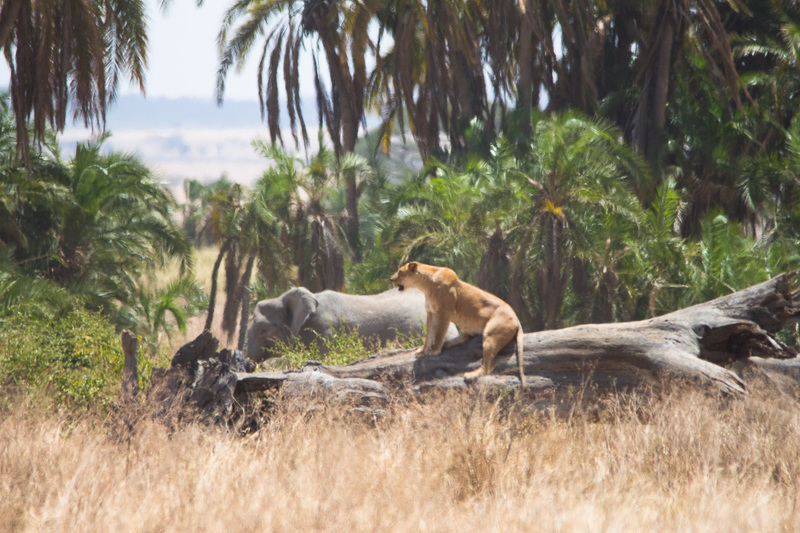 First sighting of the day was a Cheetah! 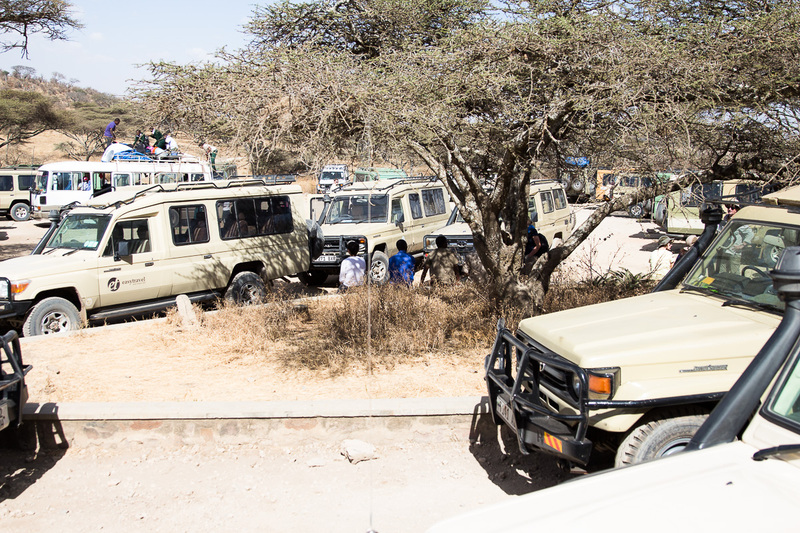 It’s actually easy to spot animals and action because hundreds (seemingly) of other safari tour vehicles are swarming around. 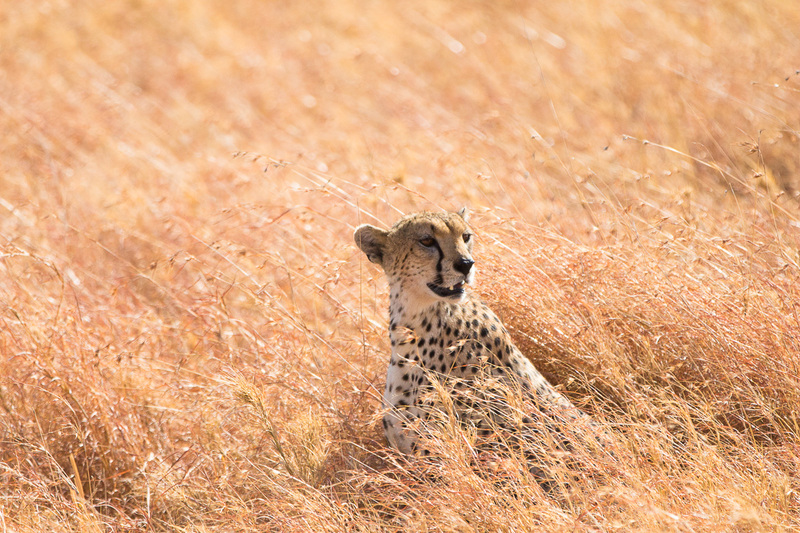 But anyway, it was so amazing to see the cheetah chilling in the tall yellow grass. 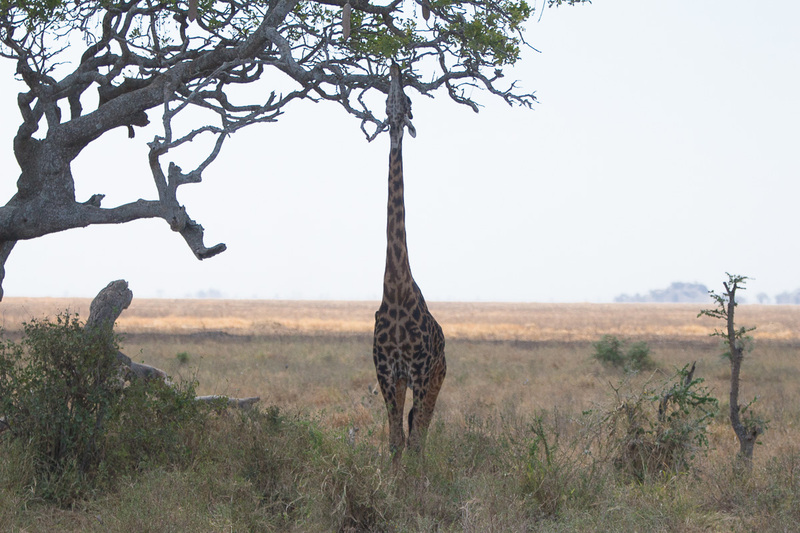 The camouflage blended it in perfectly to its environment, and when he lowered down to the ground it was impossible to even see him. 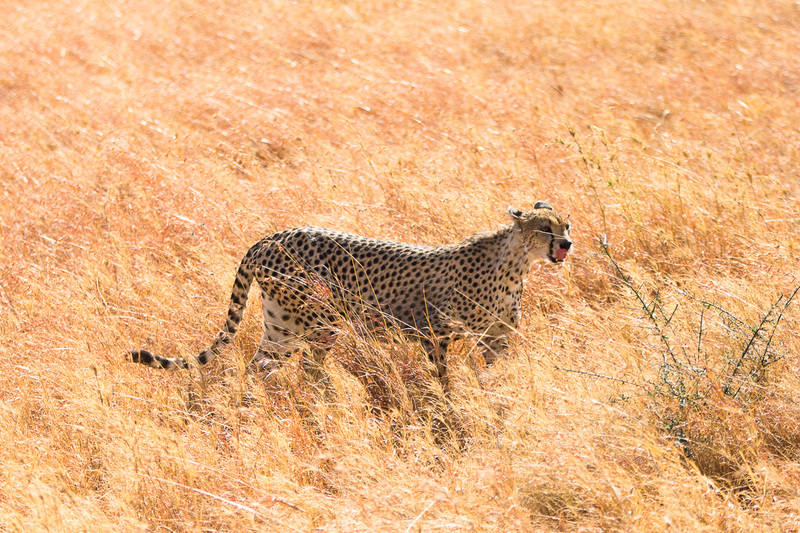 As we were watching, all of a sudden the cheetah turned in our direction and started running straight towards our jeep (out of all the other ones). 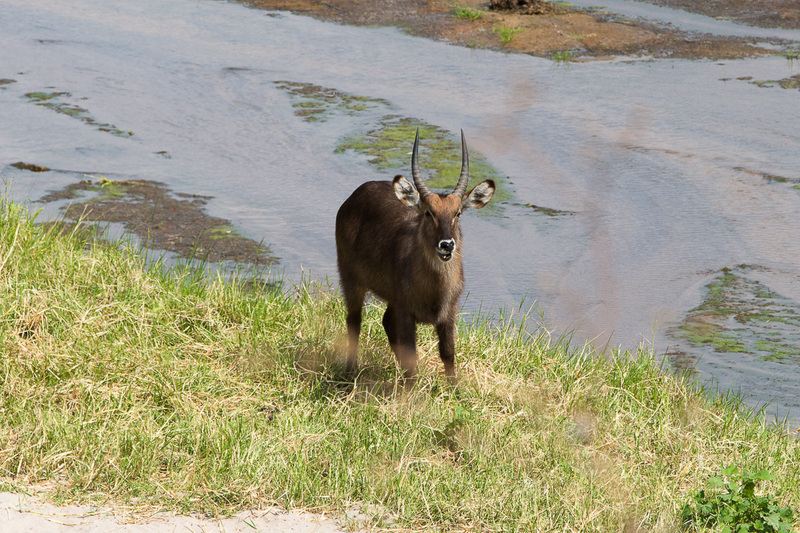 Just when it seemed like he was going to leap up and jump through our window, he quickly dodged left and ran around the back of our car to the other side of the road! The whole thing happened so quickly (and we froze in shock) that we didn’t have time to take a single picture. We both admitted we were scared and irrationally thought he would jump at us through the pop top roof. 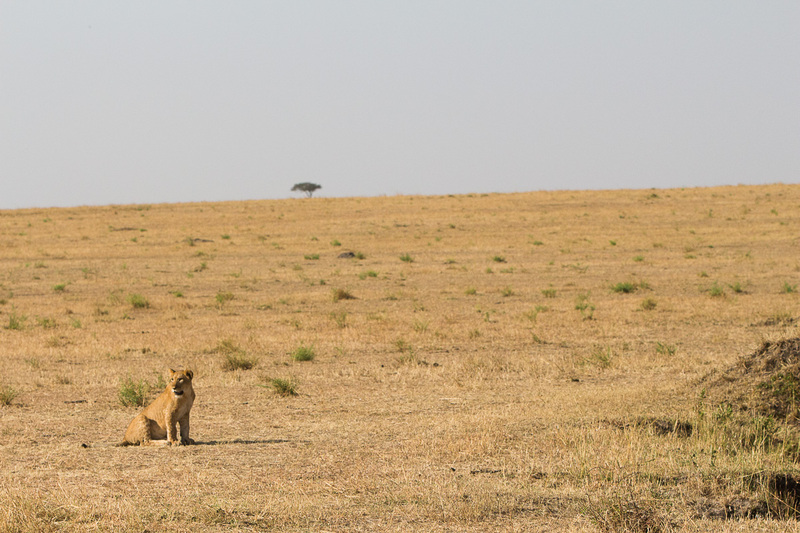 Just when we thought we had seen some cheetah action, an even bigger adventure was waiting to unfold. 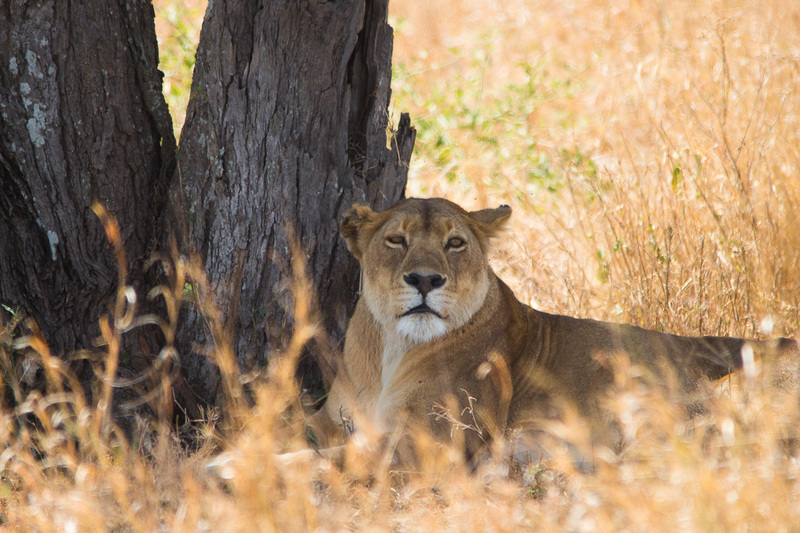 While driving, we spotted a lone lioness scanning for food on a fallen branch about 90 feet away from the road. 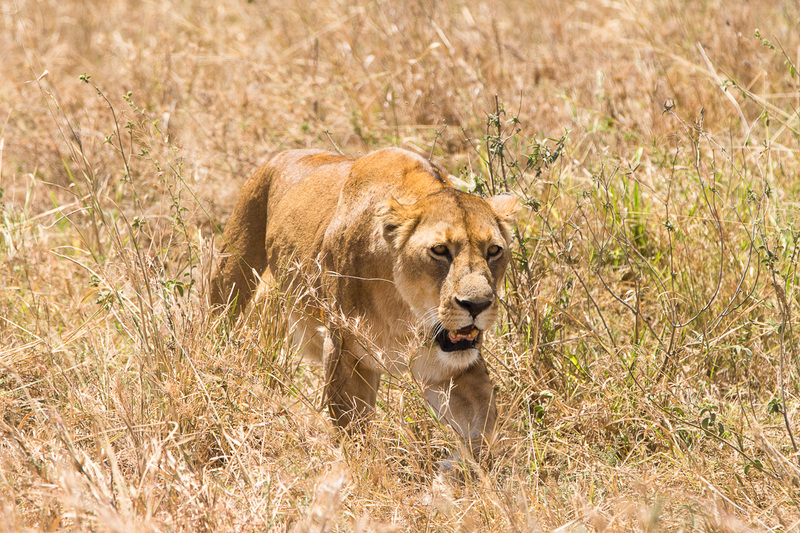 No, she wasn’t after the lone elephant (a single lion cannot take down that large of a prey). 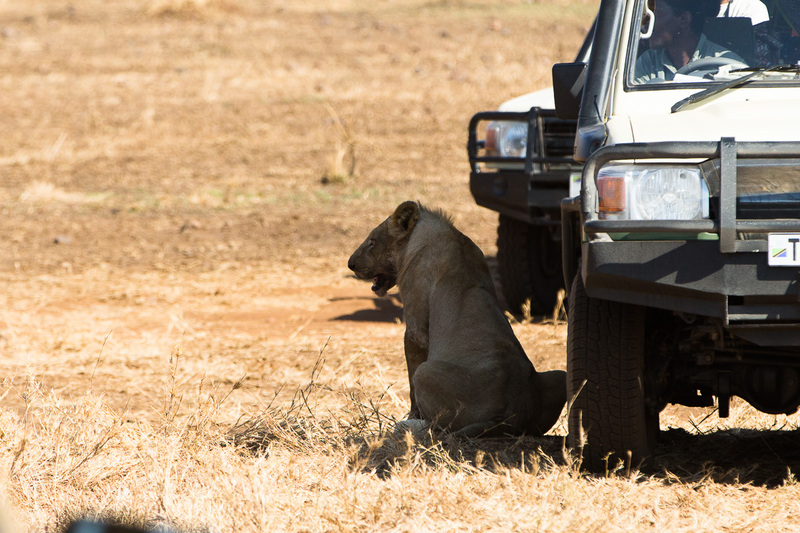 All the other jeeps drove away losing interest, but through the binoculars I could see her mouth open, hungry. 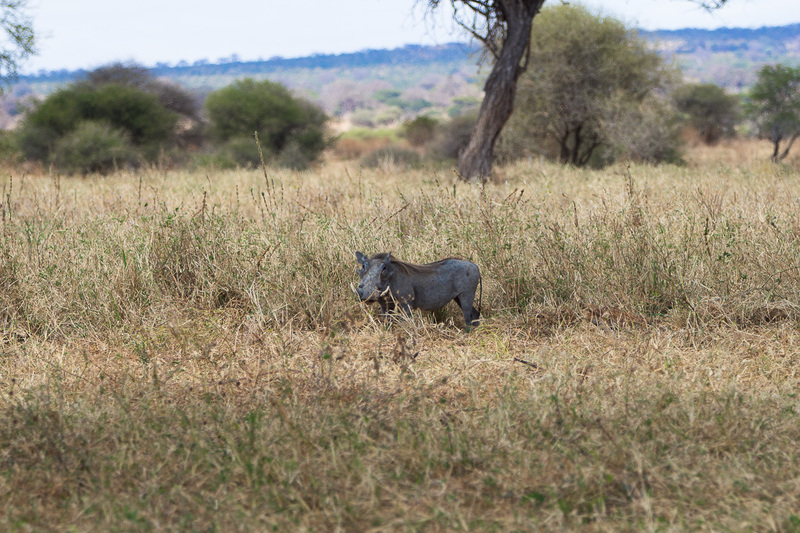 She finally found her target: a warthog. (I swear it felt like a cartoon scene when I saw her eyes stare with interest and followed them via binoculars to see an innocent warthog frolicking around) The lioness jumped off the log and started stalking her prey through the grass. 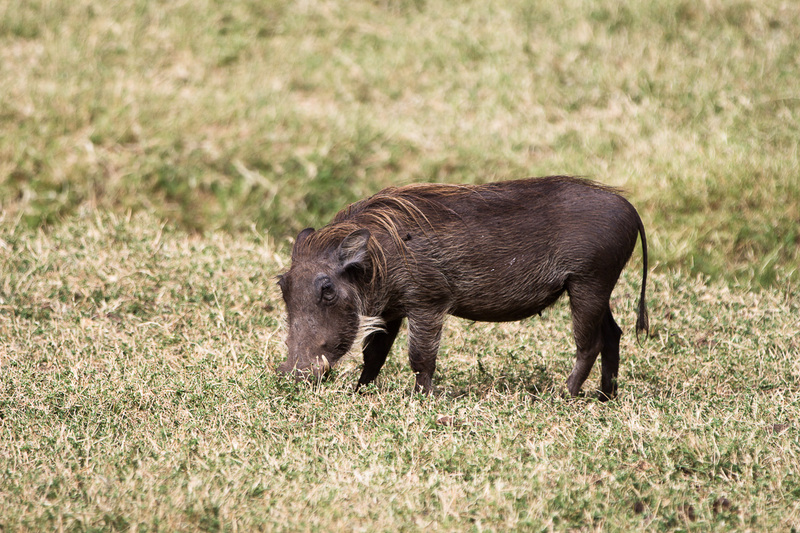 Suddenly, she started running and chasing after the warthog! Our jeep sped off, furiously following her pursuit. 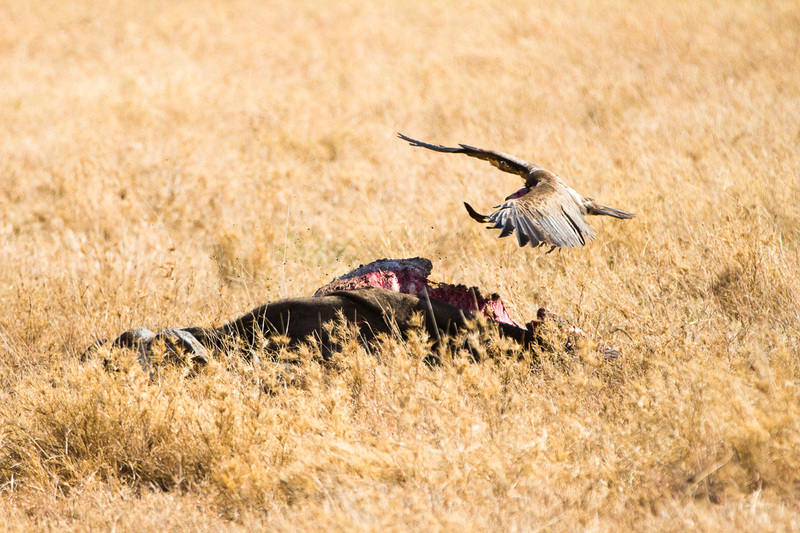 She finally caught the warthog! 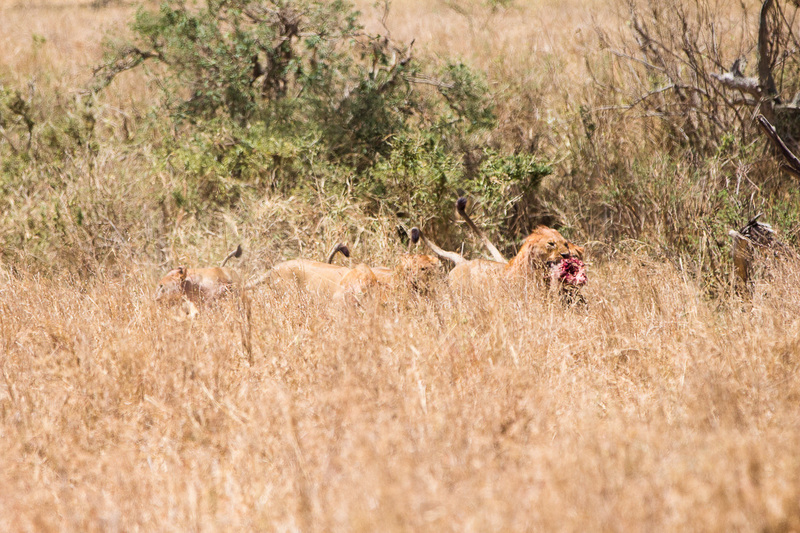 We were so fixated at the kill when out of nowhere 10 lions (ten!) 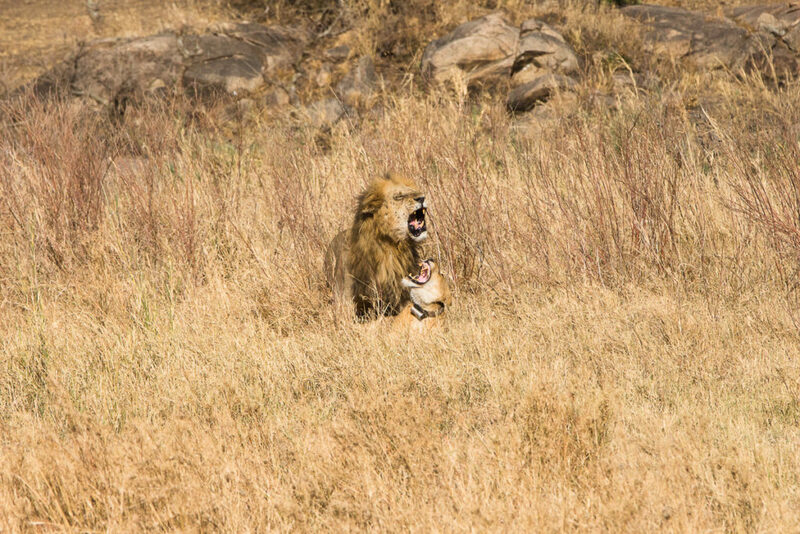 emerged from behind us, heading towards the kill. 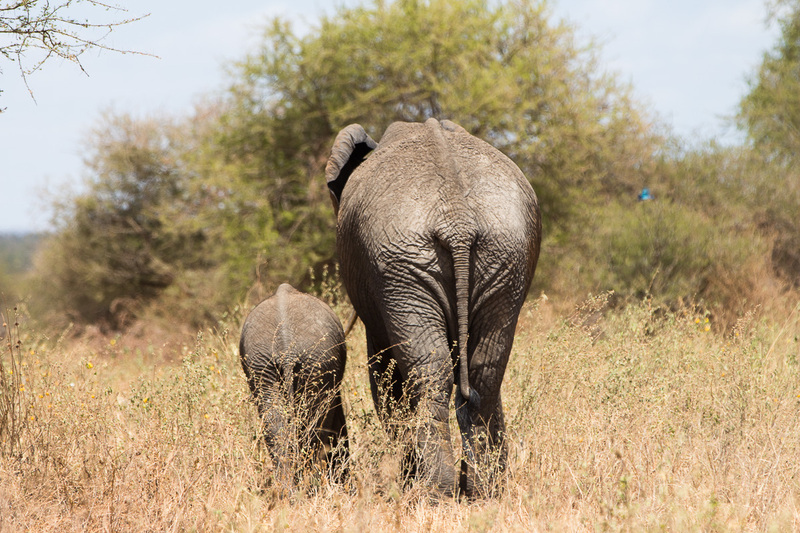 I let out a cry as they walked right past our vehicle, surprised. 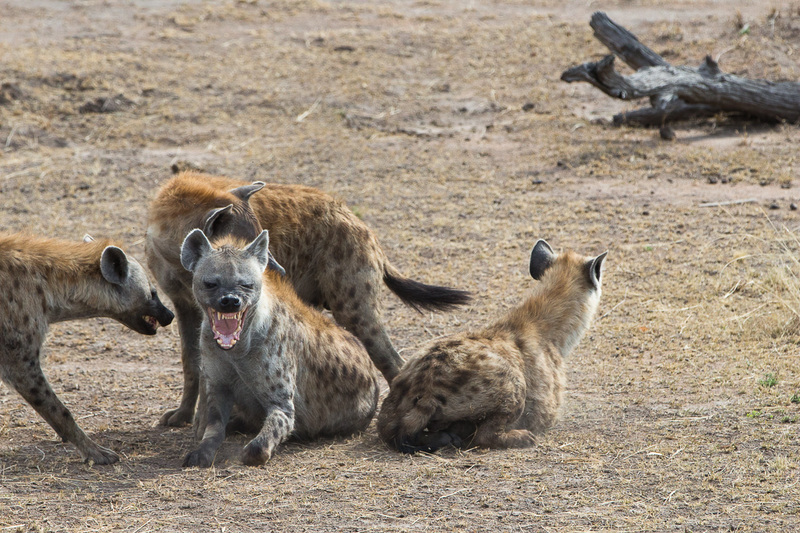 They looked exactly how you’d imagine: mouths open, tongues out, slight devilish grin, and creeping with each step. 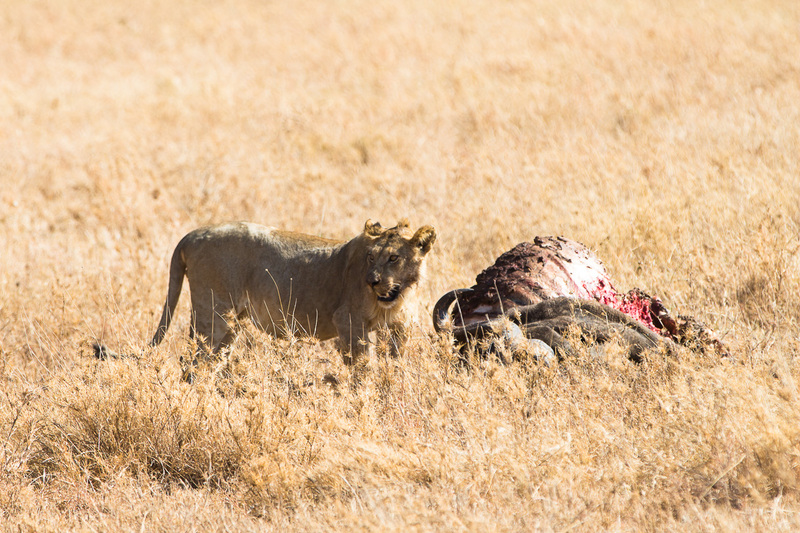 The lions started to tear apart the poor warthog and we could hear their grunting and hunger as they ate. 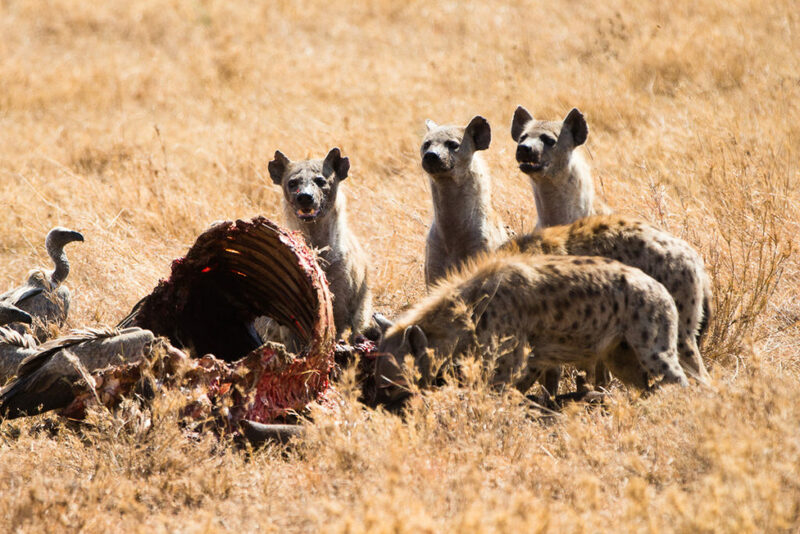 One even had a bone in her mouth as she slyly tip-toed away from the group to eat in peace while others fought over the relatively small piece of meat. 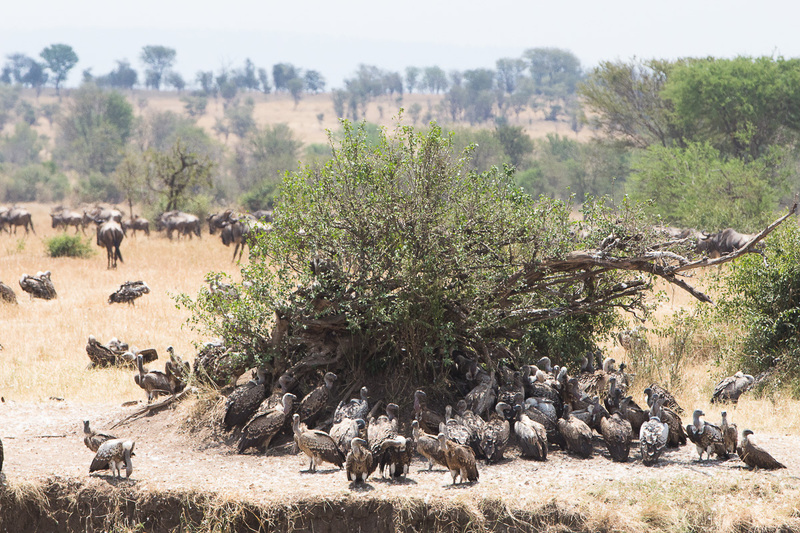 Finally, they finished (warthogs are considered tasty) and crossed the road in front of us to rest under a tree. In the picture below, if you look closely you can see the red blood from the kill. 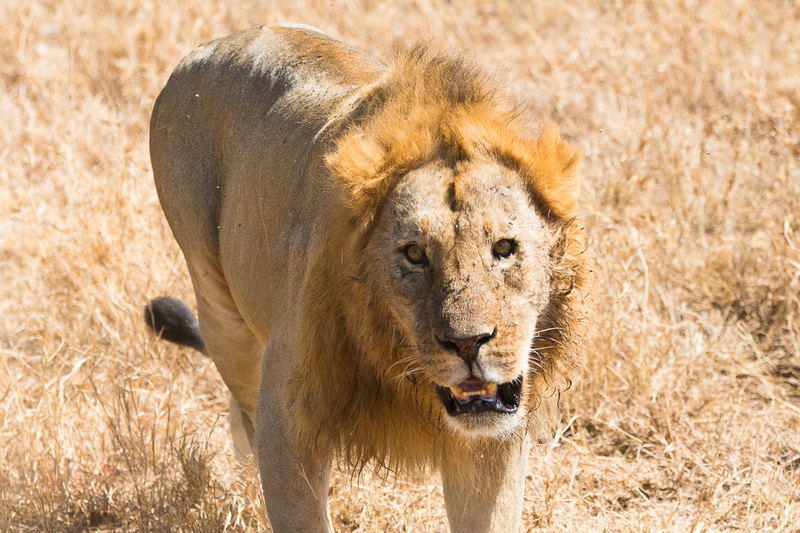 You’re pretty lucky if you witness a kill in action but our guide said in his 13 yrs of experience he never saw a lion chase his prey for 300 meters (lions are short-distance stalkers), and didn’t believe me when I told him to keep driving as we were following the lion chase. “Are you sure she’s there?” Zadoc asked. 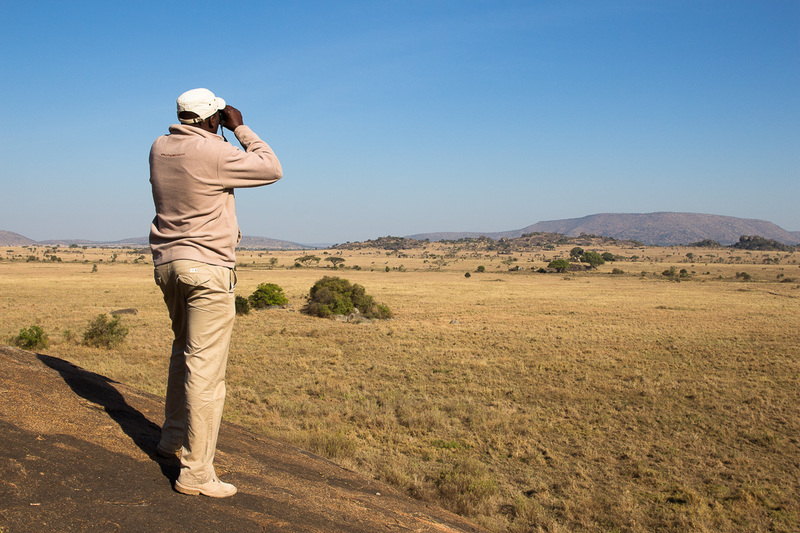 “Yes, I can see her and the warthog running through the binoculars!” The whole experience was thrilling and made my National Geographic inner nerd happy. 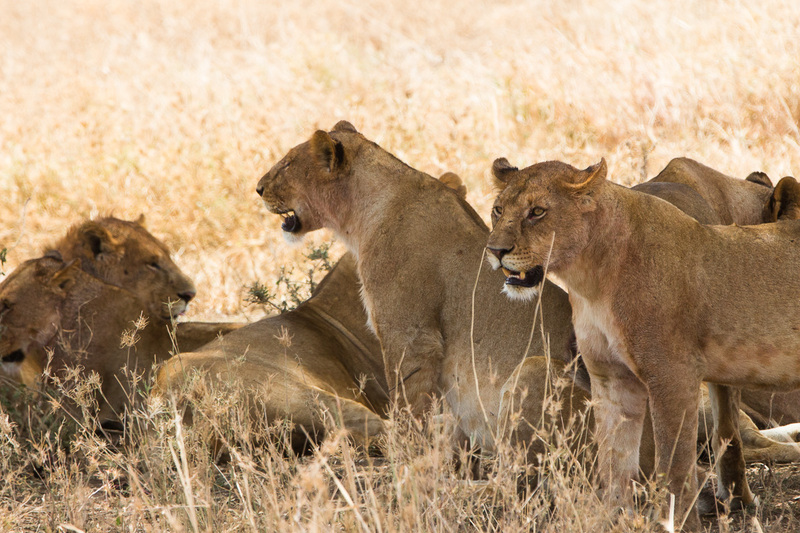 At this point, 10 lions next to the road are going to attract tourists, so we drove off, more than satisfied with all that had transpired. 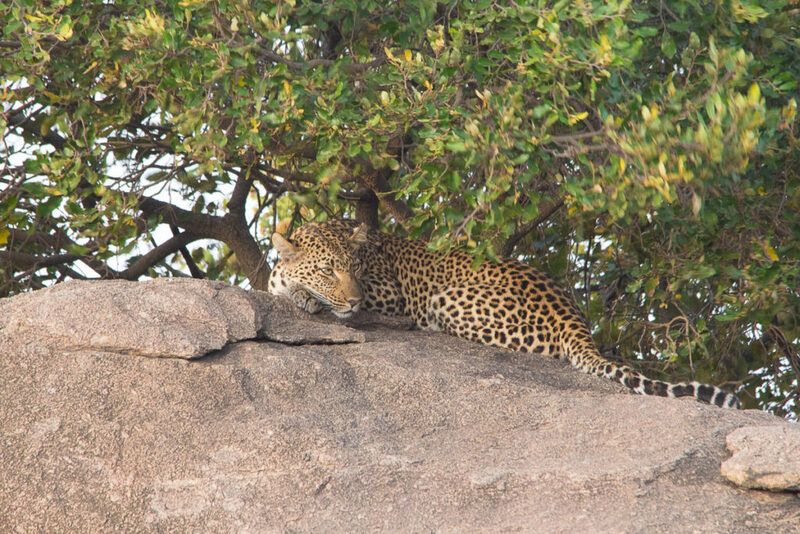 Not too long after, we saw the elusive leopard, but it was very far away sitting under a tree. We waited for a while, but gave up to eat lunch. 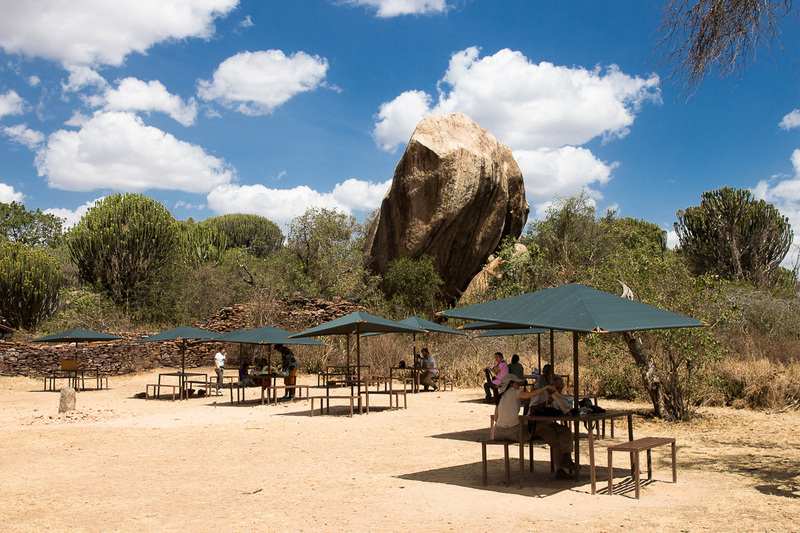 AT the picnic site, we took a tour of the Kopjies rock formations. Many mongoose and gerbil looking animals were all around. 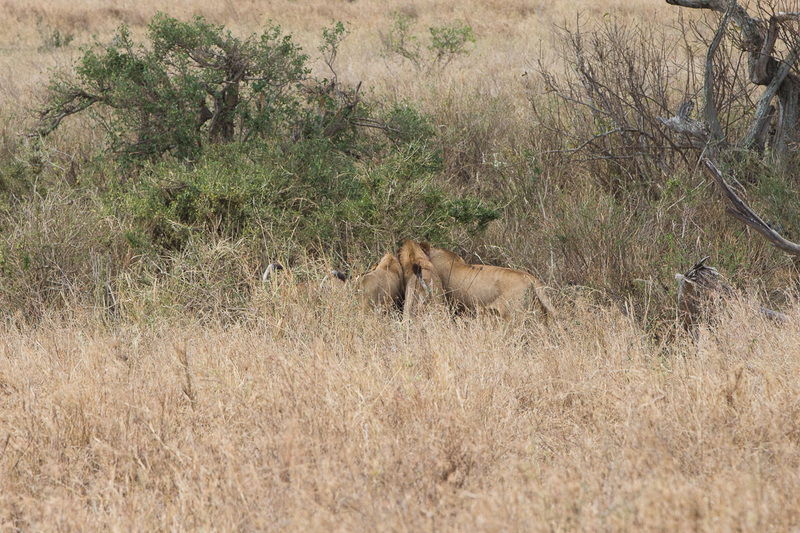 We heard rumors that two lions were on honeymoon and we soon found them! Crazy, they mate for 7 days straight, 24 hours, every 15 minutes. The “fun” lasted literally a good 2 seconds. The female can get very aggressive during this period and the male can grow tired without food for so long (as we saw). 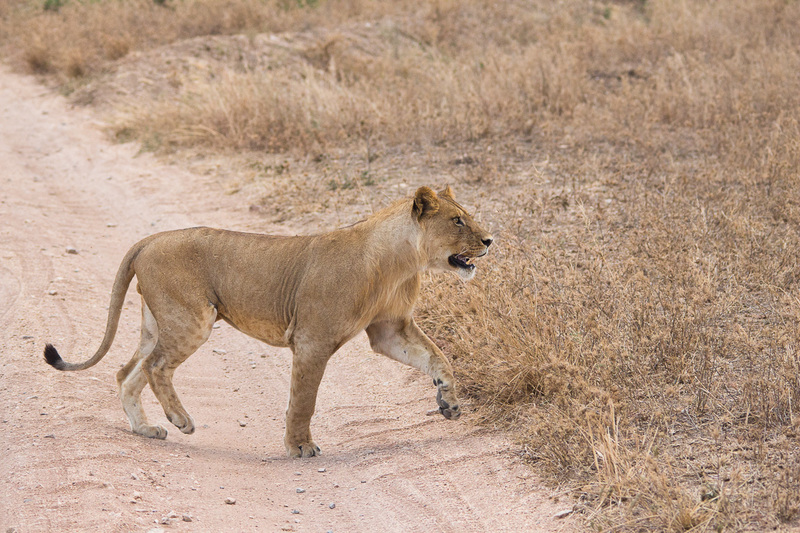 We got scared for a moment when one lion onlooker walked directly past our car. After a very eventful day, it was time to hit the road back to camp for dinner. 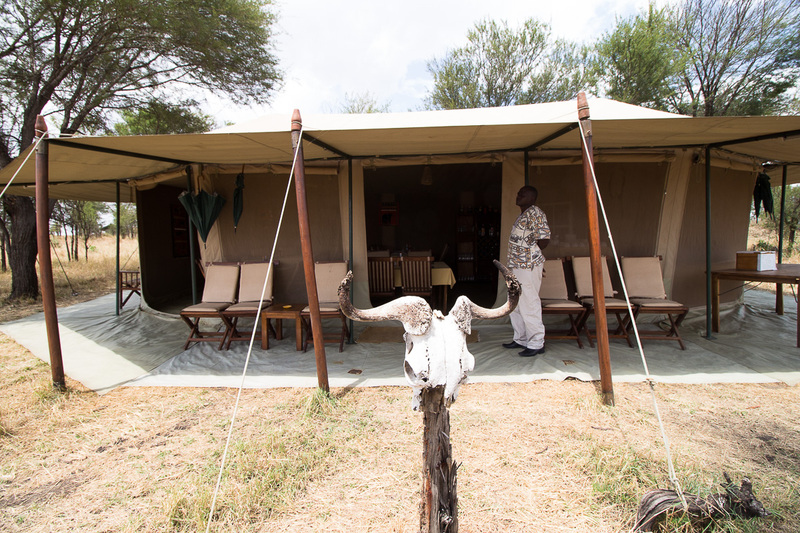 We were upgraded to the honeymoon suite, with ebony wood furniture and other cool safari looking stuff. 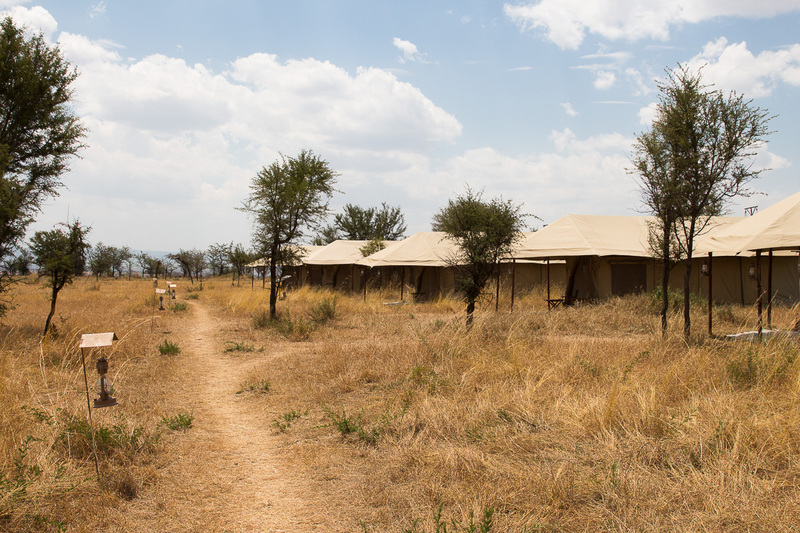 No wifi at Acacia Camp, but we didn’t notice. After a warm shower, we got ready for bed and jotted down notes from the day in our journal. 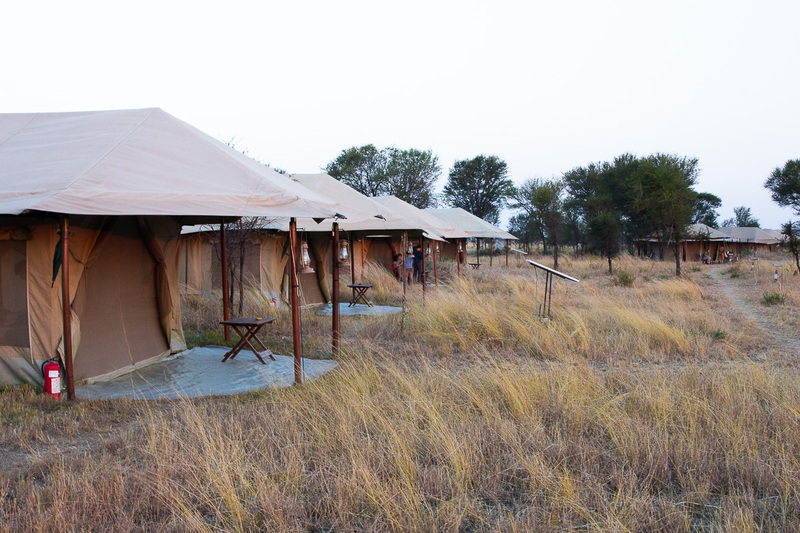 We learned that experiences like ones today are what make safari’s memorable and paled in comparison to an episode of National Geographic. 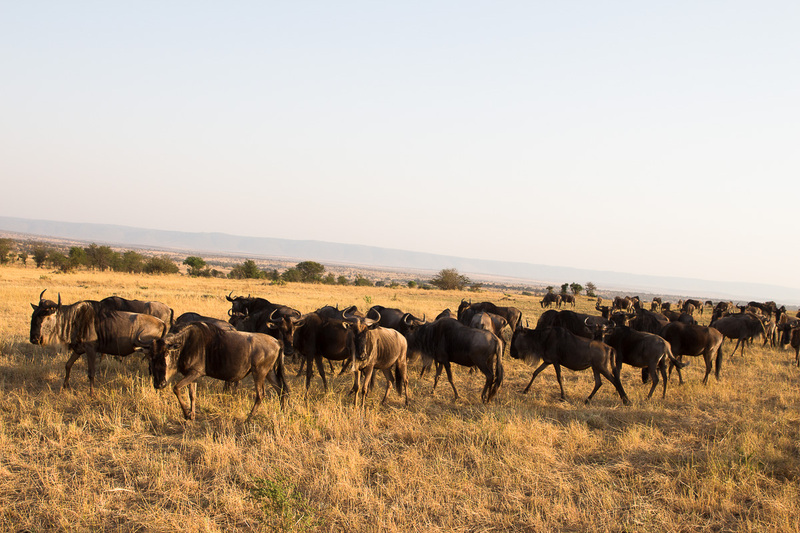 The sights, the sounds, the smells…all of it was part of the experience and what makes Tanzania a once in a lifetime trip. 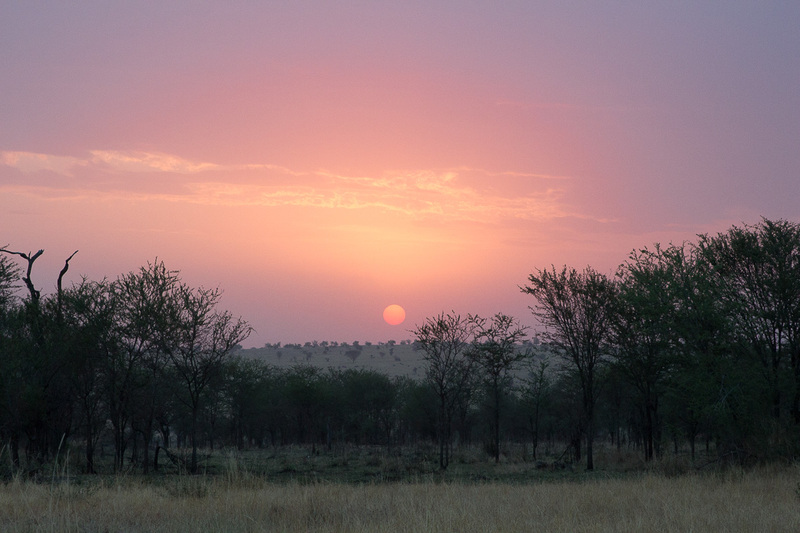 We woke up at the crack of dawn, and by 6am we were headed out the door for our morning safari! 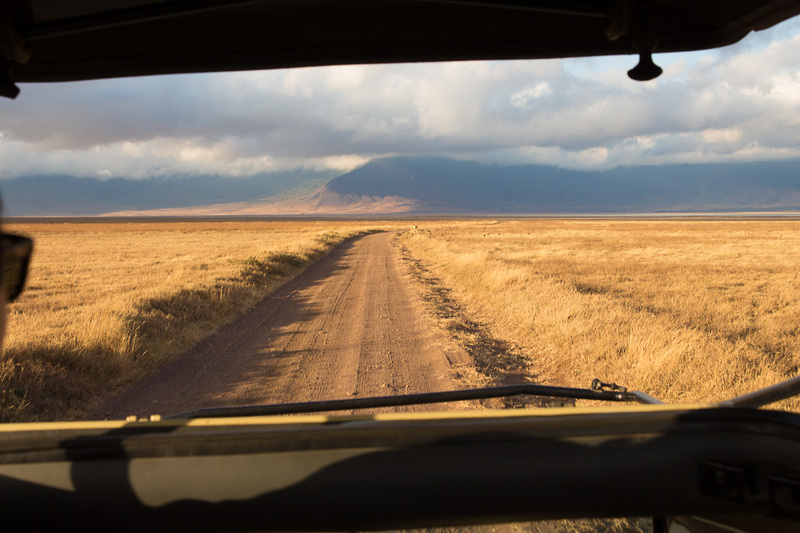 We drove to the Maru area, but unfortunately didn’t see anything for the entire duration of the 3 hour drive. There were many kopjies (rock formations), but nothing else! That’s the unpredictability of mother nature. 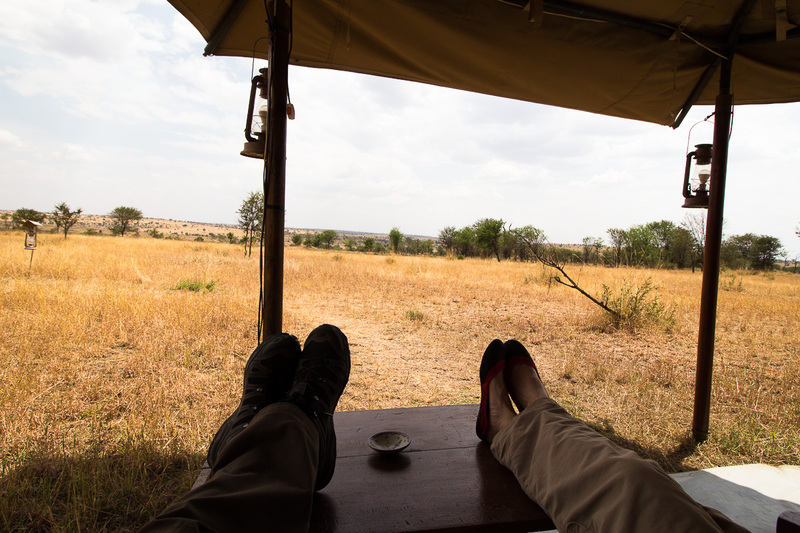 We ate breakfast on a kopjie that looked like pride rock from the Lion King, then drove back to the main Seonara area of the Serengeti. 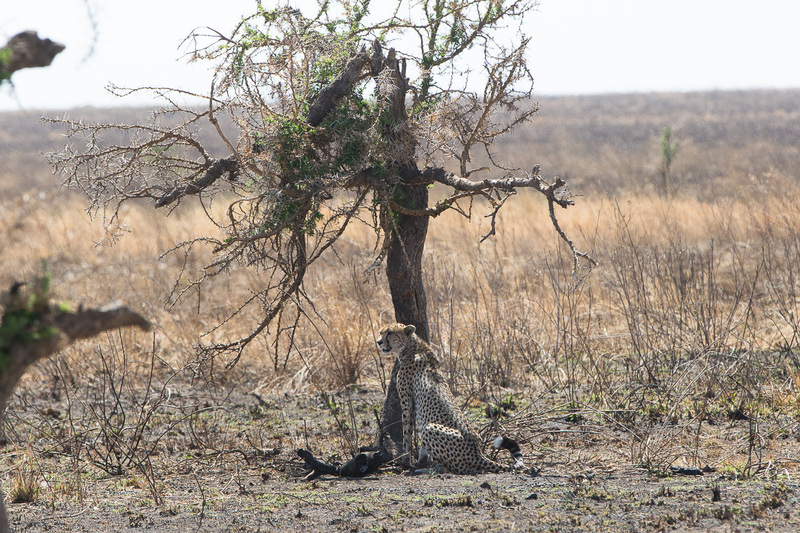 We saw a cheetah chilling under a small tree as a gazelle pranced right in front of him. He clearly wasn’t hungry, so we drove on. 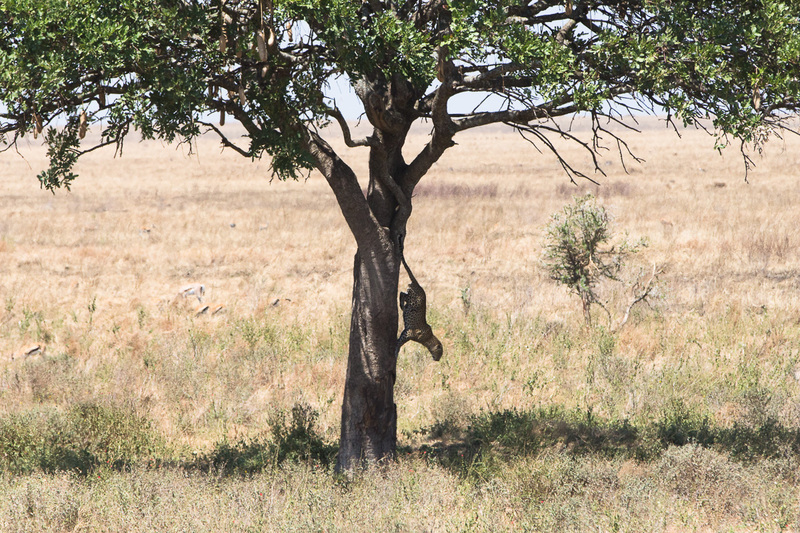 Then we encountered a leopard in a tree, stalking gazelle! 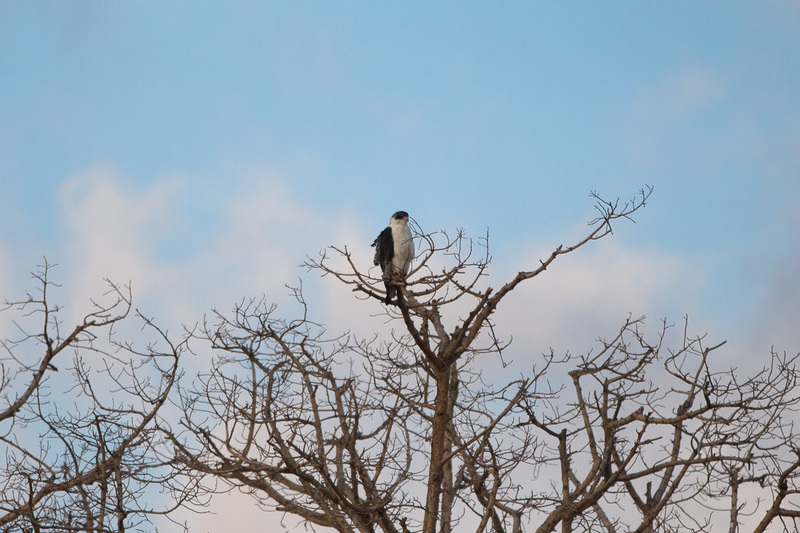 We sat there for an hour and watched it hunt. The leopard slowly climbed down the tree and finally attacked! But it was too hasty and didn’t catch anything! 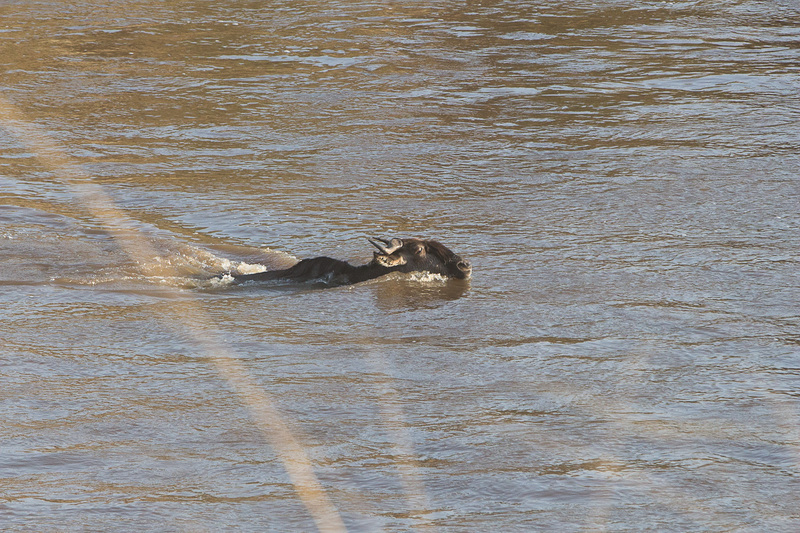 I missed the action shot though, because it leapt at the very second I was resting my camera hand. At least I didn’t miss an amazing kill. After several tries, it struck out of luck (seriously?!? 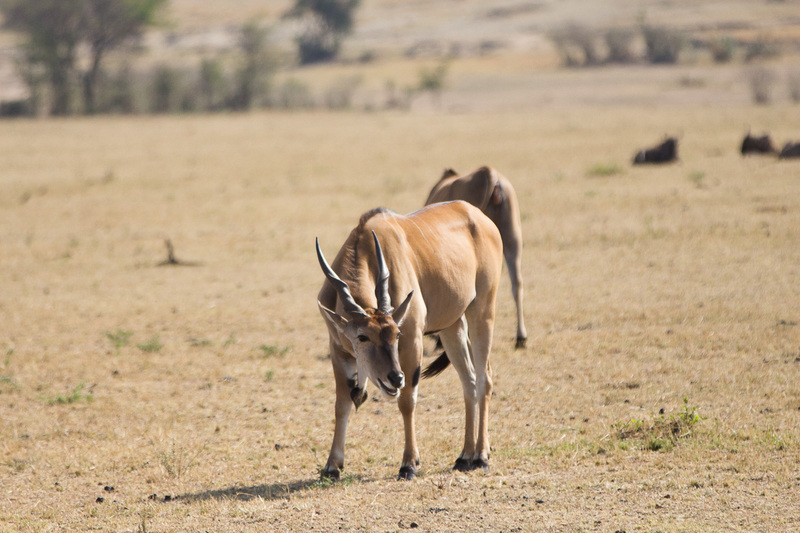 there were so many gazelle grazing there) and we decided to move on. 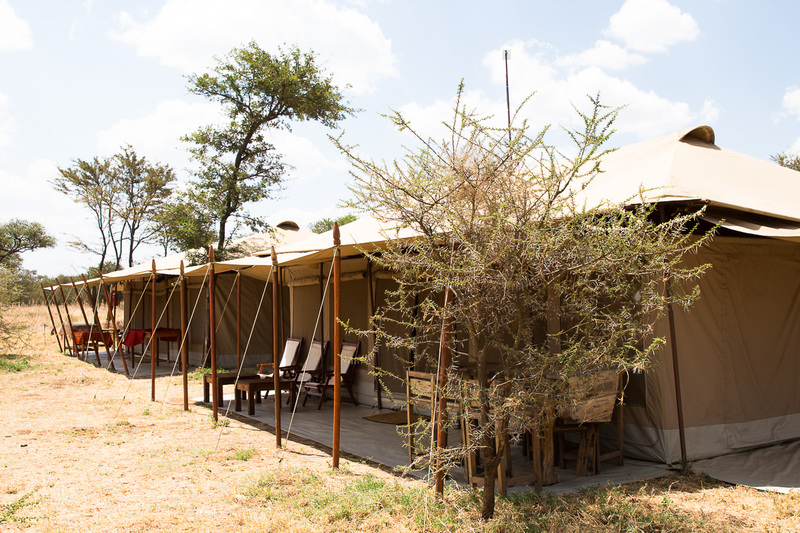 We drove back to the Acacia camp so that Zadoc could run an errand for a fellow driver. 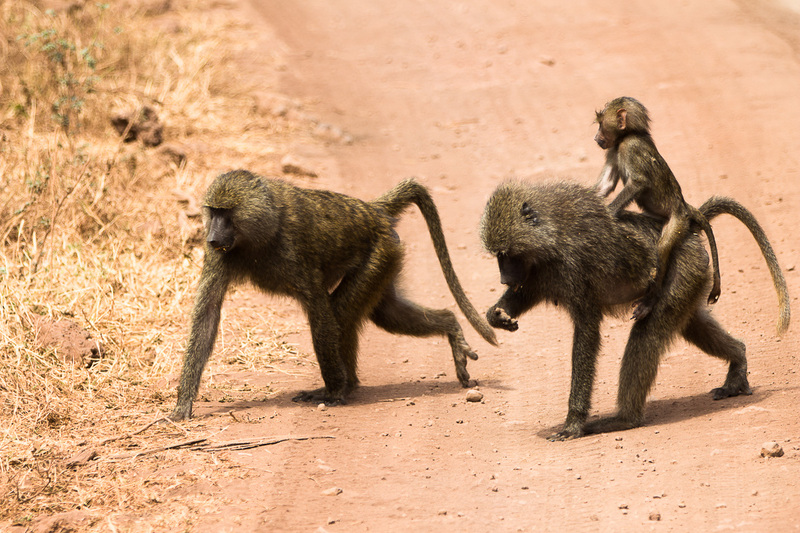 Safari drivers look out for each other in the Serengeti, doing favors and communicating the latest animal sightings. They also seem to have a hierarchy. 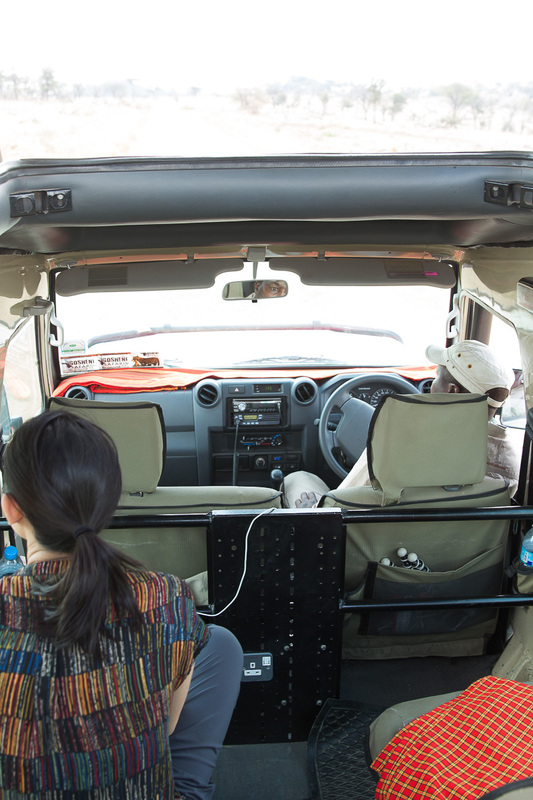 For example, people who drive hotel based roofless trucks are snootier and don’t like to share information. We hit the road again at 5pm. 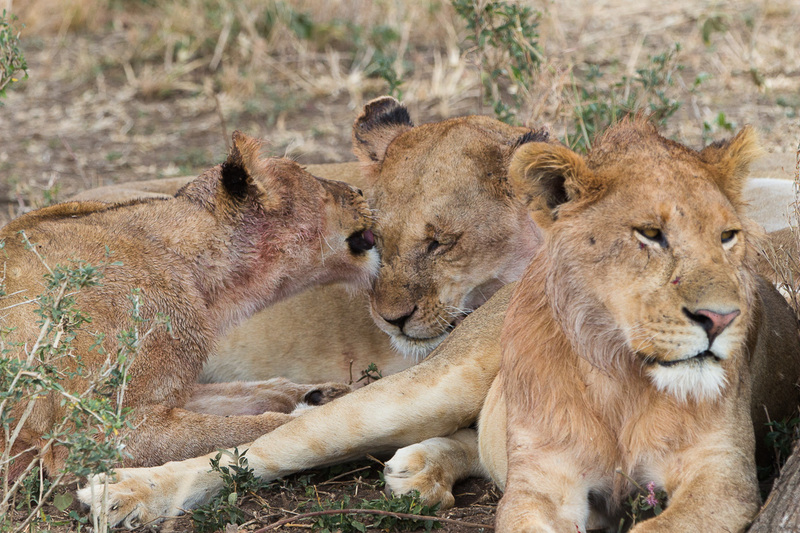 During the short drive, we saw 3 baby lion cubs and their mother at a distance. 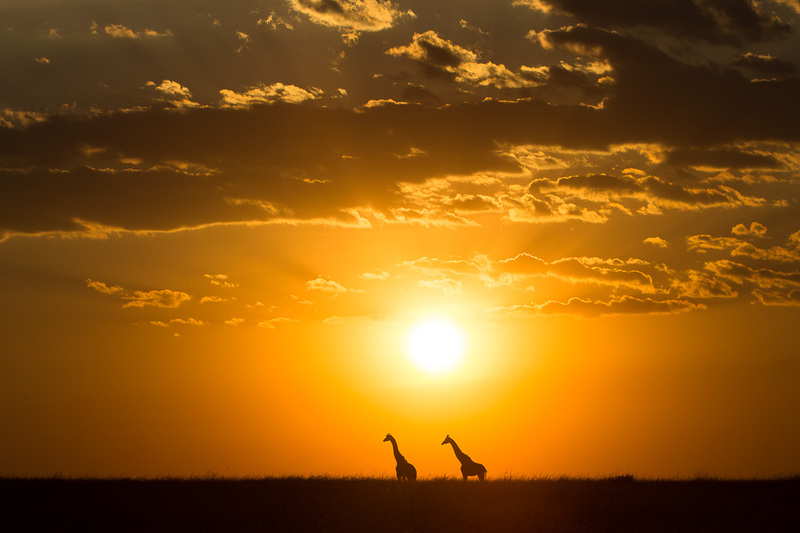 We did get to watch a nice Lion King sunset with two giraffes walking against the reddish orange sun. Iconic. Cue Circle of Life again. 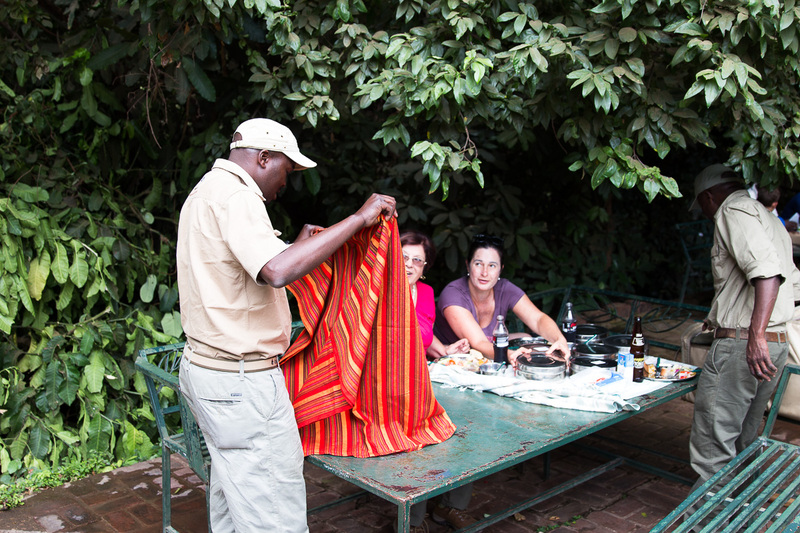 Chef Anthony went out of his way to make us bananas and beef, a local Tanzanian specialty. It was yummy, the bananas tasted like nothing we had before. We toured the kitchen; they really make do with minimal equipment. 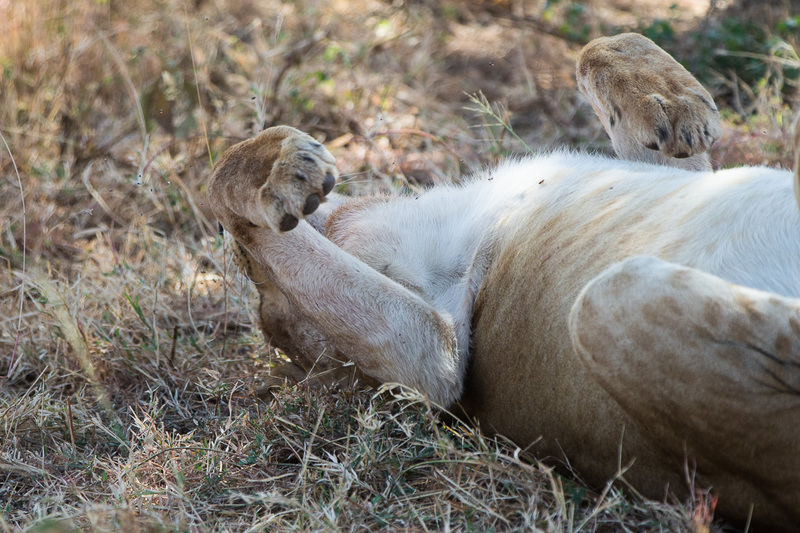 It was our last night at Acacia Camps and we were woken in the middle of the night by lions roaring. 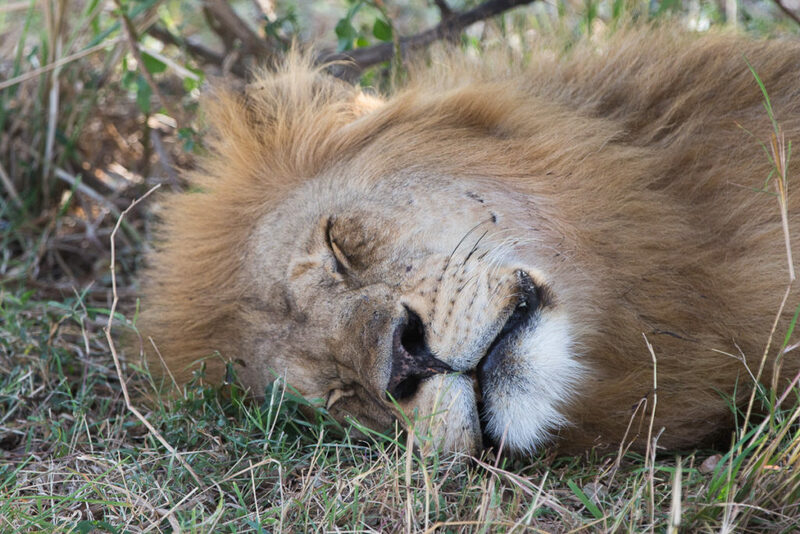 Zadoc said they were probably 2km away and you can hear a lions’ roar up to 8km (~5 miles) away! In the winter time, try to shower before dinner because you will freeze to death after dinner. 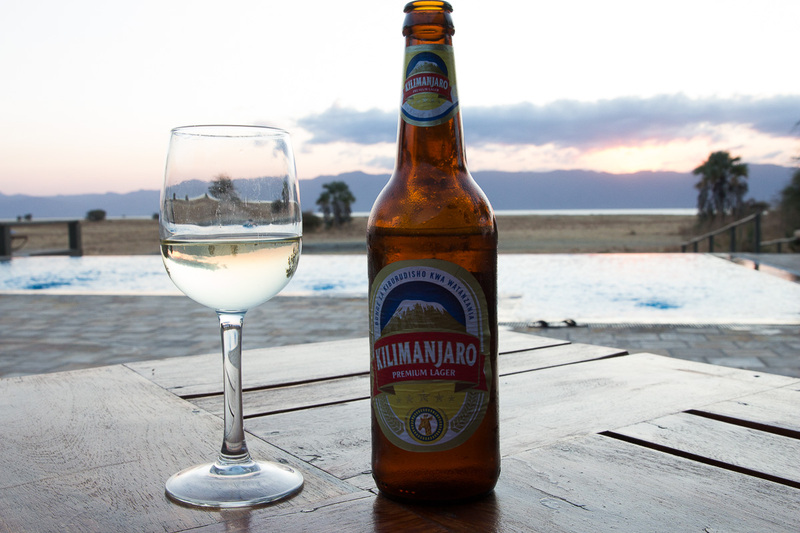 Tanzania has great hospitality. 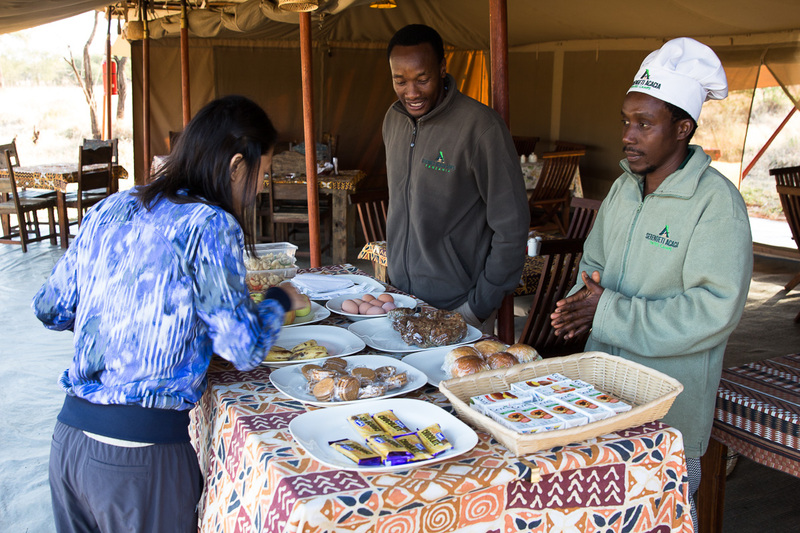 The camp workers greet you with a towel and fresh juice when you arrive after a long game drive. 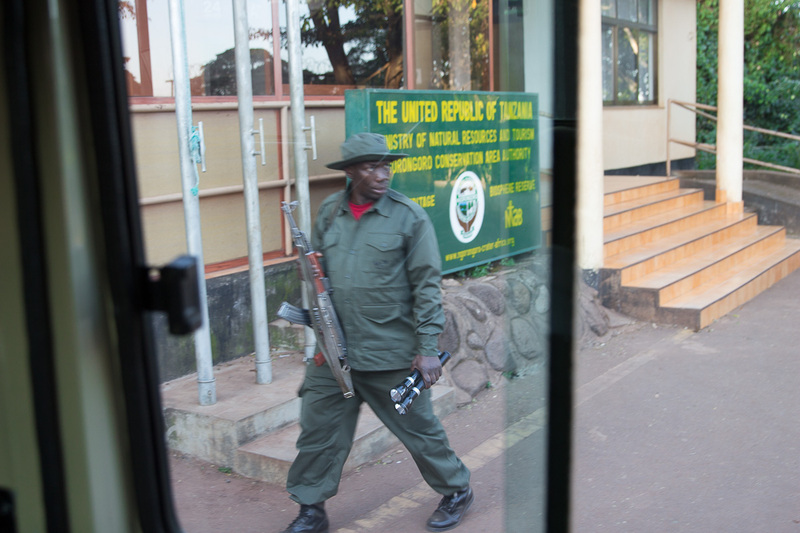 They are all well trained about culture and take university classes for tourism. We heard other countries don’t have the same standards. We met a lot of Italians, Brits, Spaniards, less so Americans. So far tsetse flies and mosquitos are manageable. Although one did get through my thick hiking socks but I flicked it away in time. 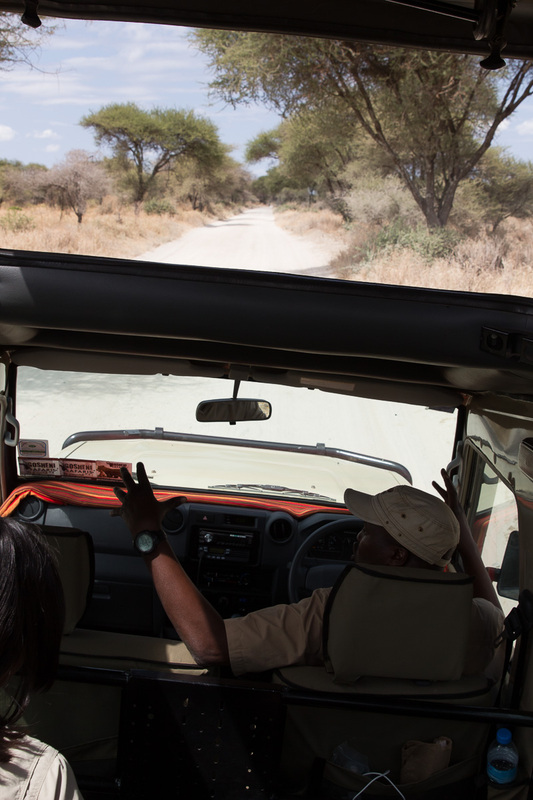 We love standing up in the truck while Zadoc is driving, it feels like flying! Especially during a nice golden red sunset or warm sunrise. 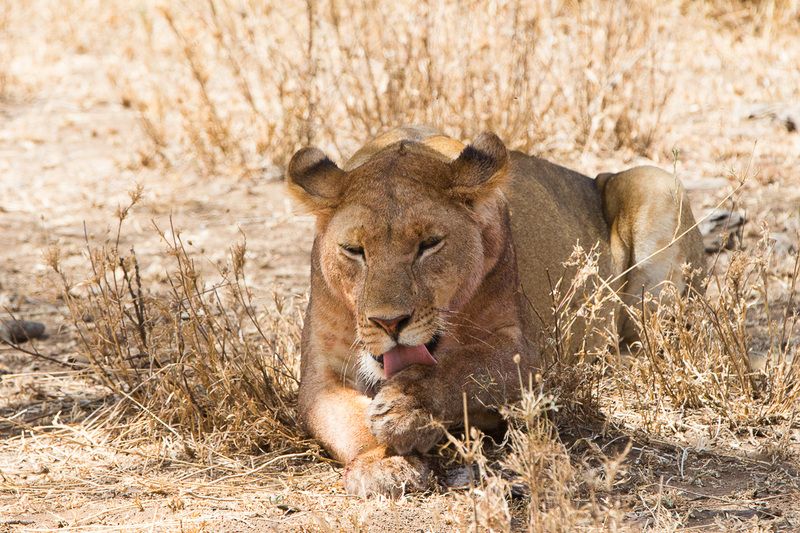 We left again for the Seronera area, home of the Big Cats. 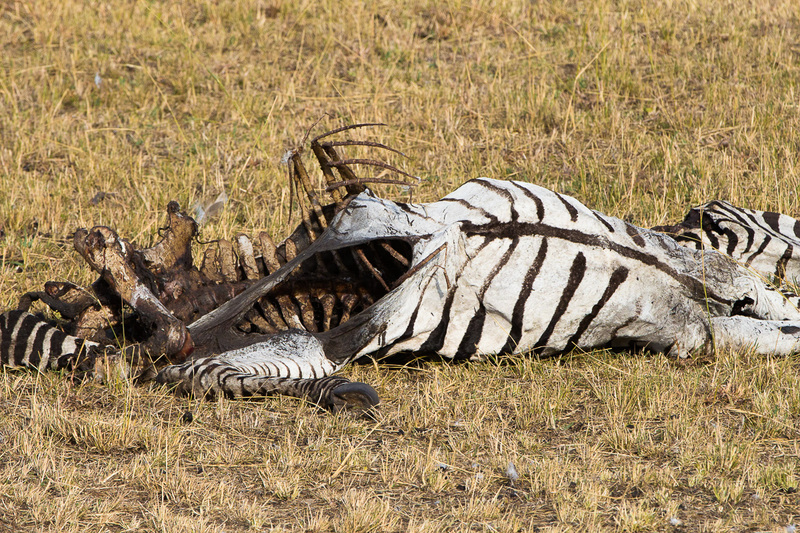 Next to the road, a buffalo carcass was being eaten by lions, birds, hyenas. 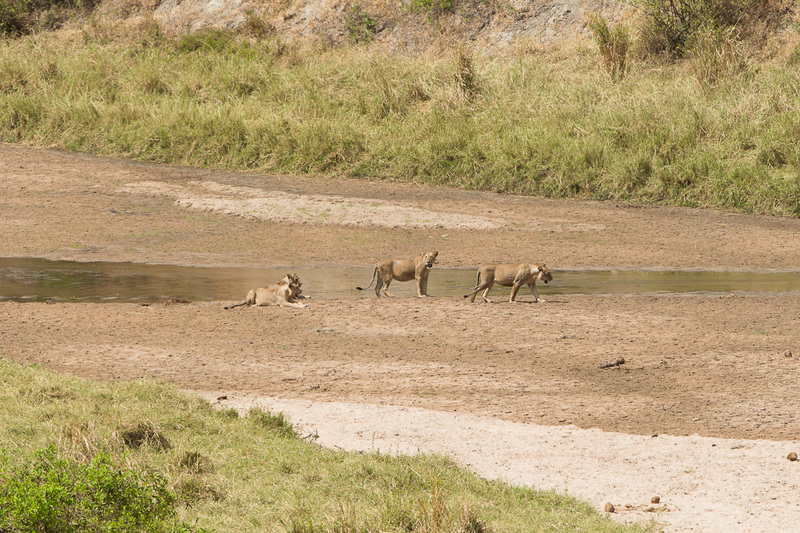 We spent over an hour watching the whole predator-scavenger dynamic: the lions would eat the carcass and walk away to rest, then big birds/vultures swoop in to start eating, all while the hyena packs watching in the distance will mosey over while looking out for each other in case a lion comes. 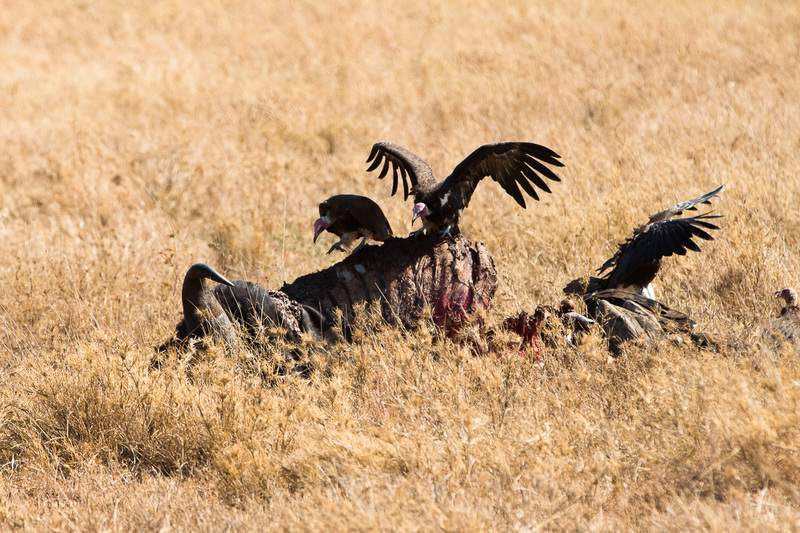 Just when the scavengers get comfortable eating, a lion will run back to the carcass to chase them all away. The whole rigmarole would repeat itself. 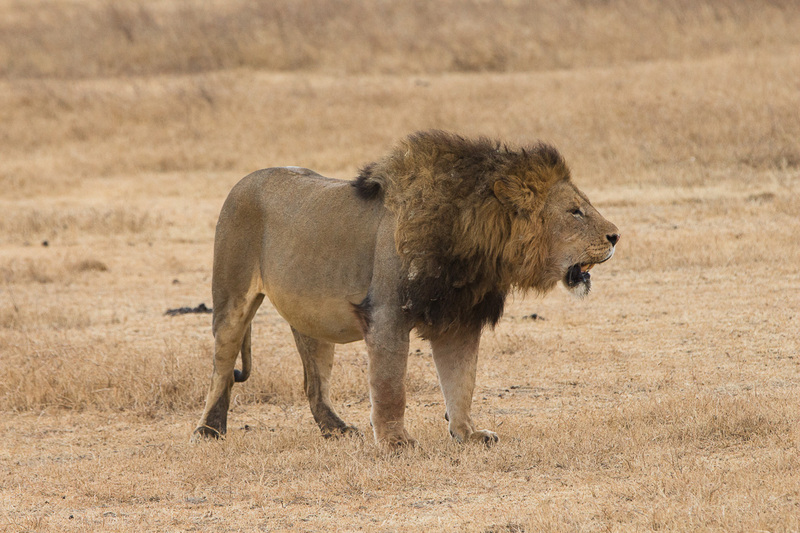 Note: Lions take a few days to eat a buffalo. 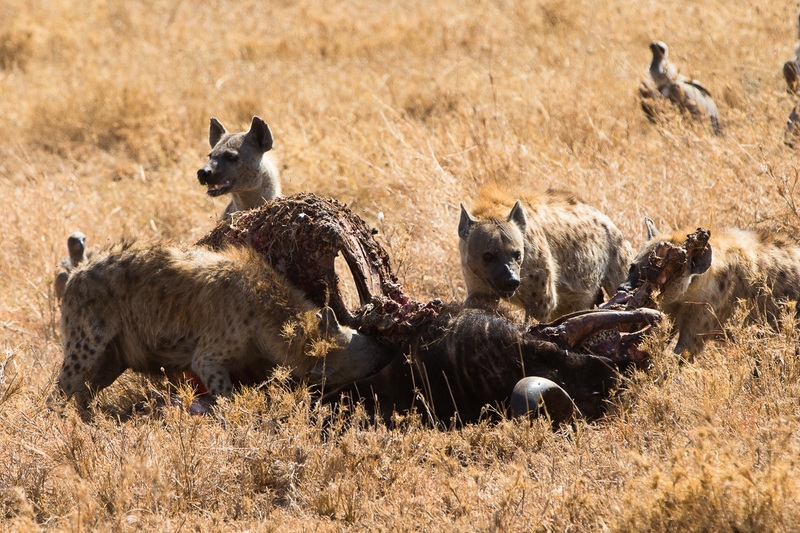 What’s even more interesting is to hear all of the crunching and growling. 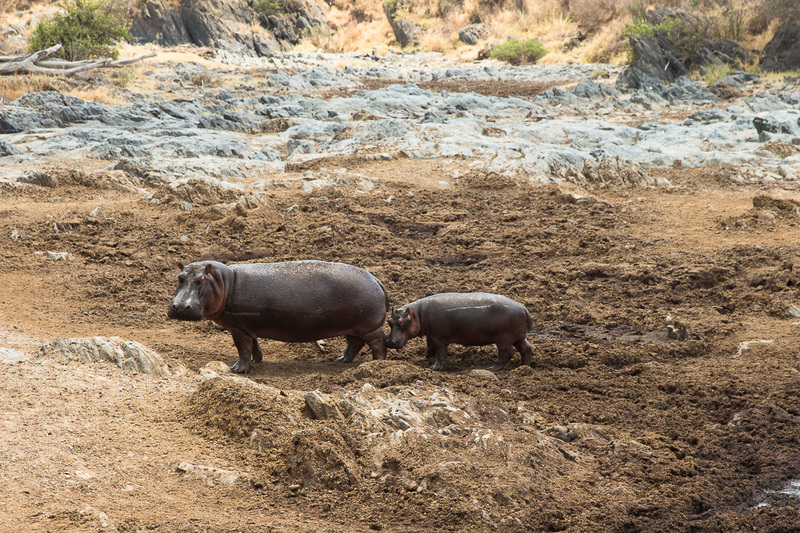 We went on our way to see the hippo pool. 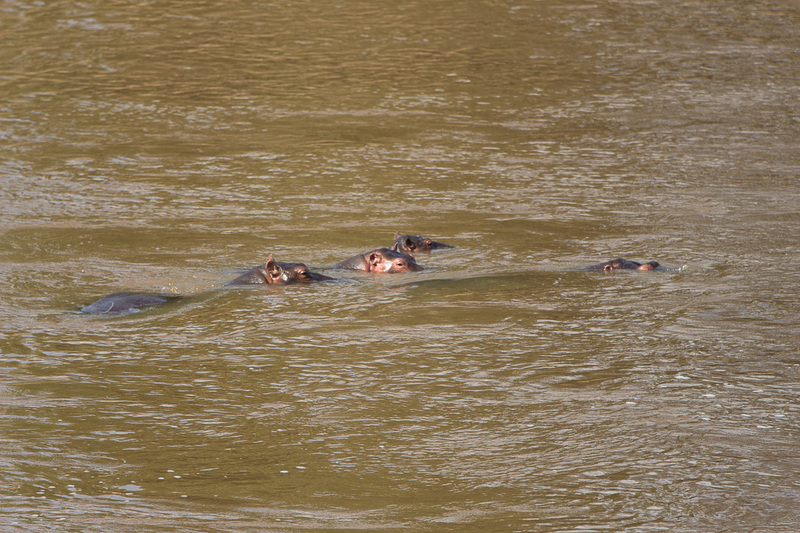 There are so many hippos farting around in the pool (supposedly so they can smell their way back home. Is this true?). 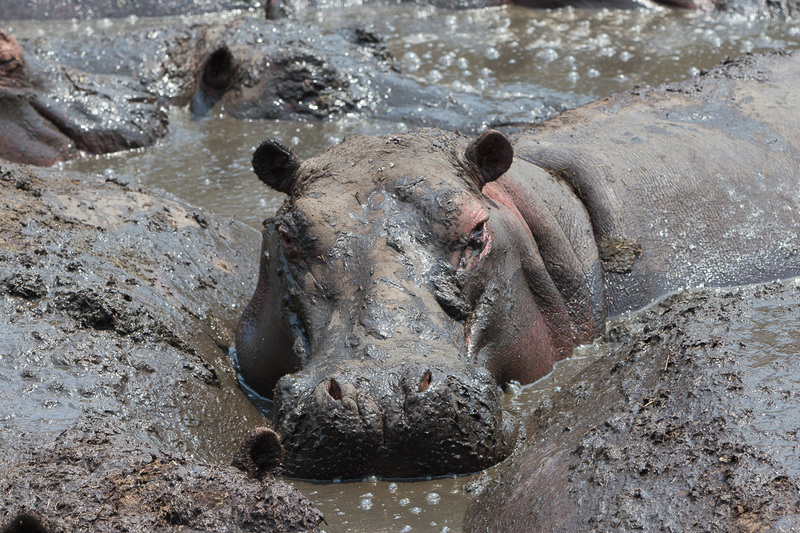 Shocking fact: They leave their pool at night and travel many kilometers to find food. 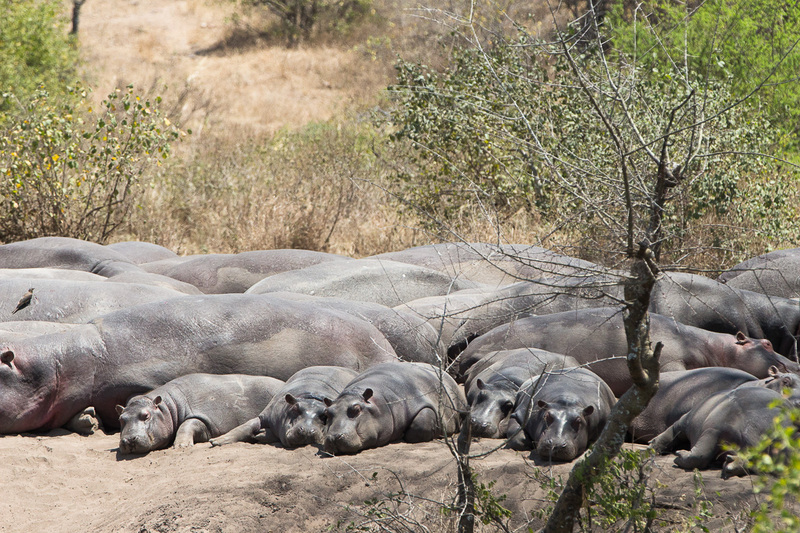 After lunch at the hippo pool, it was time to make our way to the Northern Serengeti. 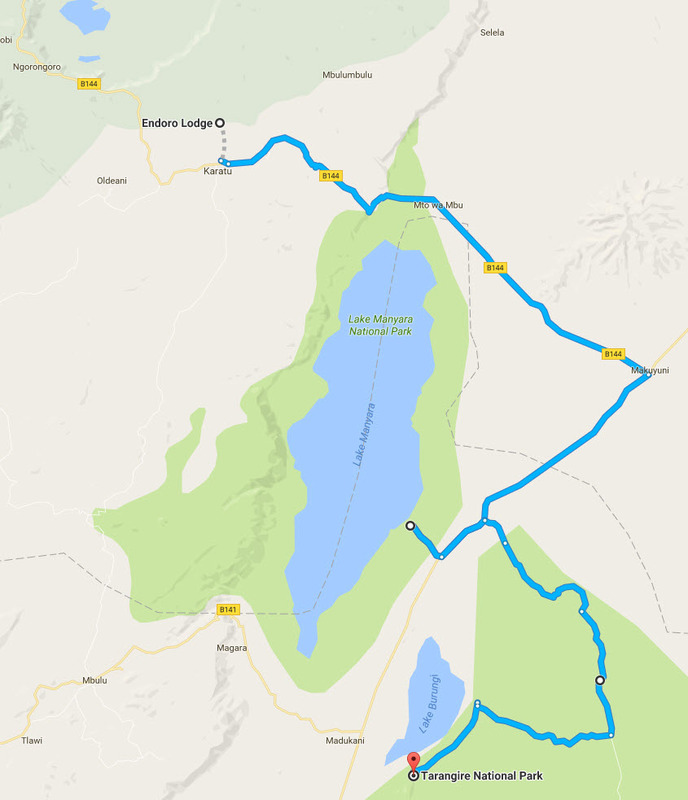 The drive is quite long, taking several hours with bumpy roads. 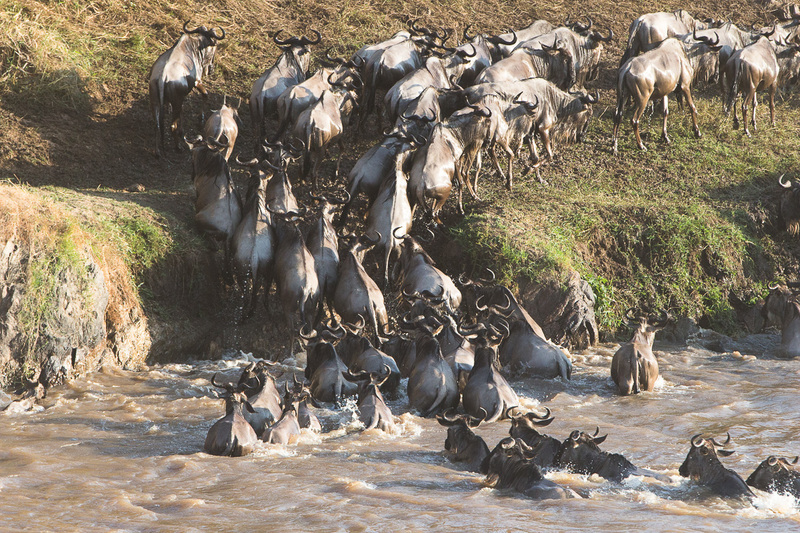 Most do not visit the North but we were determined to see the famous wildebeest Mara River crossings. 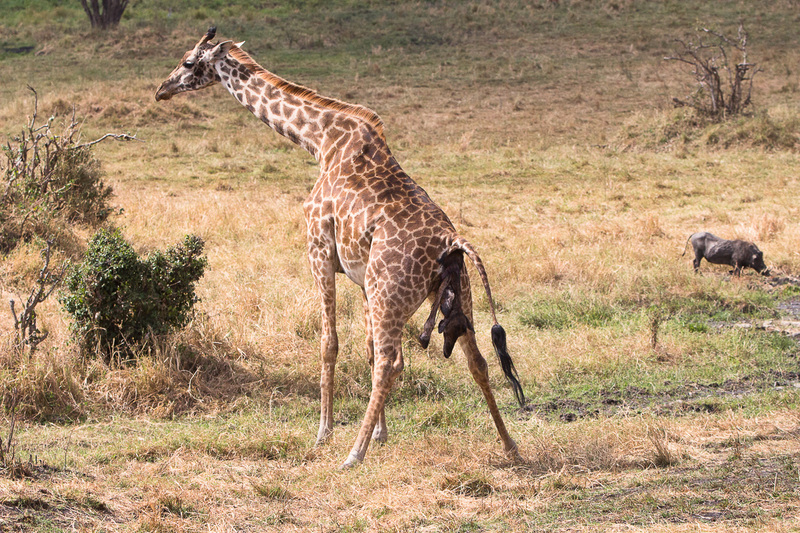 On our drive, we encountered a giraffe giving birth next to the road. 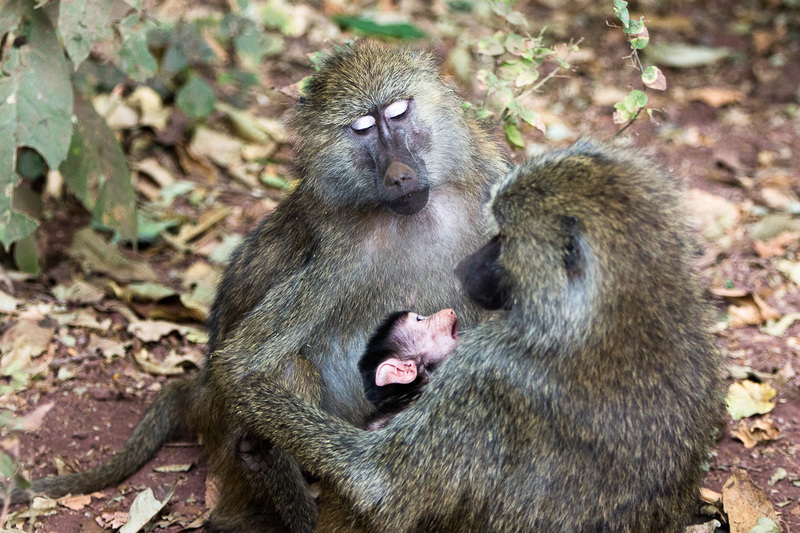 Talk about exciting, witnessing an animal birth! Some time had passed but it looked like no progress had been made. Through the binoculars we saw the poor baby was dead. Another giraffe walked over (possibly the dad), and lowered his head down to look at the baby, several times. I imagine he communicated the sad news to the mom, but she kept trying to push. 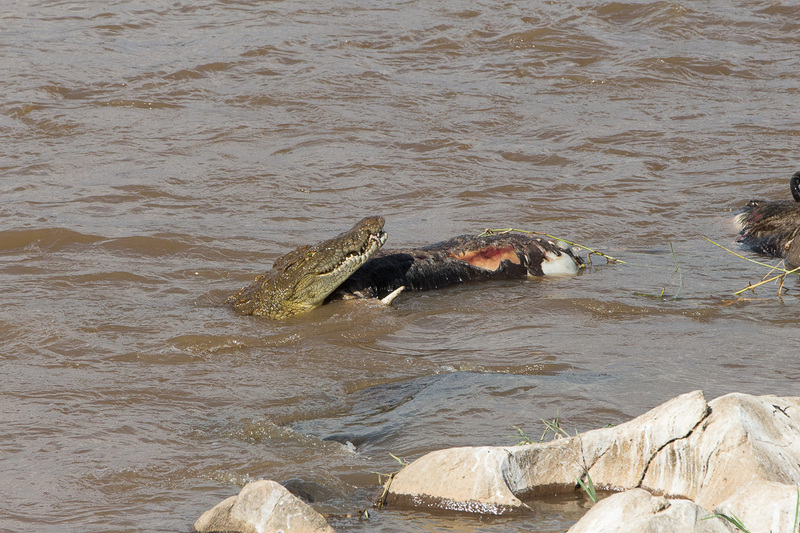 Our guide told us the mom will likely die as she cannot push out the baby. 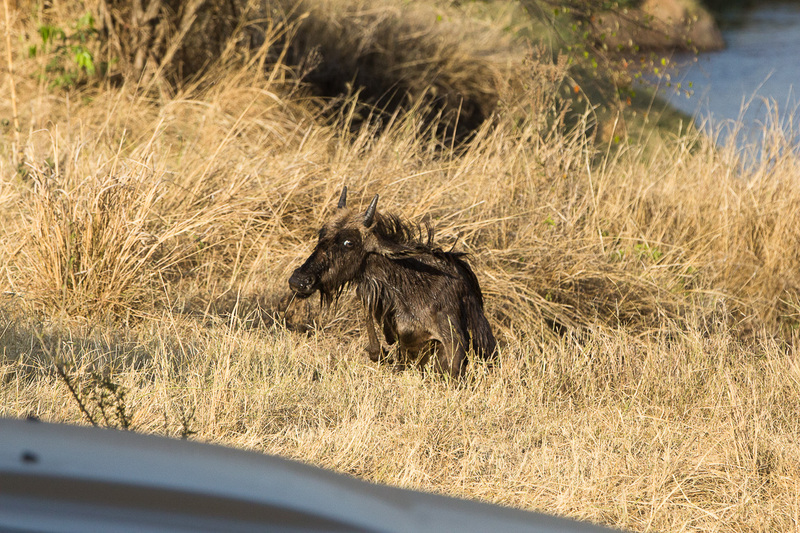 We were filled with a sense of sadness as we drove away to give her some privacy. 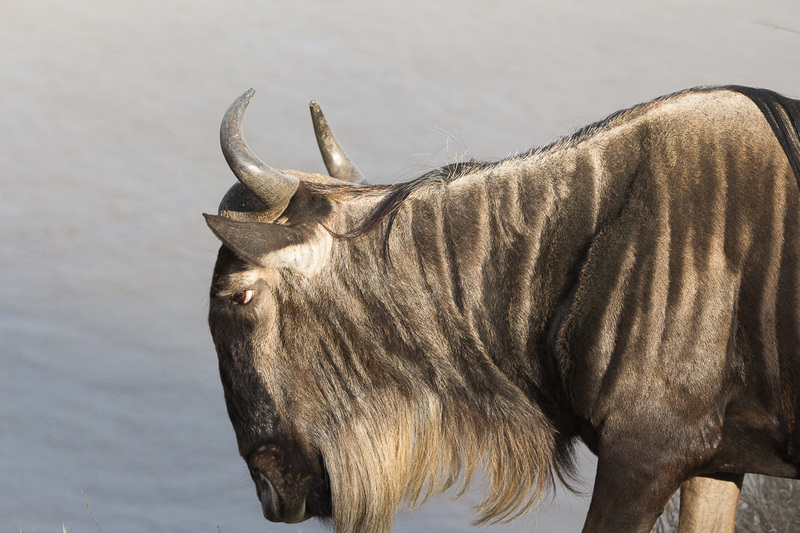 It’s remarkable how you can see, to some degree, emotions in the animals’ expressions and body. 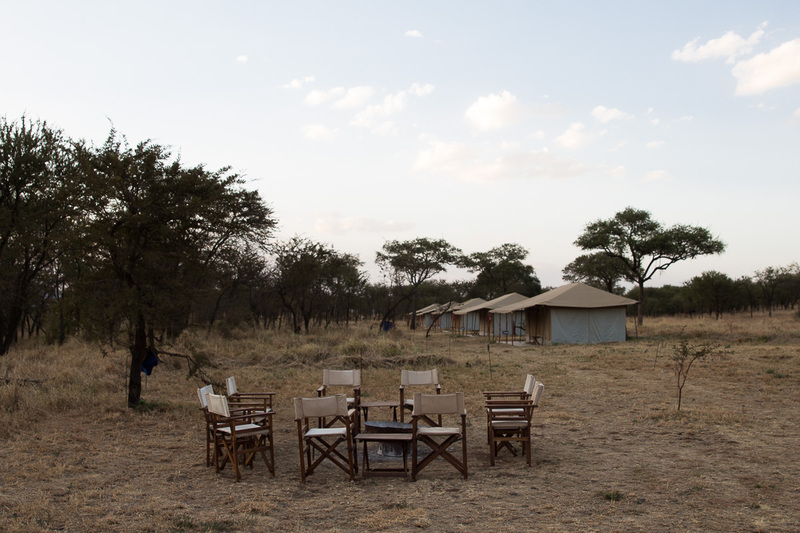 We made it to Kenzan Camp before sunset, 6:30pm. 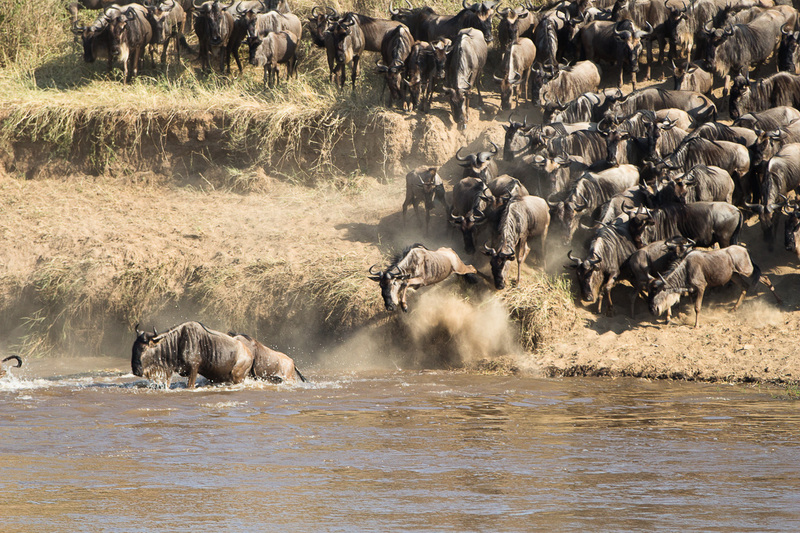 These ‘traveling camps’ are more simpler as they move with the wildebeest migration. Showers (aka “talking showers”) are interesting. You must tell the guy (our guy was named Taiko) that you want to take a shower. 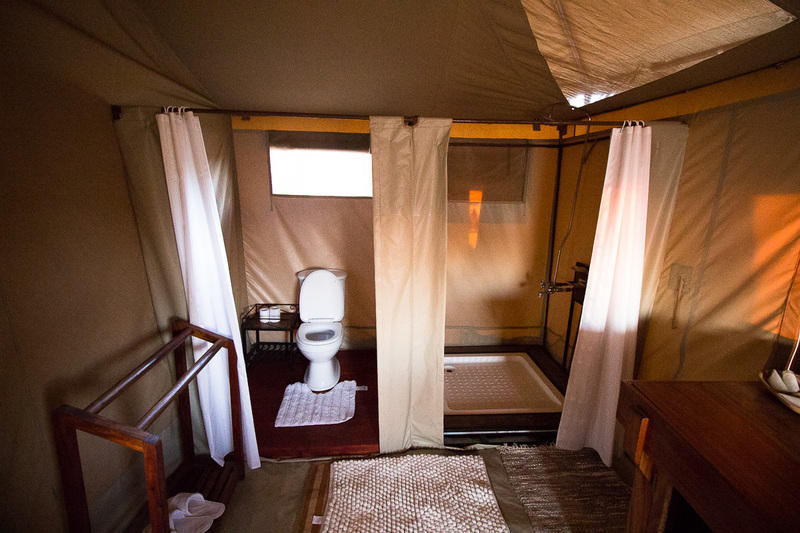 He runs behind your tent, fills a bucket with hot water, and says, “Your shower is ready!” Then you can shower normally. When the water runs out, you yell to the guy so he can lower the bucket to refill with water. 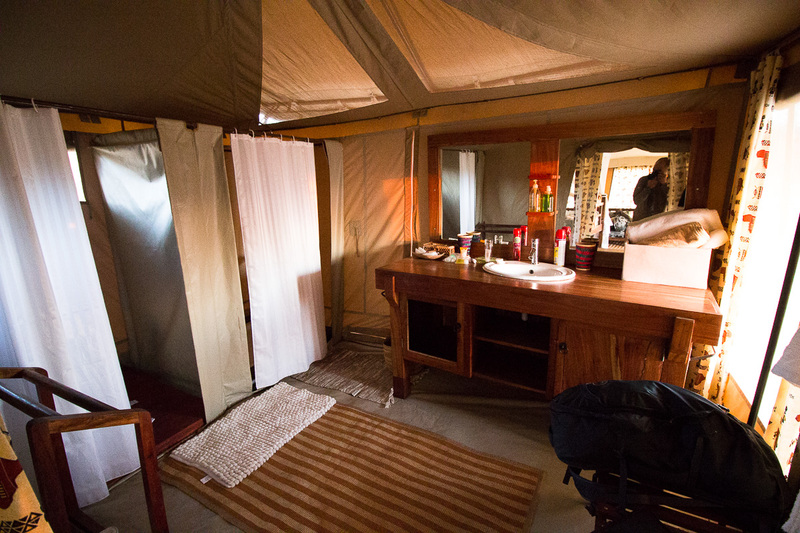 There are no power outlets in the tents, but there are a few dim light bulbs. 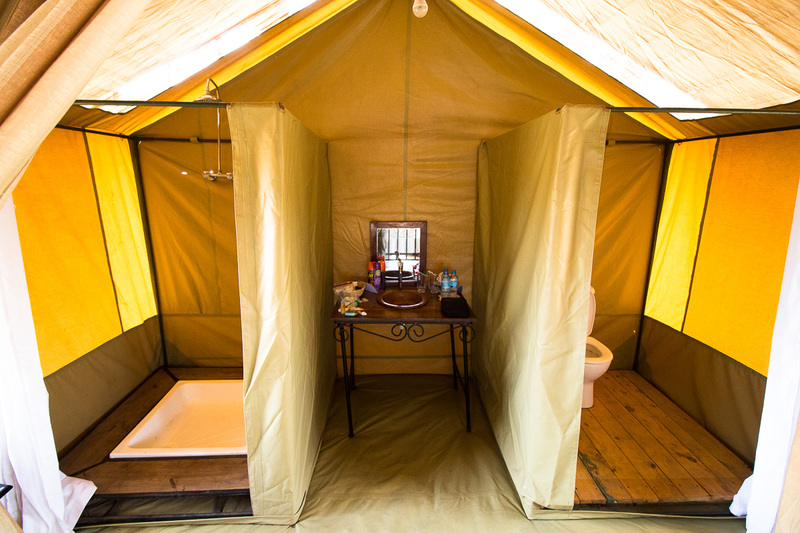 There are power outlets in the main dining area, but you have to share with other campers. There is wifi at the camp, so we were happy to finally connect with the outside world. 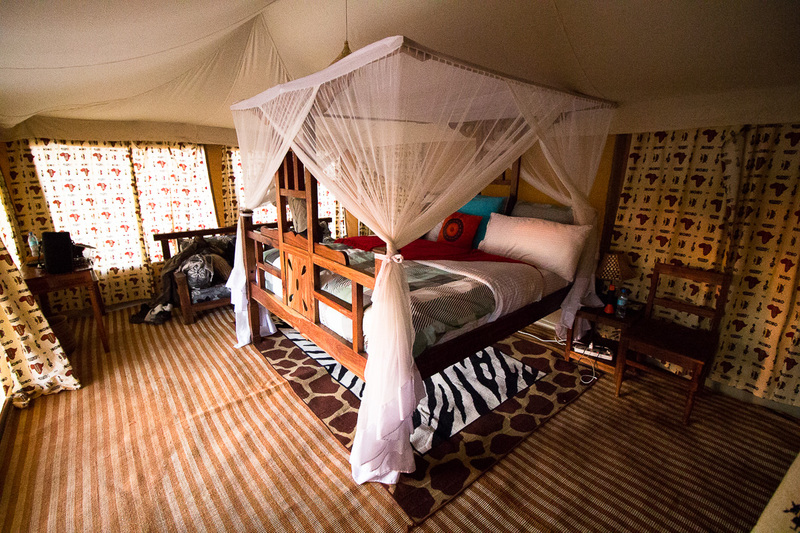 We were in the last tent at the end, so we could hear all the animals creeping and mooing outside all night! 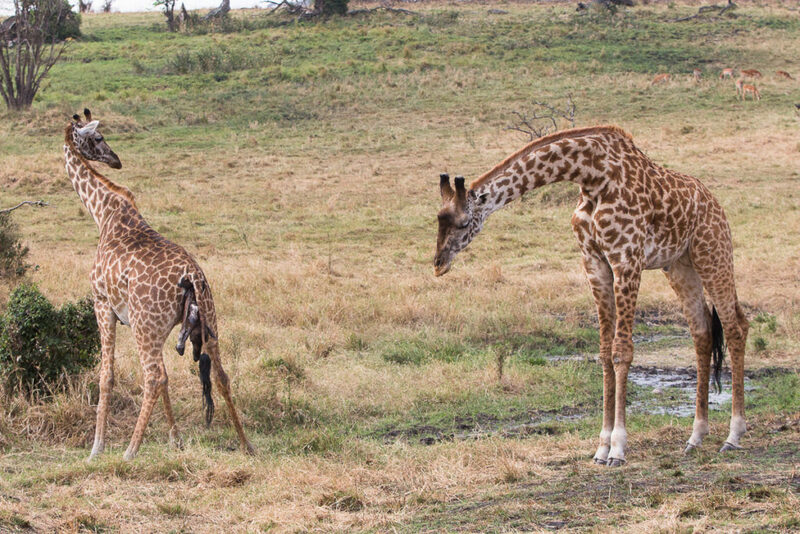 We fell asleep at 10:30pm and had a nightmare about the poor giraffe from earlier today. 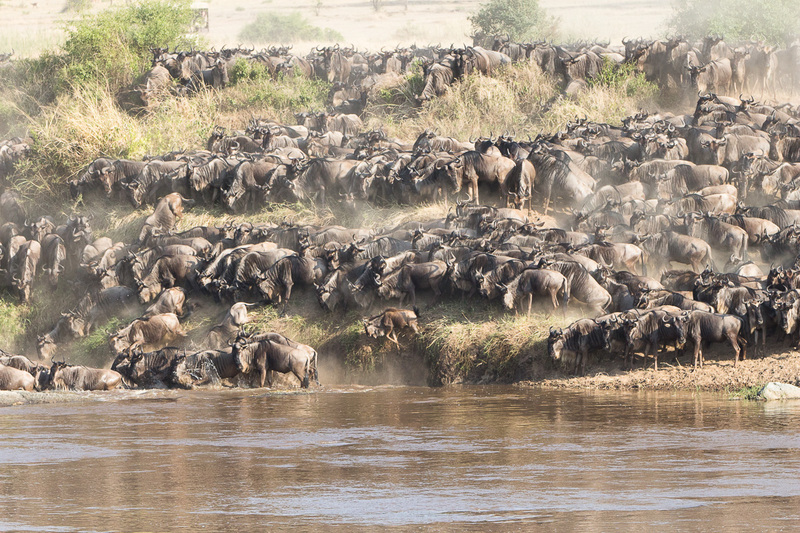 We woke up for 7am breakfast then hit the road in hopes of catching a river crossing. We did not have to wait long! The first crossing started a few minutes after we arrived. 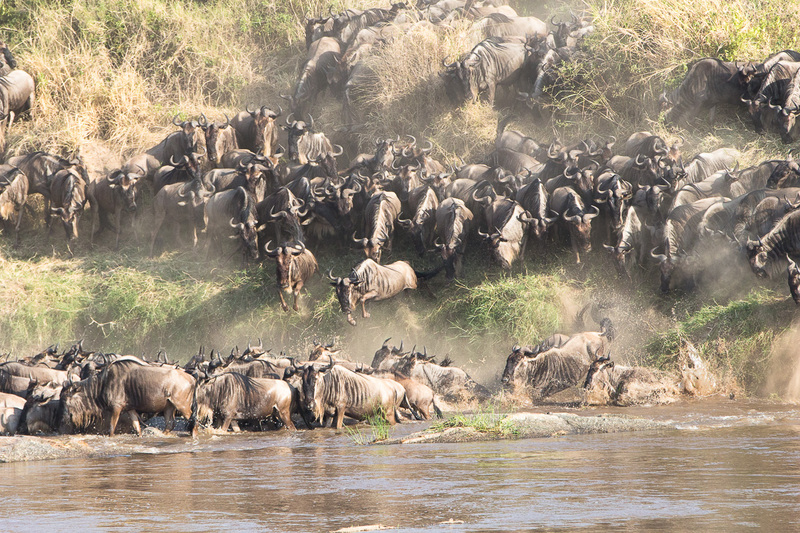 Literally thousands of wildebeests from Kenya jumped, swam, waded, danced, and pranced over to Tanzania. It is quite amazing to see this miracle of nature. 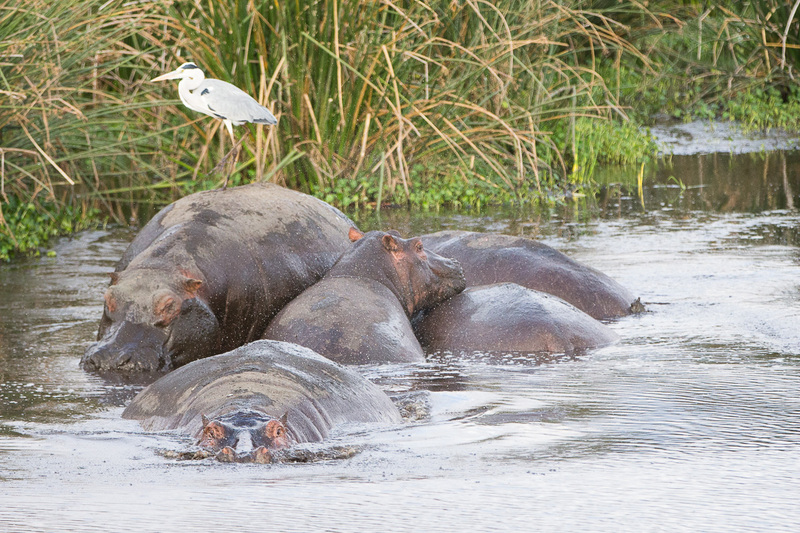 They all jumped into the river in a single file line. There were just so many! I think this is one of the wonders of the natural world. Tangent note: A lion just growled outside somewhere, while I was writing this journal entry! 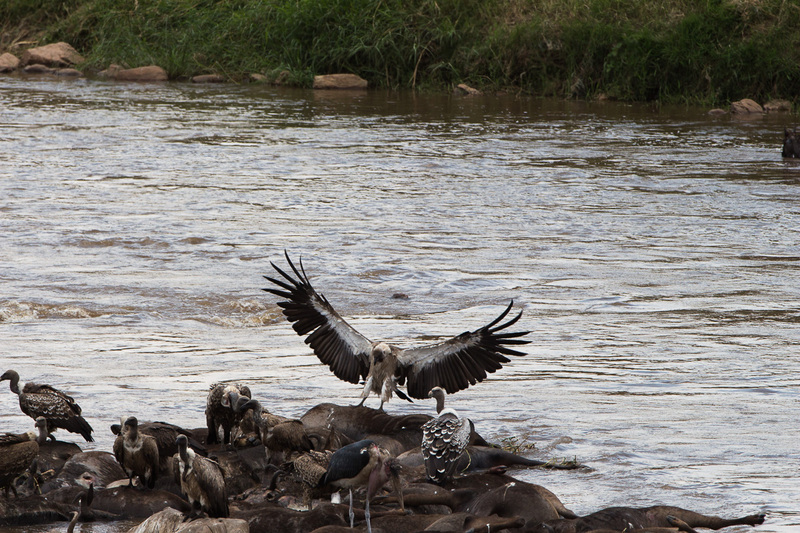 Anyway, we watched them cross for about 50 minutes (that’s quite long). 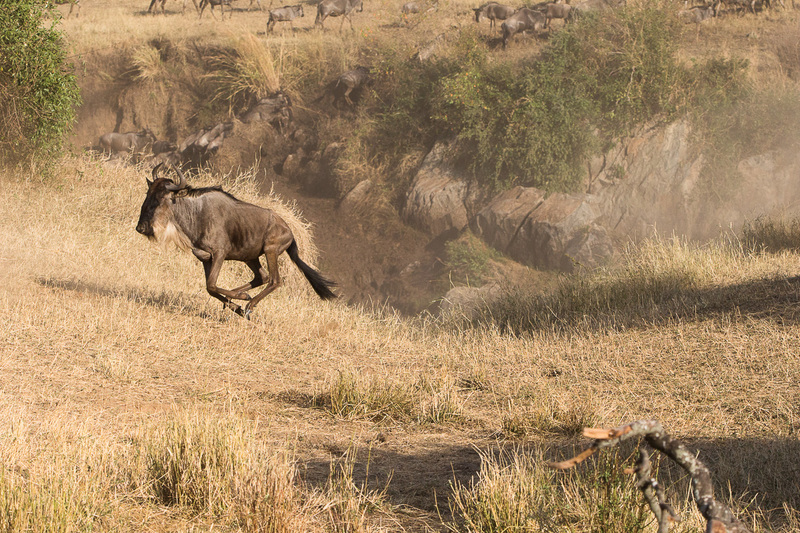 This crossing point had a steep ledge so we snapped some amazing action shots of wildebeest leaping through the air! We drove to another spot to wait for another crossing. There are about 13 popular crossing sites along the river. 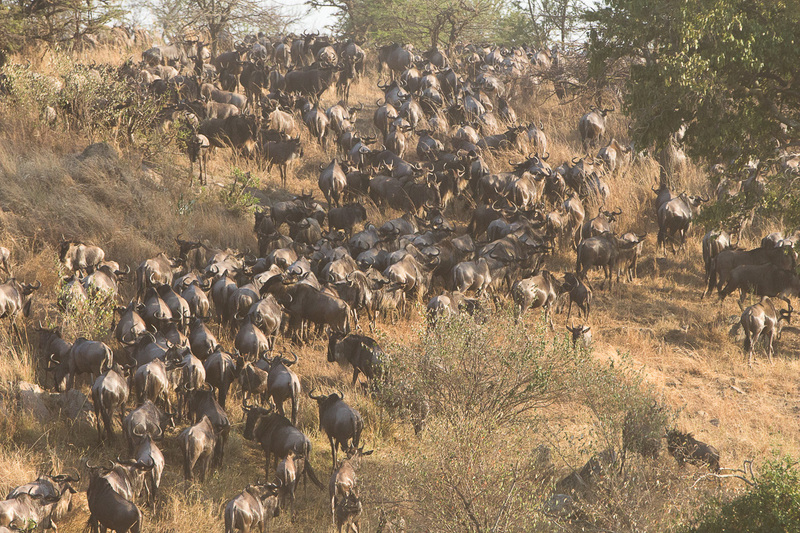 The wildebeests usually cross at site 2 or 3. 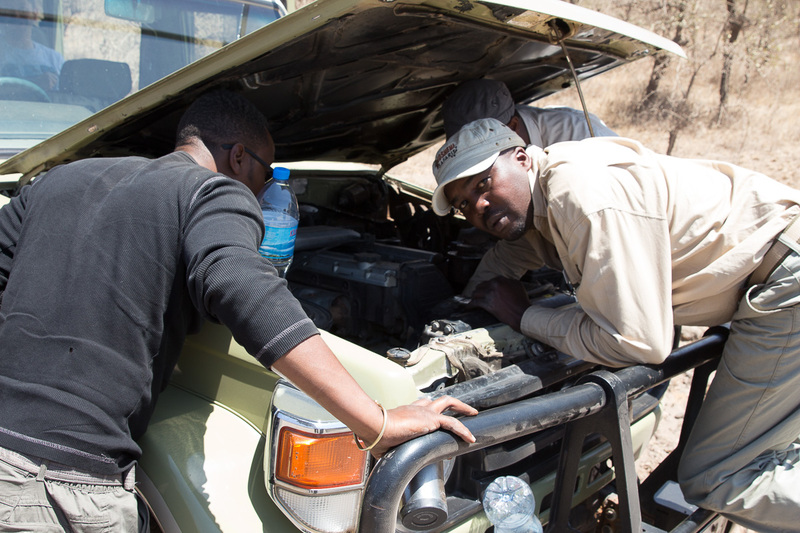 Along the way, Zadoc helped another safari truck out of a ditch. The other day he helped fix another truck by putting a tea bag into the radiator to stop a leak. 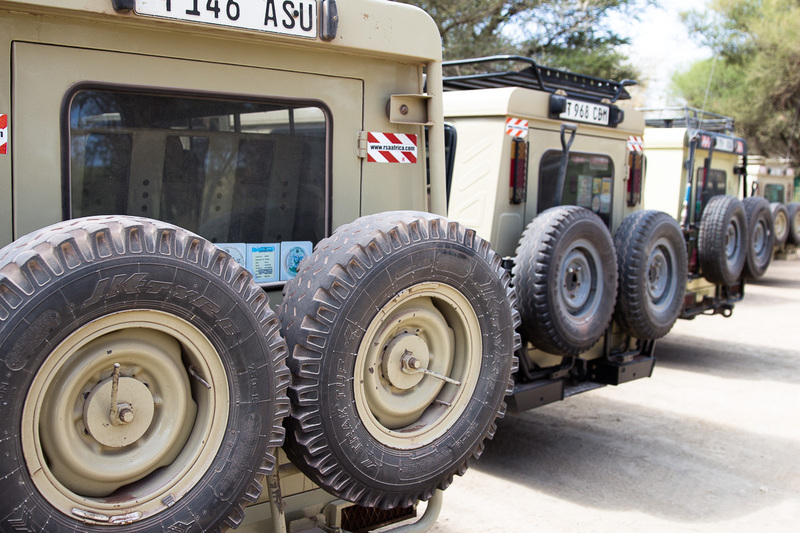 Some drivers are not as helpful with information or vehicle support. The drivers often call each other on the radio and tell each other sightings and other gossip. Whenever trucks pass each other, they stop and chit chat. 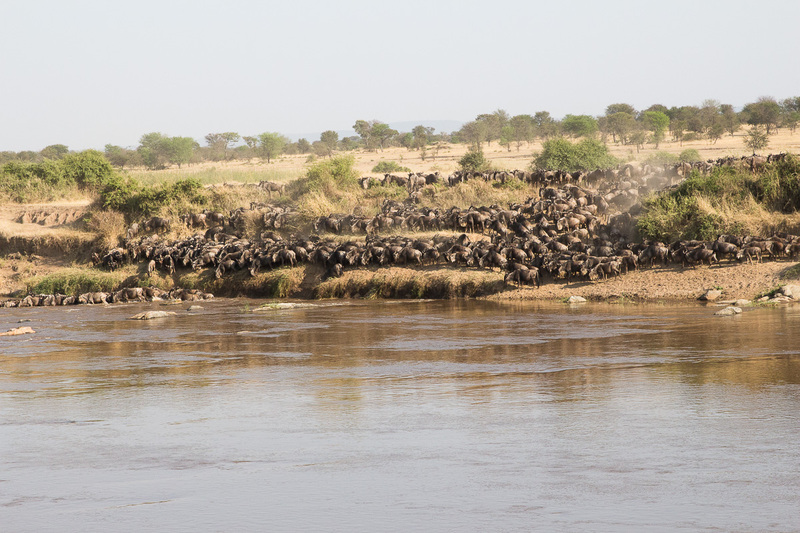 We didn’t have to wait too long at the second crossing site when the wildebeest started to jump in! 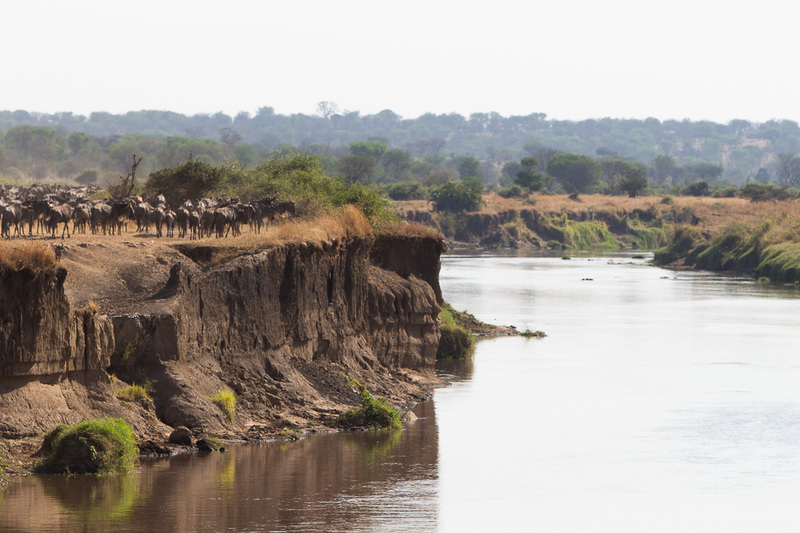 This crossing was really cool, we saw a Nile crocodile grab one and spin, though we didn’t see the croc surface. 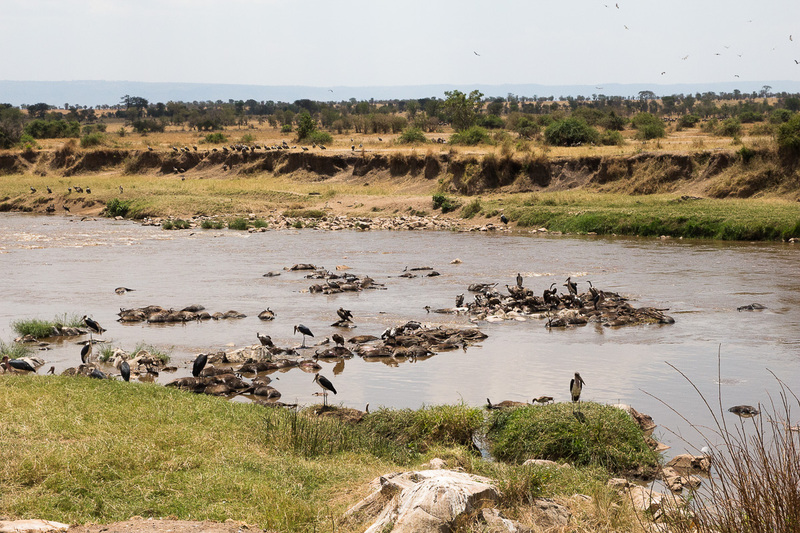 Hippos and crocodiles are all over this river. 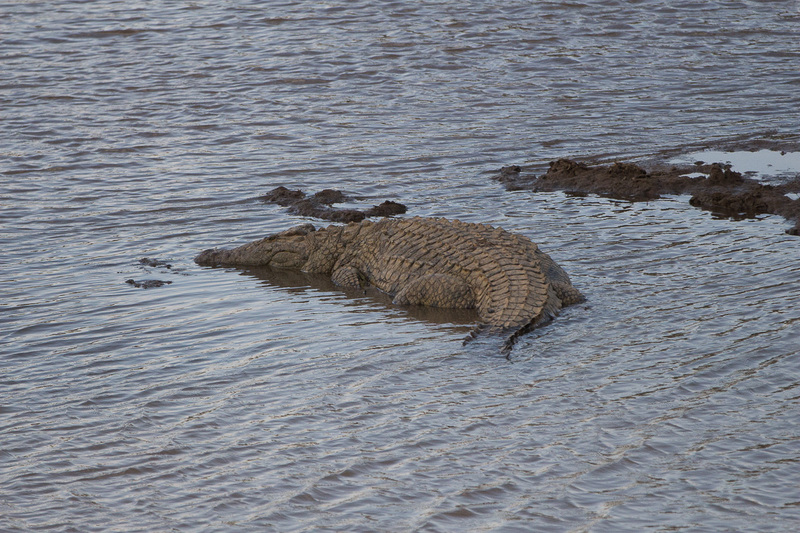 We were hoping to see an epic giant crocs battle. 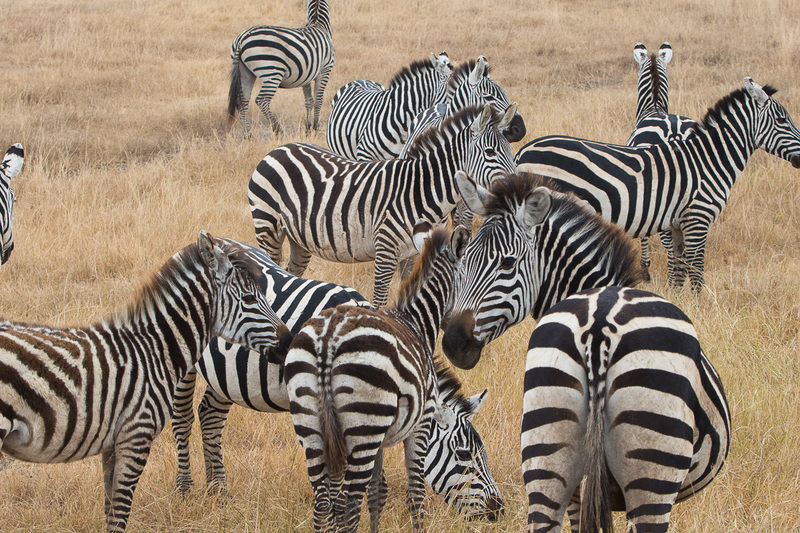 Few zebras crossed with them. 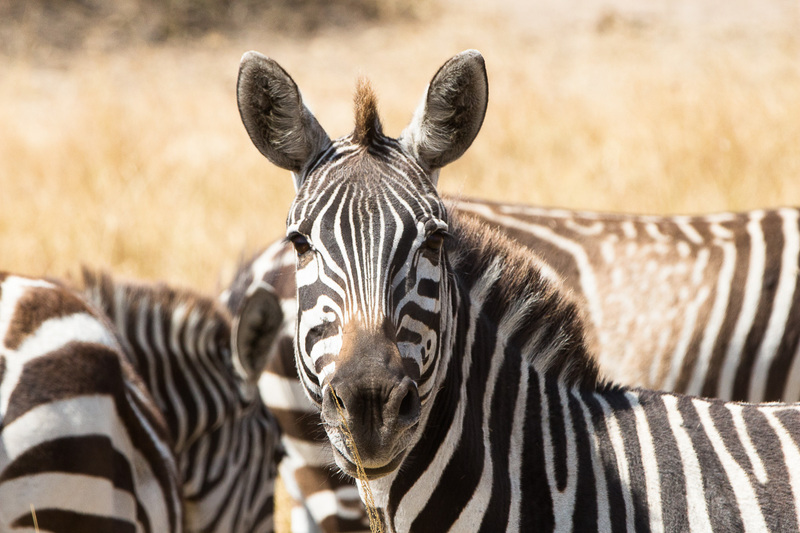 Zebras are supposed to be smarter and often cross at safe places as they can remember things better. 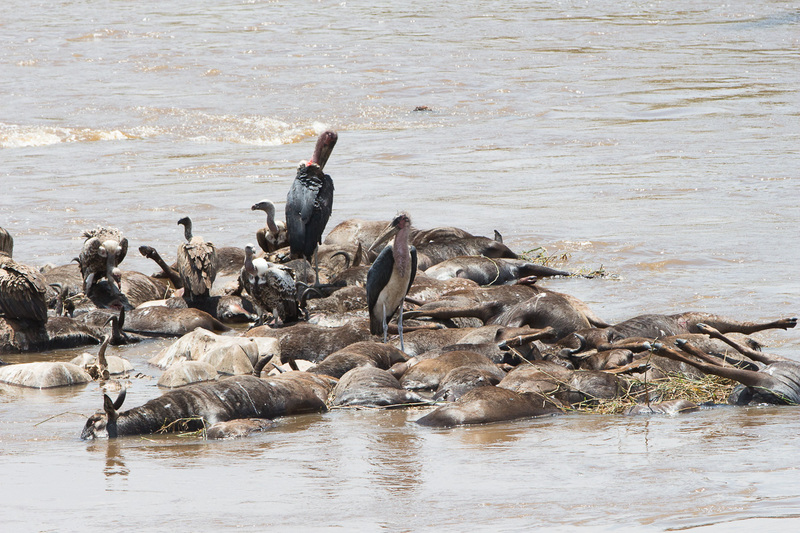 Once the action ended, we drove further downstream to look at a bunch of dead wildebeests washed ashore and gigantic birds of prey eating them yuck. The stench of death was thick and gross. 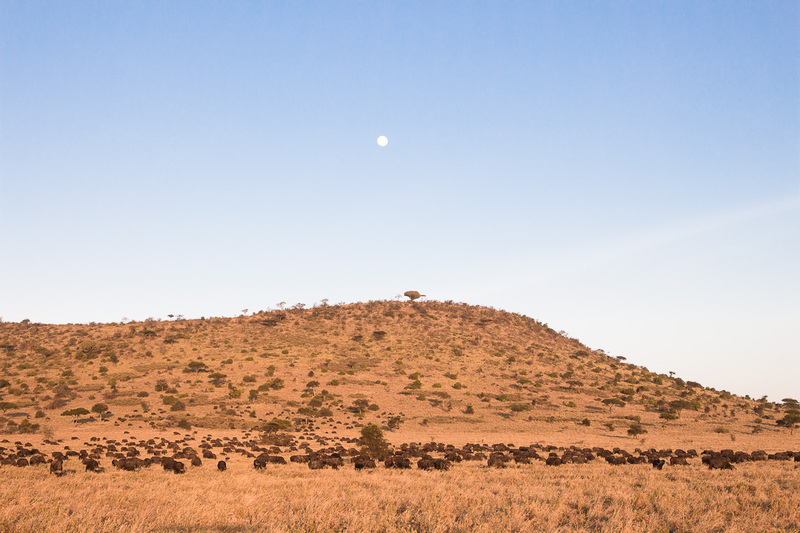 At some point, Zadoc received a call about spotting black rhinos! 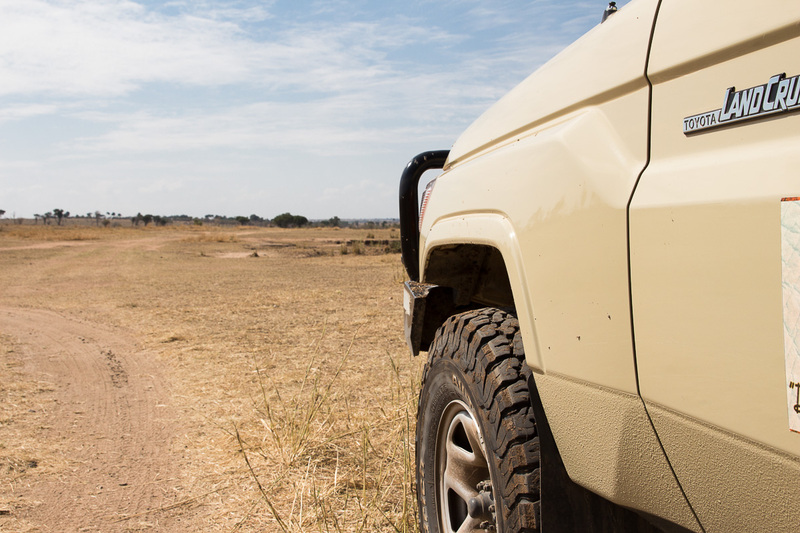 We took off and headed into another area and had to really go off-roading. 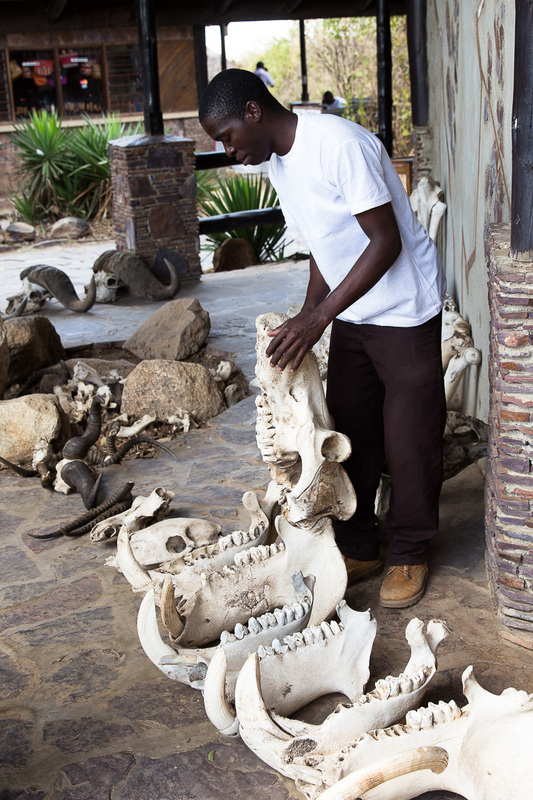 Rhinos are very endangered as they are poached for their horns, especially the smaller Black Rhinos. 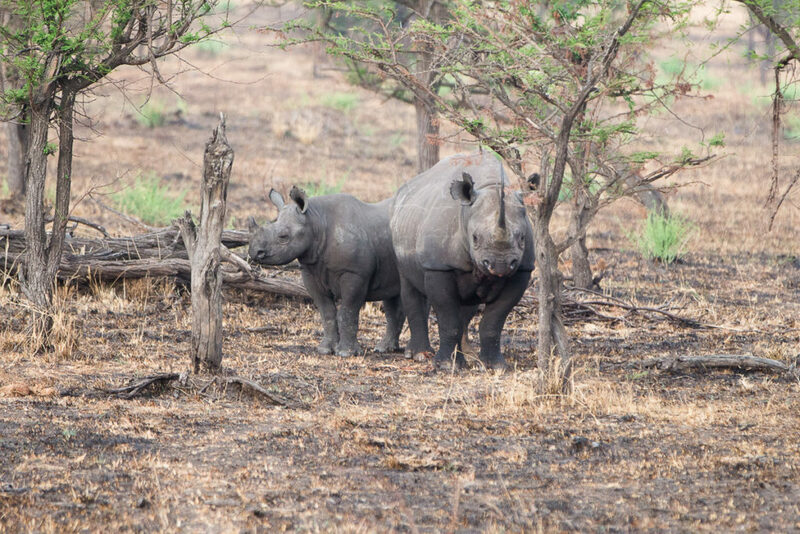 Rhinos are also very fast and dangerous animals, often charging at strangers to protect their young. 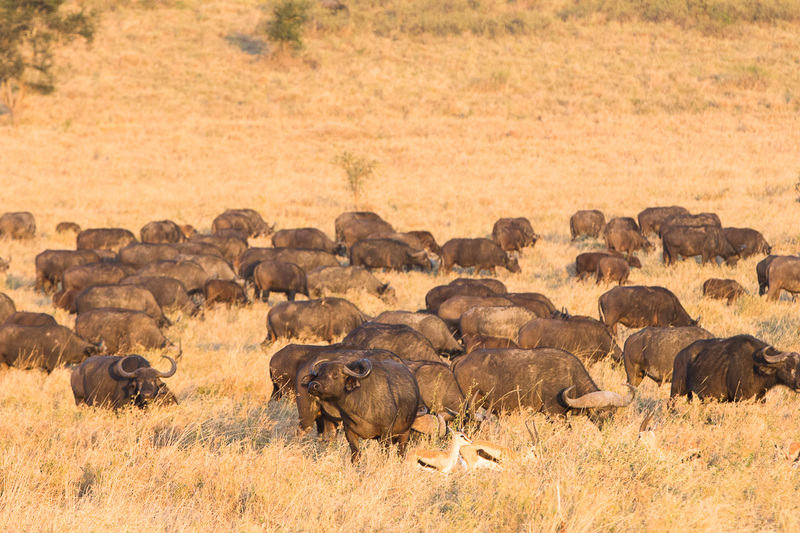 Of the Big Five animals, Black Rhinos in particular are hardest to find. 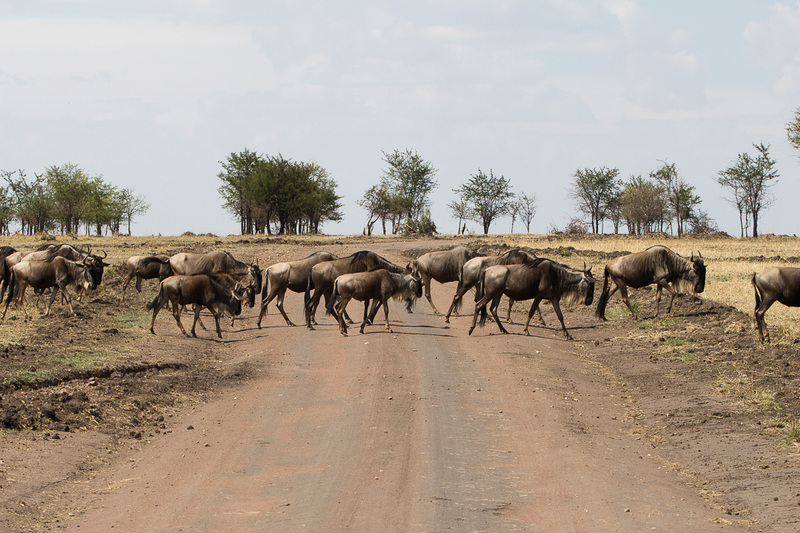 It took a while to find them as the North Serengeti doesn’t really have “roads” but alas we did! 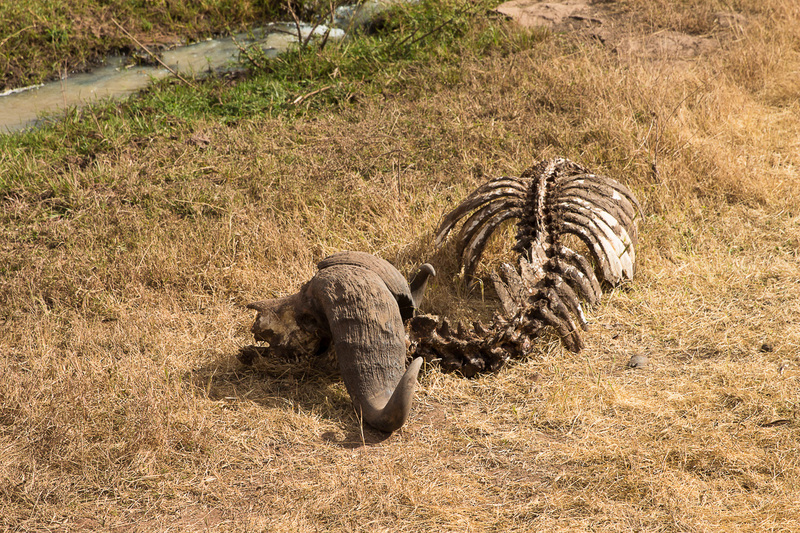 The mother and baby rhinos were a real treat to see. 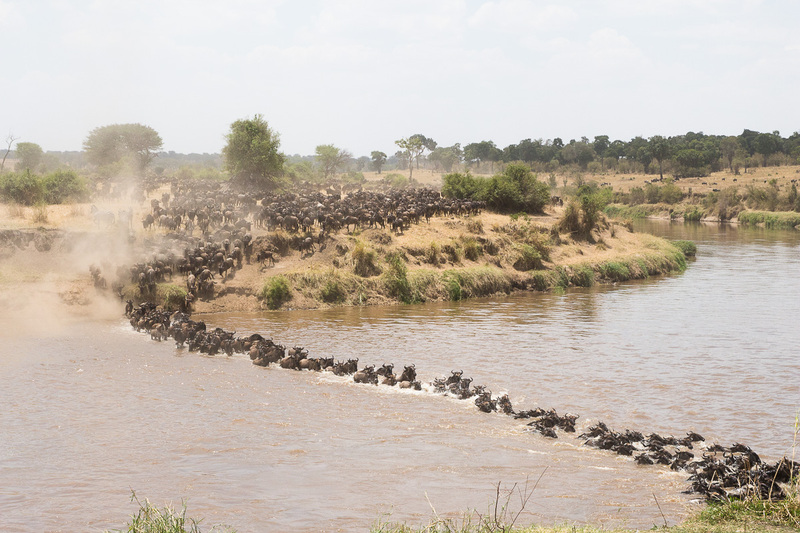 The rhinos looked territorial and startled so we took our pictures and jammed out of there. 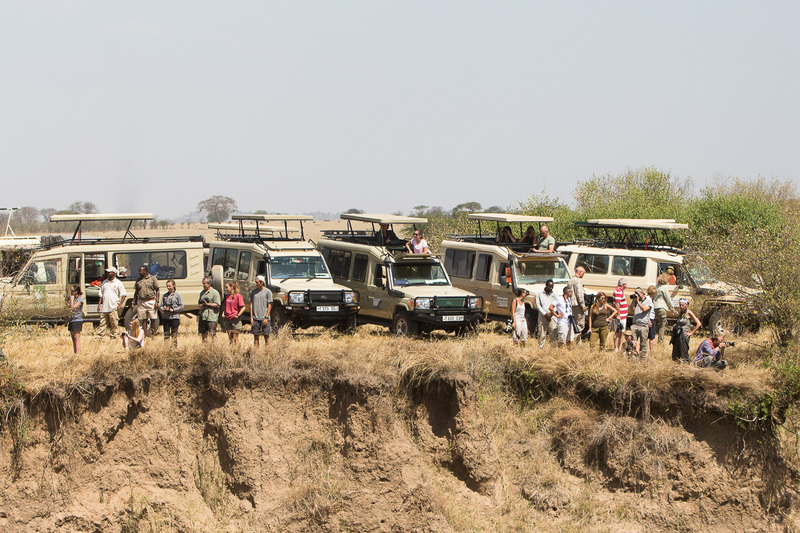 Moments later we saw a group of jeeps admiring a leopard sitting on a rock! So cool and so pretty. 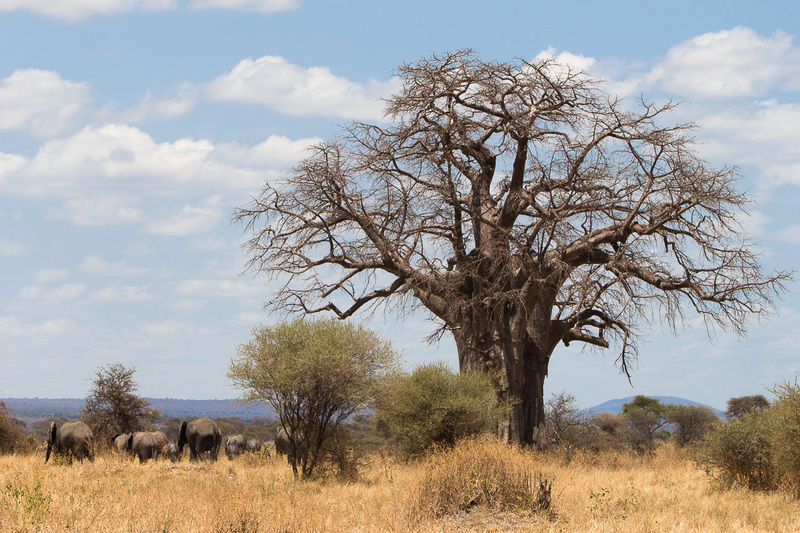 It’s hard to spot leopards. See what I did there? hehe. It was late and Zadoc was worried that he would get in trouble for driving past the park curfew (it gets VERY pitch dark once the sun sets so not only is it dangerous to see but easy to hit animals at night). We sped back to the Kenzan camp and luckily avoided the ranger station at the airport. 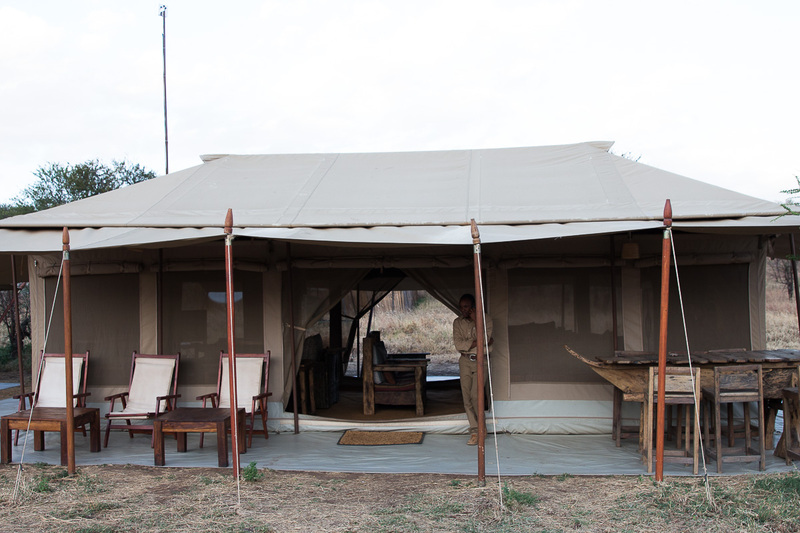 It started to pour when we arrived back at camp, even though the weather had been very moderate during the day. 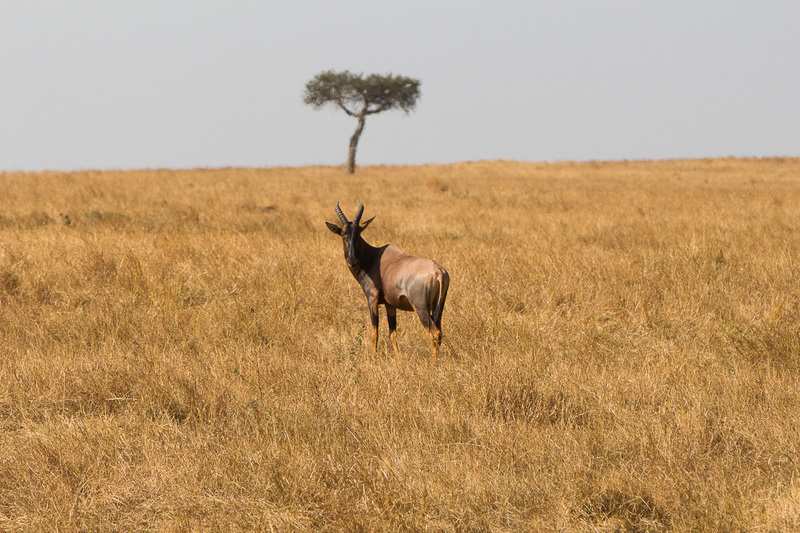 We feel very fortunate to be in the Serengeti. 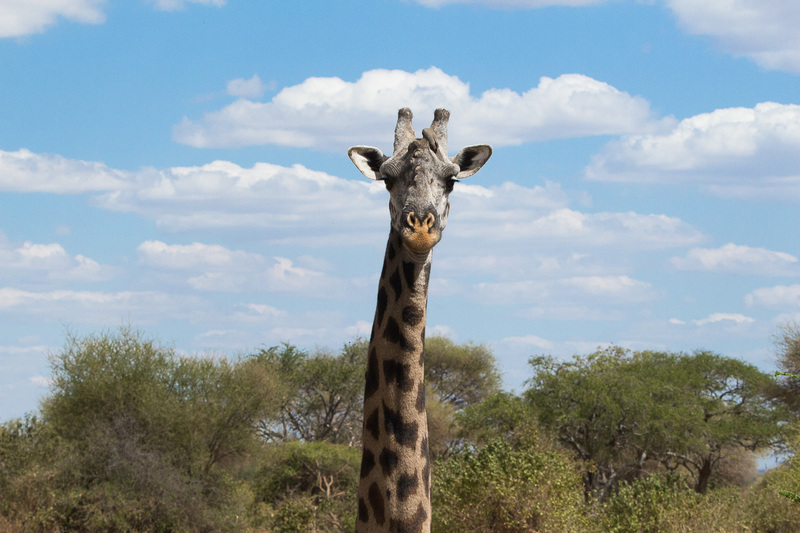 There are so many wonderful animals and people to meet. 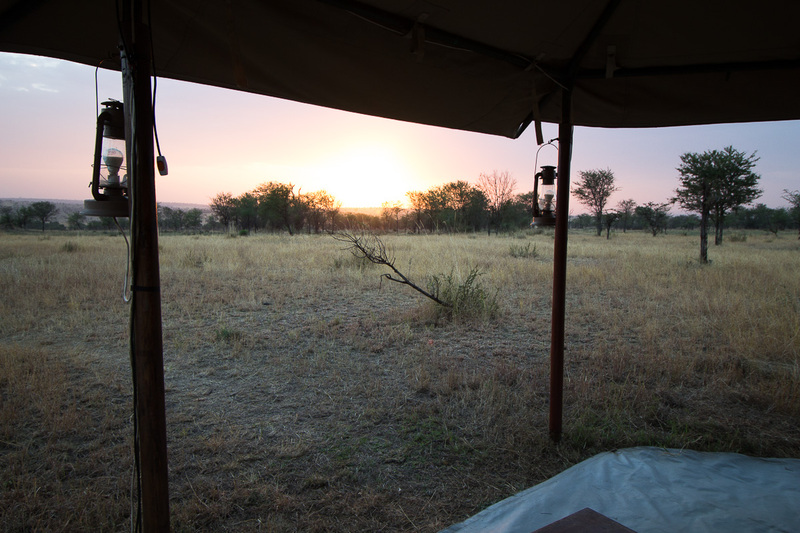 [Note: We are sitting in our tent looking at the wildebeest, listening to the thunder, and watching the golden red and orange sunset.] 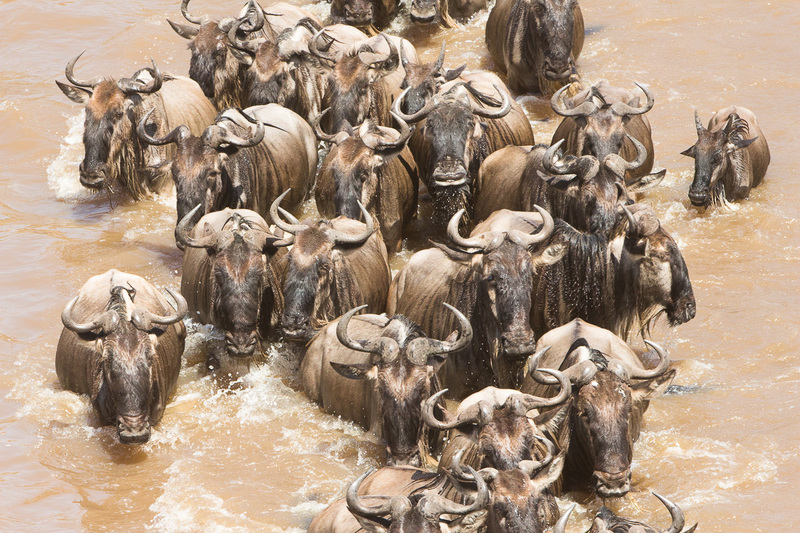 Today was a bust in terms of animal sightings or river crossings. It’s ok, we are grateful to spend time in nature a world away from home. 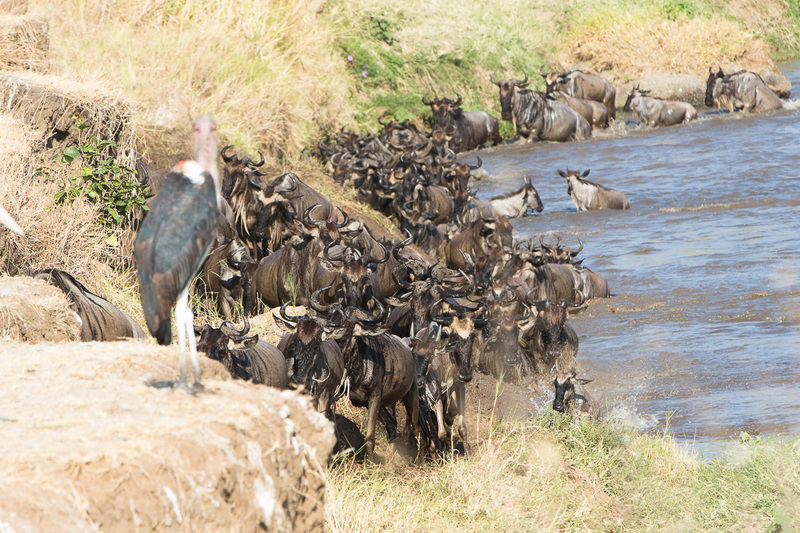 From 7:30am – 1pm, we sat in the jeep waiting for the wildebeests to cross. Nothing. So we headed back to camp for lunch. 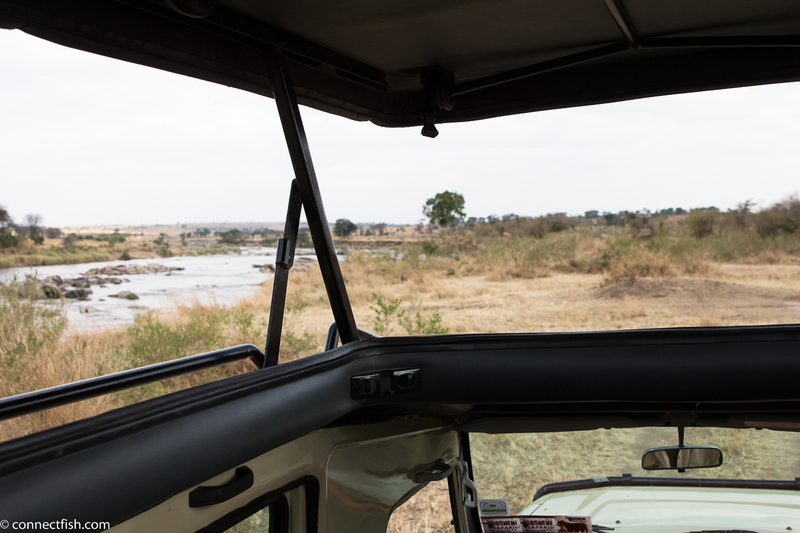 An hour later, another jeep came back and reported the wildebeest crossed for a mere 5 minutes, but we missed it. Oh well. 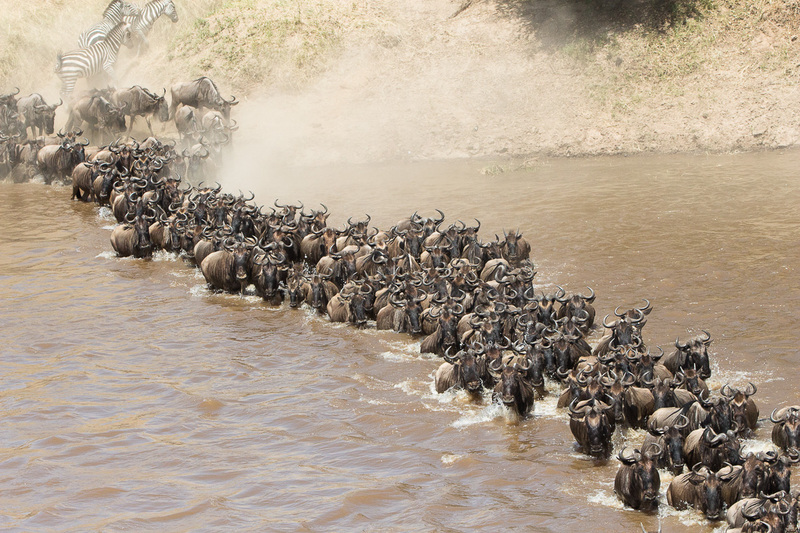 Then at 2:45pm, we left camp to find another crossing. Nothing. 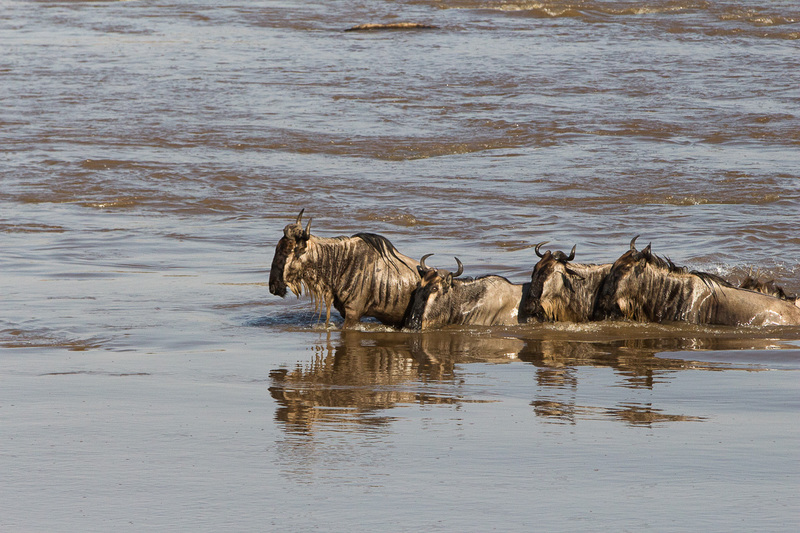 So many wildebeest were milling around close to the water, but none decided to take the plunge. 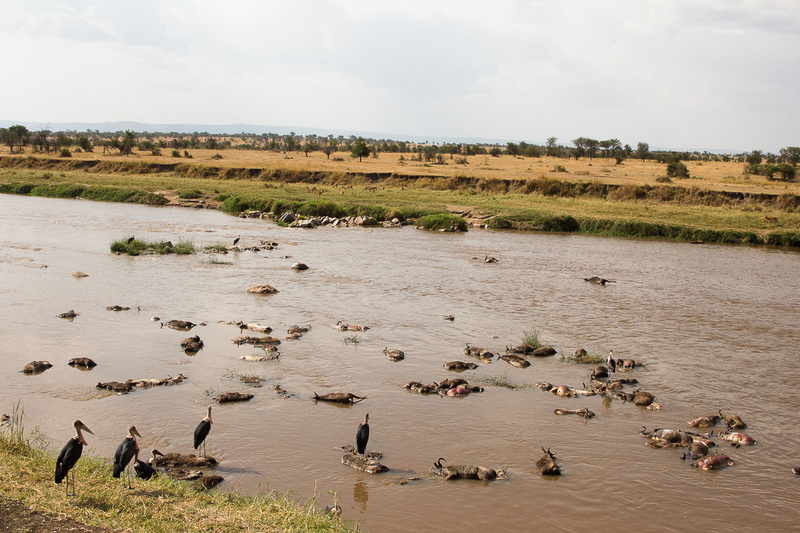 So we went back to admire the dead bodies of wildebeests floating in the river. 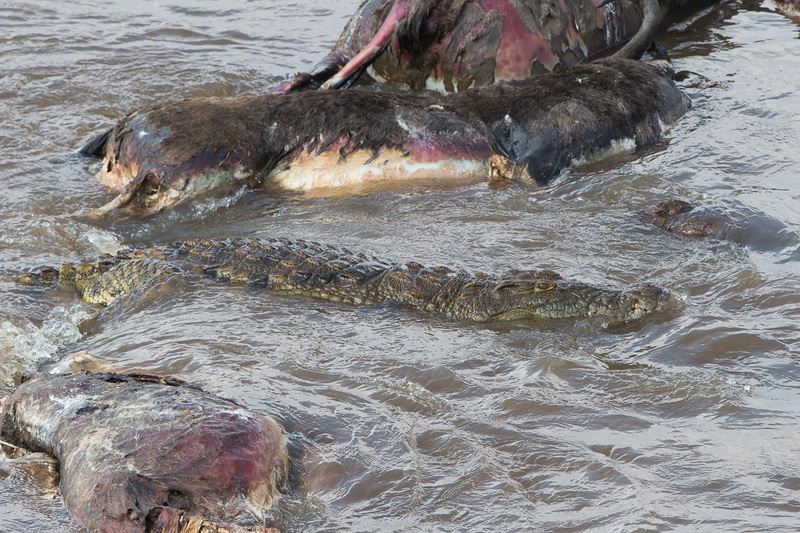 Many crocodiles and birds were feasting on their bloated dead bodies. Yuck. The stench of death was overwhelming. We are getting more bug bites here, so hopefully no Malaria or Zika! We came home early for a shower before dinner. 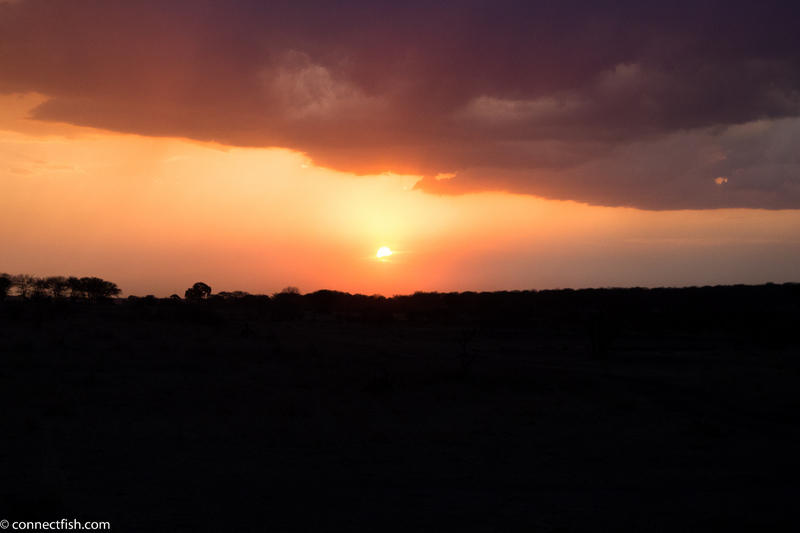 Amazing to see the heavy African rain tonight. We woke up at 6am and were on the road at 6:30am. Nada. Nothing. We drove around in circles waiting for a crossing. There were a few false alarms. We sat at site 4 of 13, wearing bee keeper-like suits. 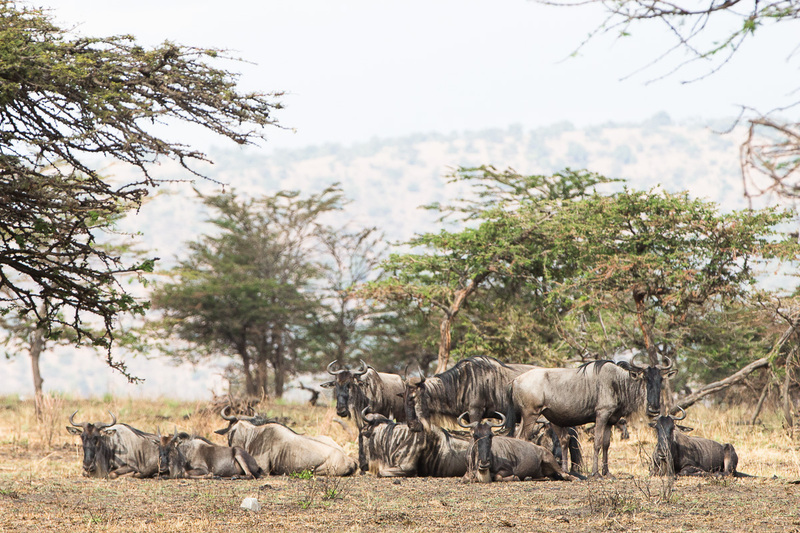 Wildebeests were chilling on the Tanzanian side, just taking their sweet time. 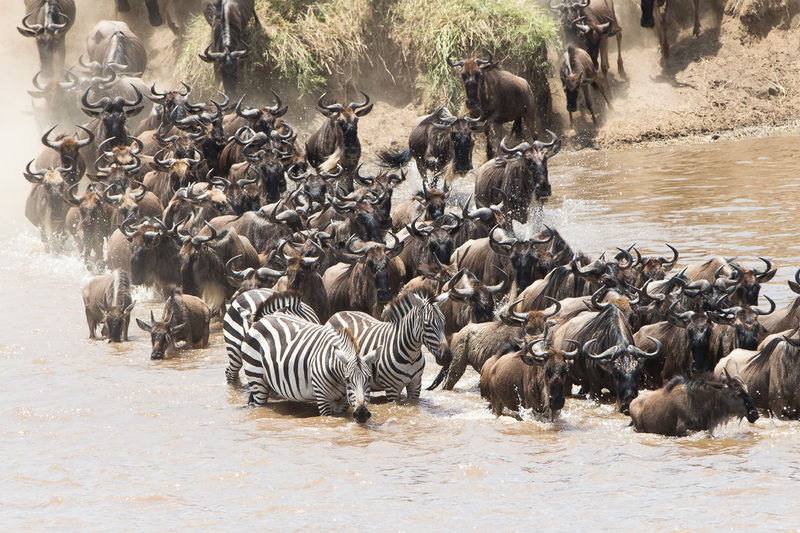 Finally after much waiting, we saw a crossing! 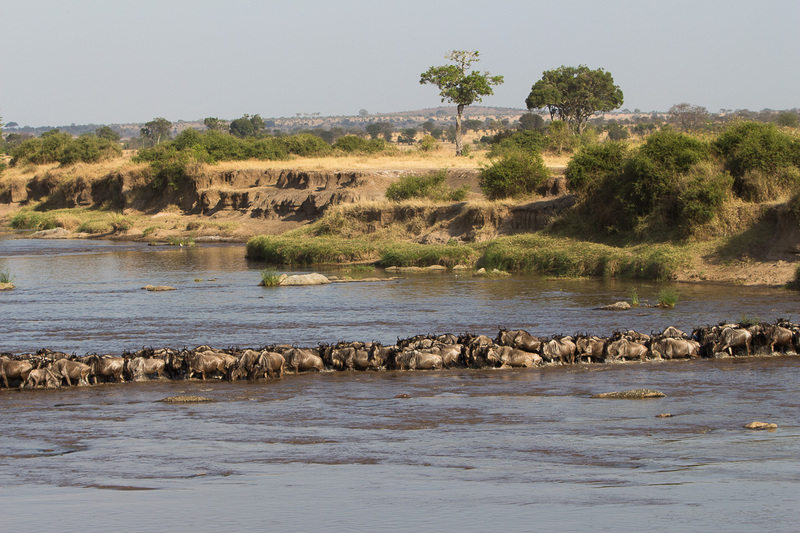 A pod of elephants by the river were blocking the way for a while and tried to scare away the wildebeests. 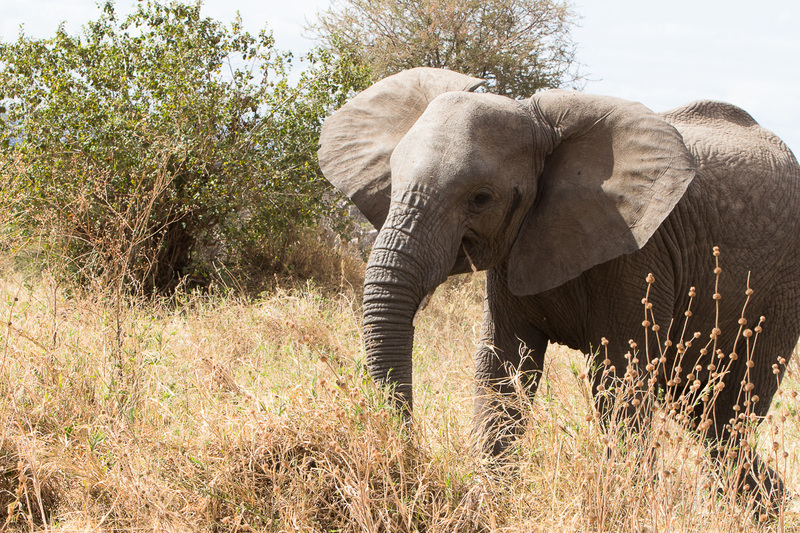 For once, I didn’t find elephants very cute. 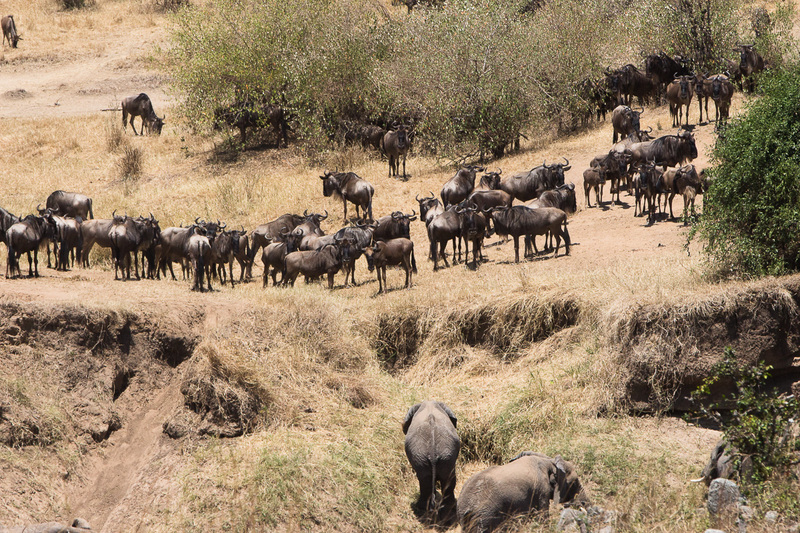 But after much circling, the wildebeests decided to cross. 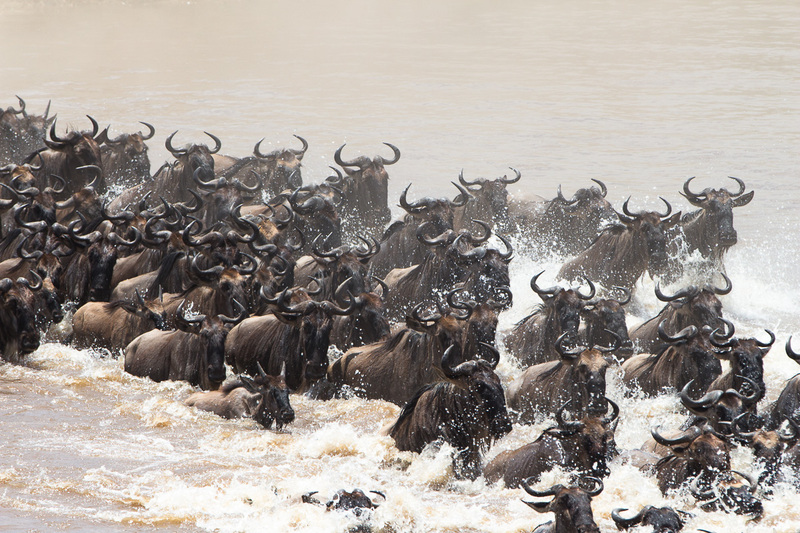 Cars raced over on both sides of the river and we witnessed an exciting crossing. 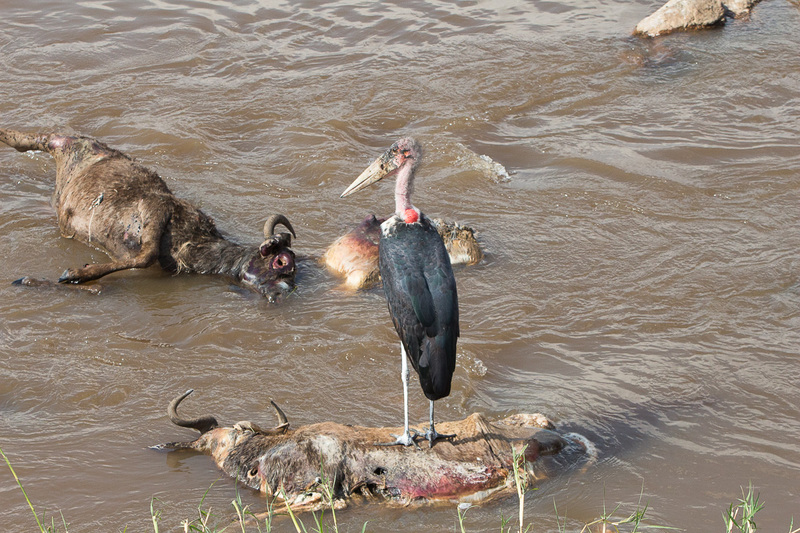 One wildebeest died and floated away. 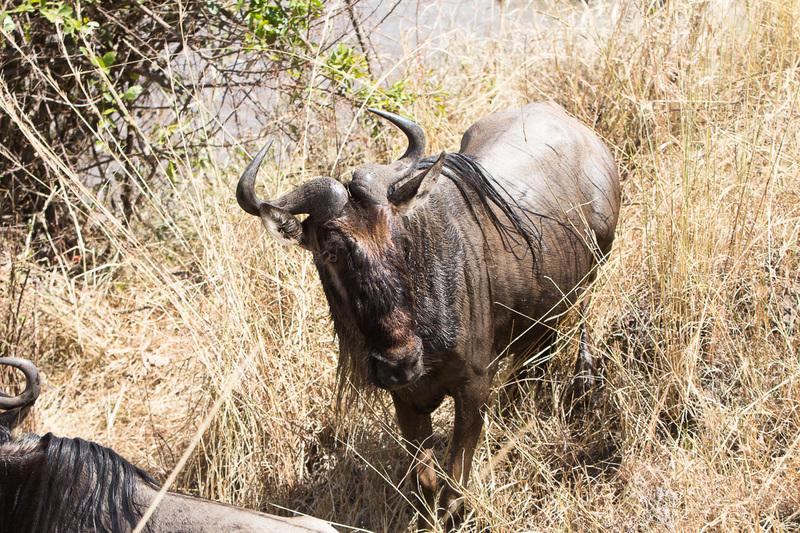 Another poor wildebeest broke his leg somehow and barely made it to the other side as he limped out. It’s a treacherous journey. 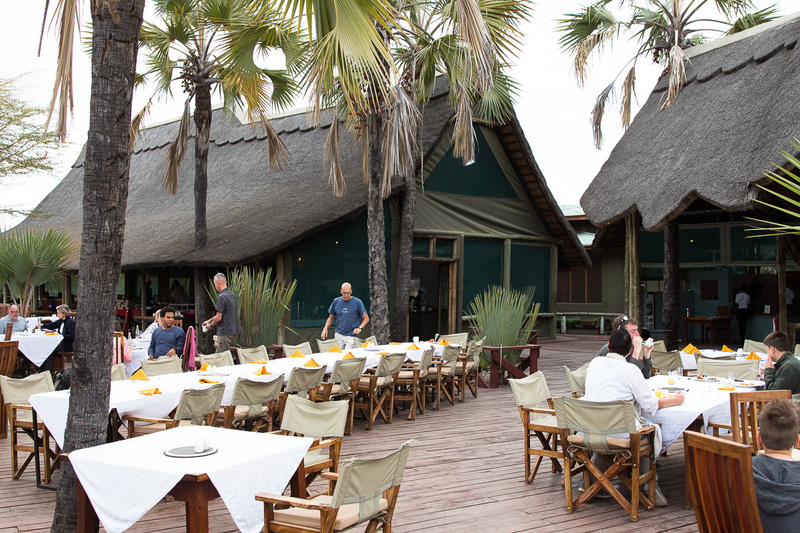 We would like to try more local Tanzanian food. 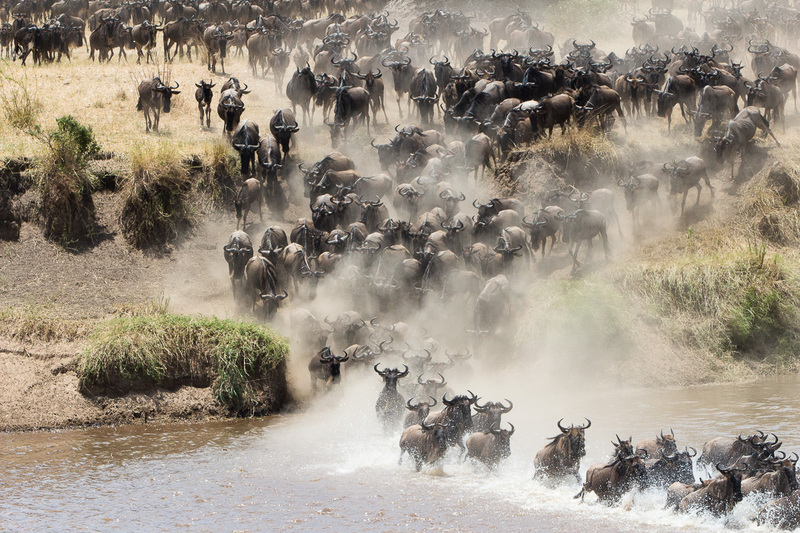 In the northern part of the Serengeti, it is more difficult to spot animals, besides wildebeests and zebras. 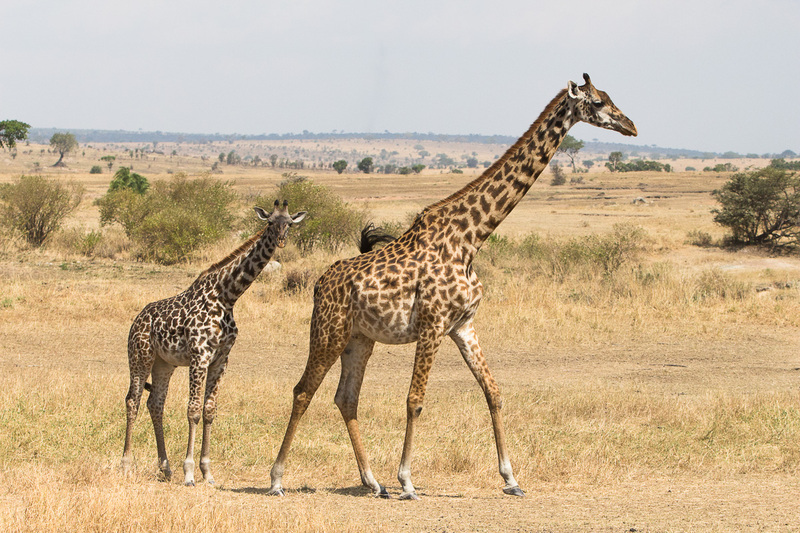 There are a few giraffes, hyenas, crocs, elephants, and hippos, but not many. 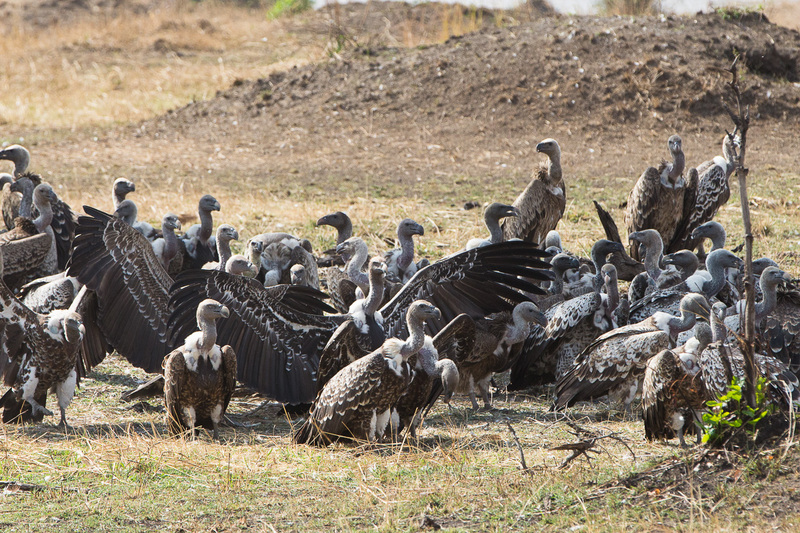 Lots of scavenger birds. Be prepared for a lot of sitting in the car time. 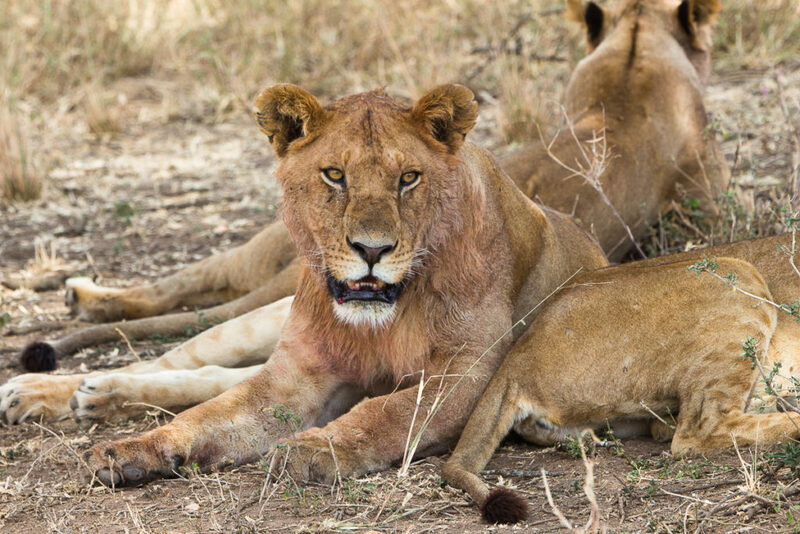 We drove near the Kenya/Tanzania border and saw some lions, up close and personal! 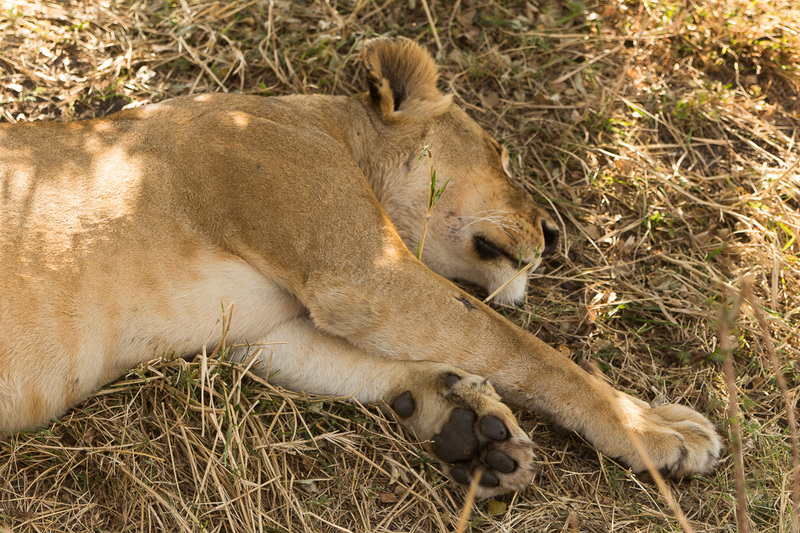 We saw a juvenile lion playing around and an older male lion and female lion sleeping. 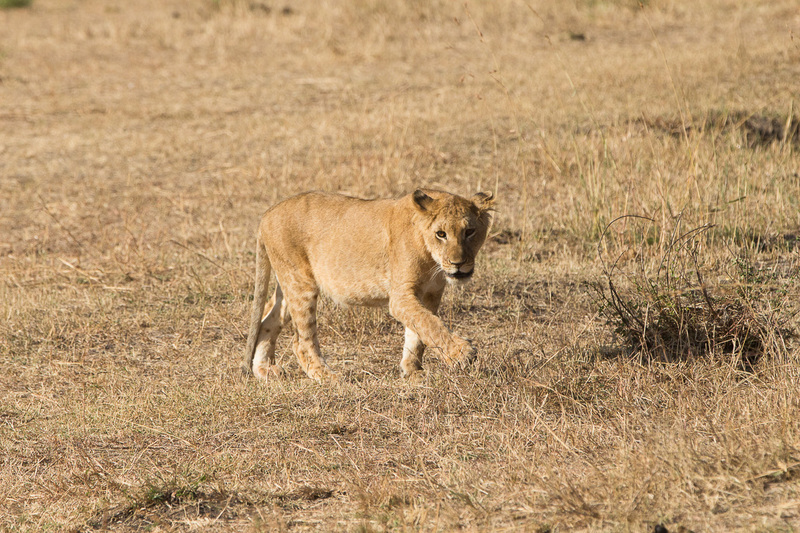 The cub was so cute he ran up towards our vehicles and tried to roar at us! I caught the whole thing on video. 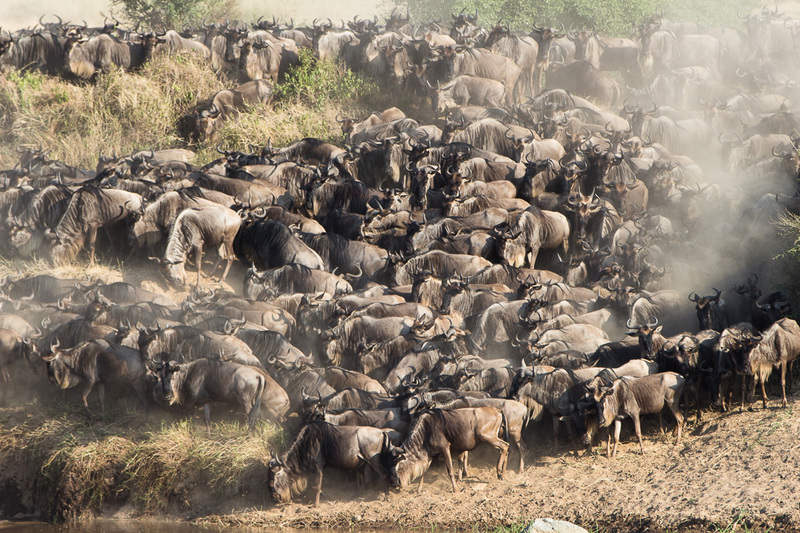 All in all, we’ve been having a great time in the Serengeti. We haven’t had food poisoning yet, knock on wood. Tomorrow will be an adventure flying in a tiny Cesna plane. 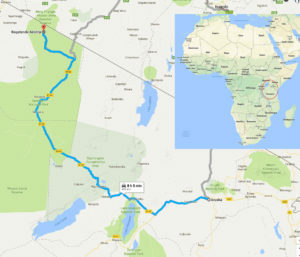 Yikes, but it was better than a bumpy off-road drive 10 hours back to Arusha! 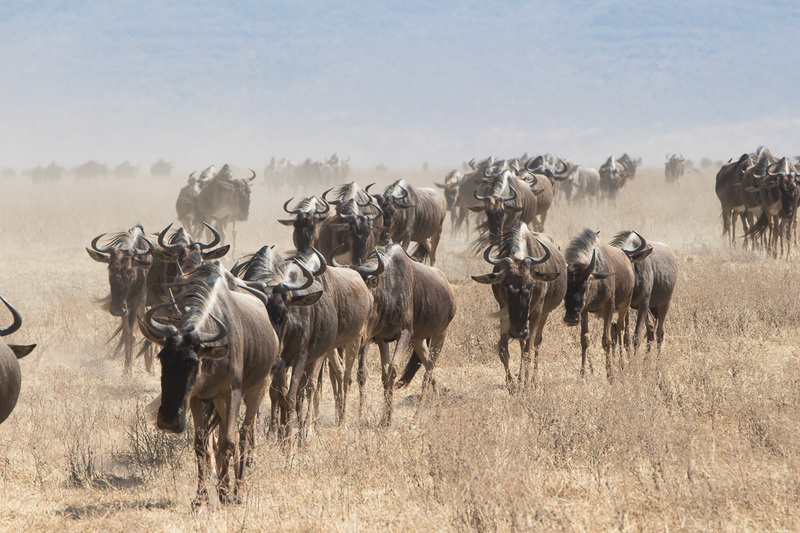 The night was filled with mooing from the wildebeests (aka Gnus), doing their thing outside our tent. 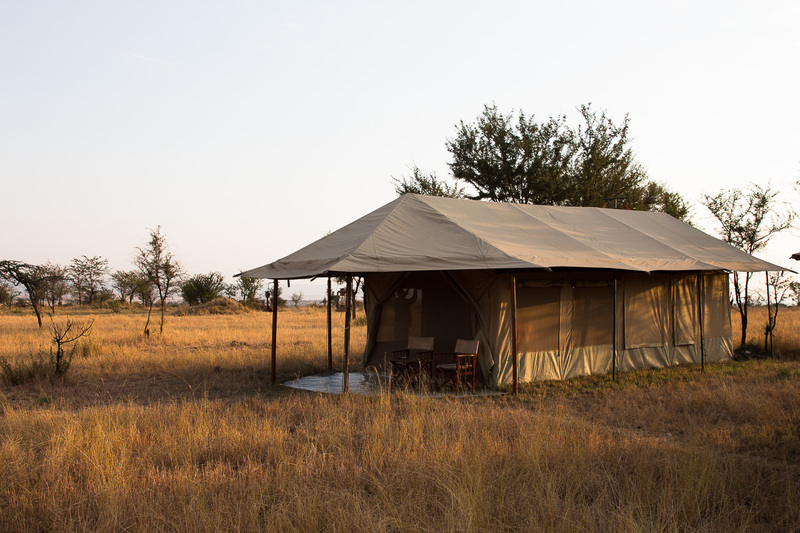 There must have been a hyena or warthog outside our tent because I swear it sounded so close like it had gotten inside our tent! 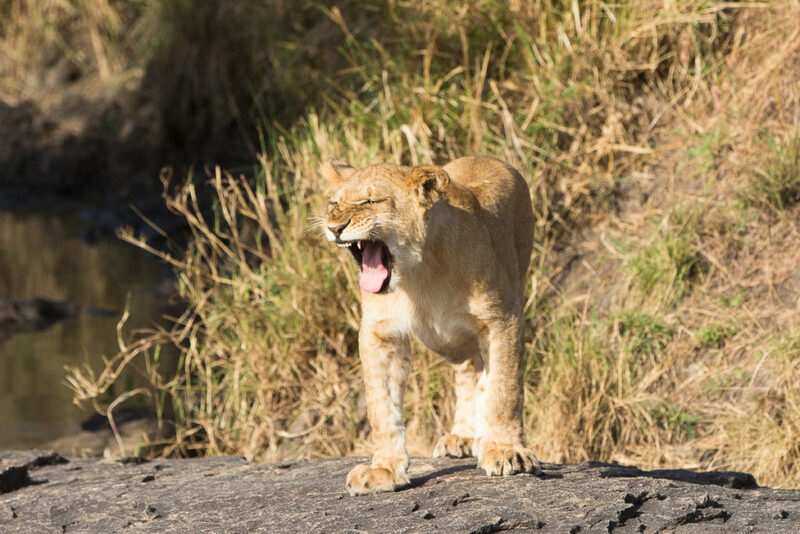 In the early morning I heard roaring and Zadoc told us later it was a leopard since it was not nearly as loud as a lions’ roar. 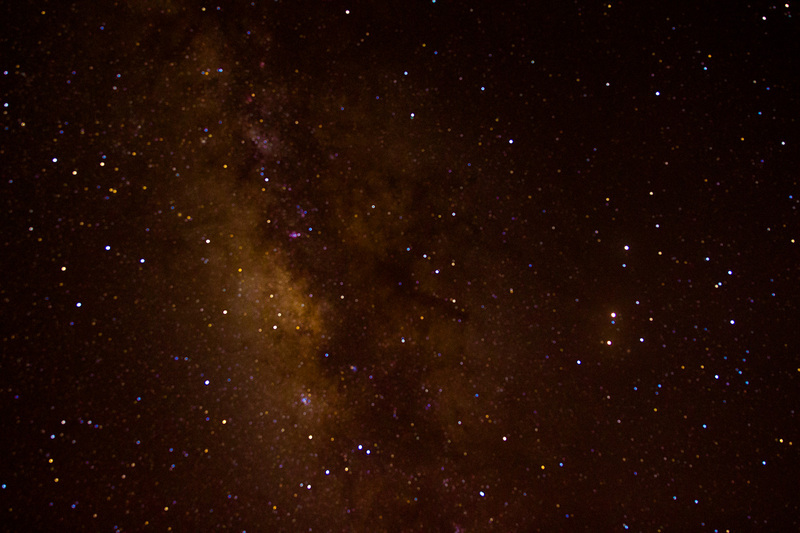 We also took some evening Milky Way photos. I am a champion and you’re gonna hear me roar! 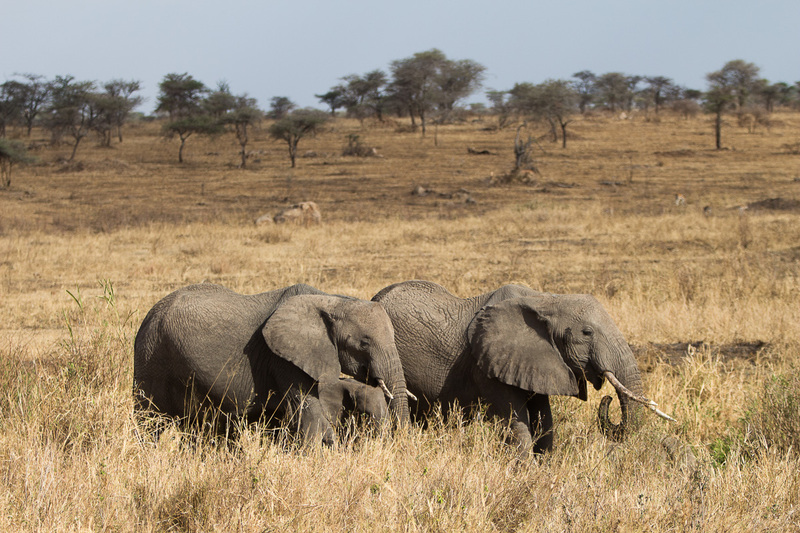 Our last day in Tanzania! 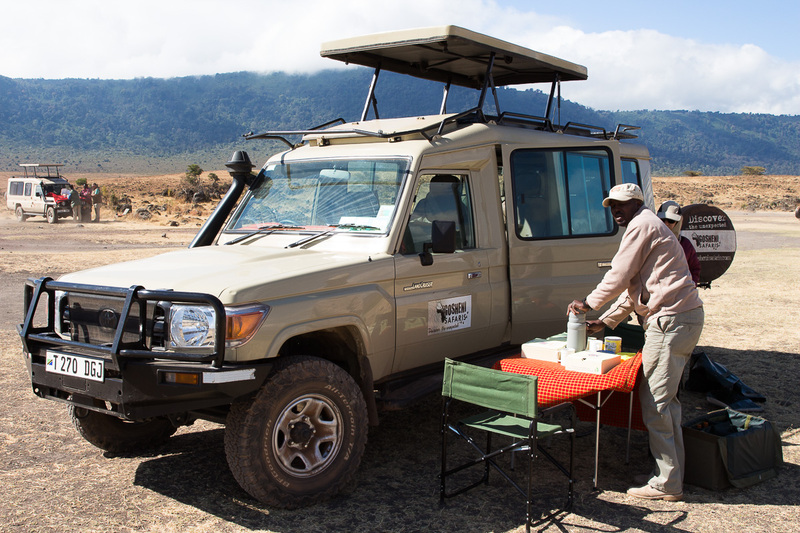 Before we left Kenzan camp we tipped the staff (used the tip box), then headed for a game drive. 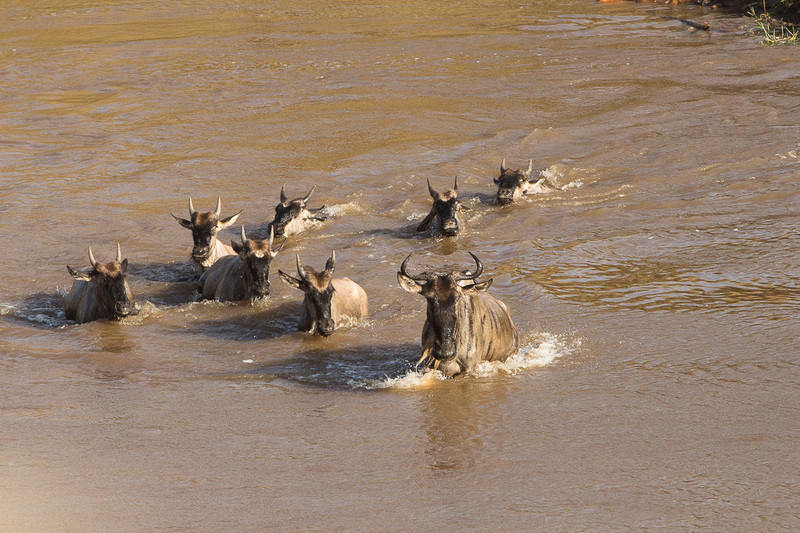 Immediately, Zadoc received word a river crossing started, so we raced over! We saw a very giant dust cloud as we approached site 4, so crazy! 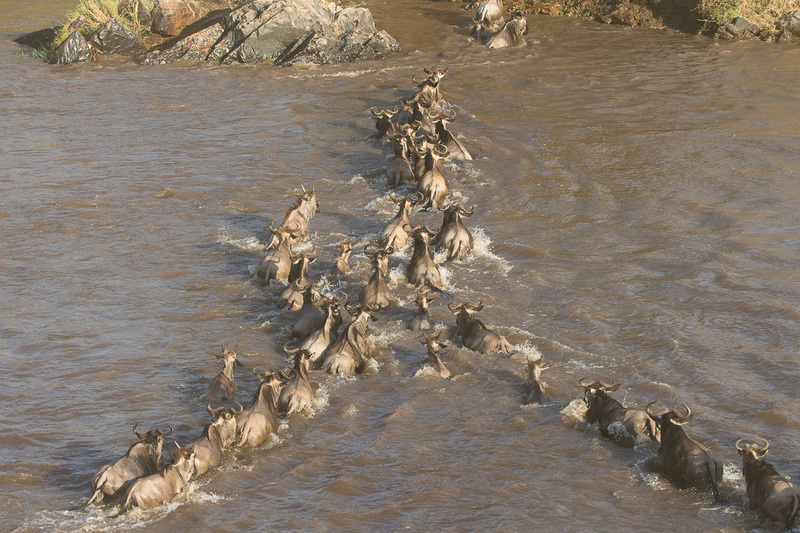 This crossing was huge, and we watched wildebeest cross back and forth, multiple times. 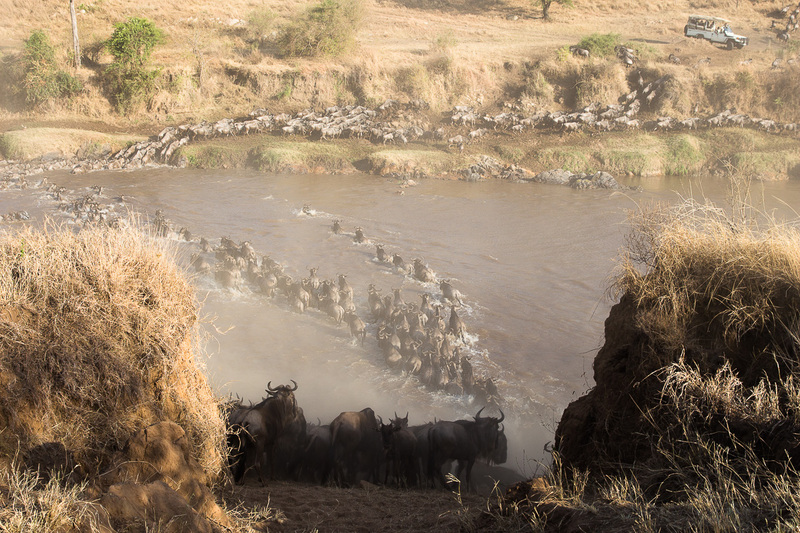 There were hundreds of wildebeest surrounding our jeep as they pushed their way to the narrow path to the river ledge. 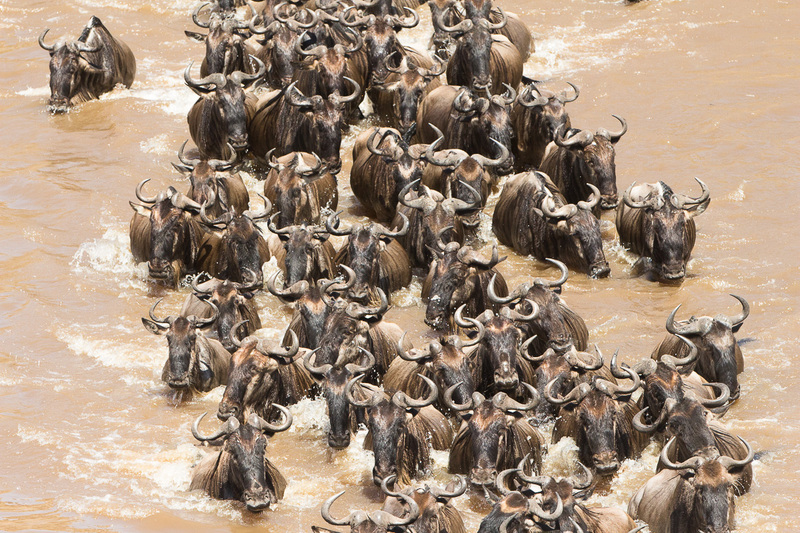 Pretty cool to enjoy, but mind boggling why the wildebeests would want to cross back and forth. So indecisive. 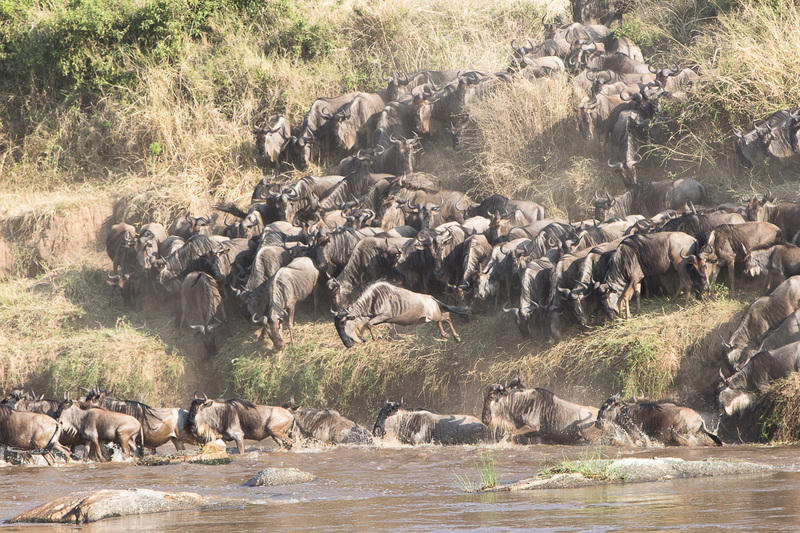 Alas, our time in the Serengeti had come to an end and it was time for our flight. 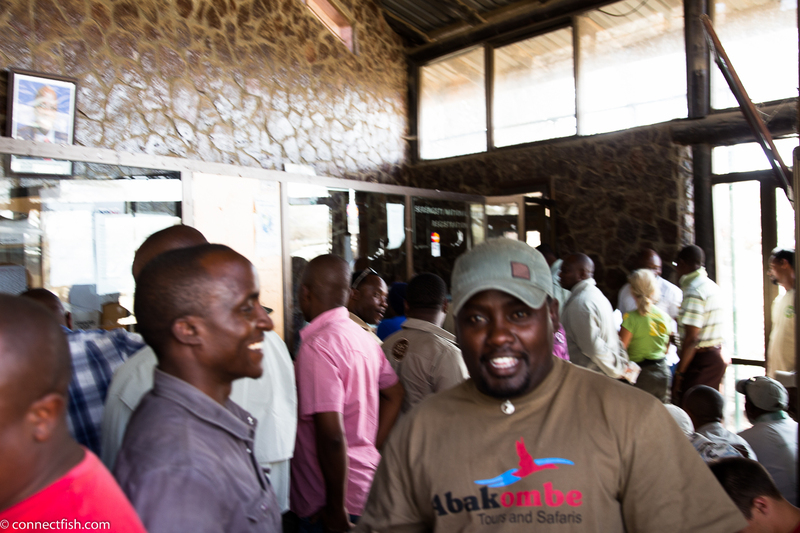 A short drive to the Kogatende airport where we said our goodbyes to Zadoc after eating lunch. We tipped Zadoc and left on a tiny regional plane, Air Excel. 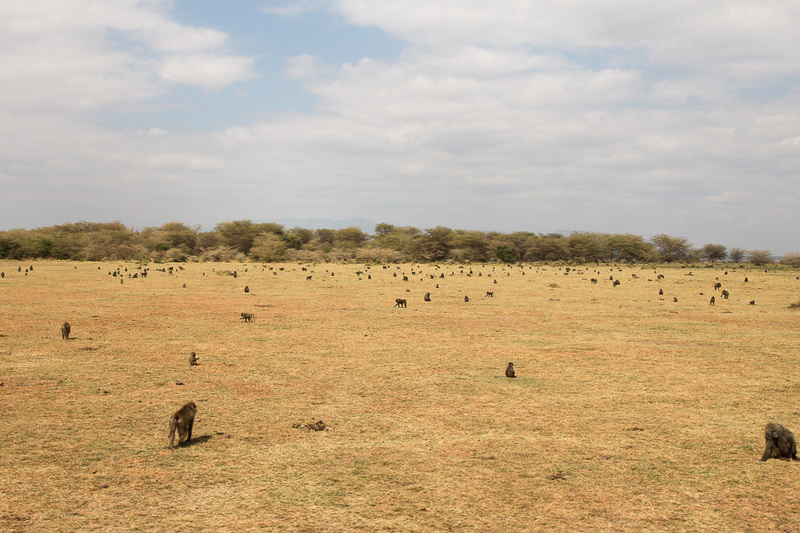 The plane only holds 12 passengers and during our ride we saw tiny dots of animals, Mount Kilimanjaro, and the Olduvai Gorge. 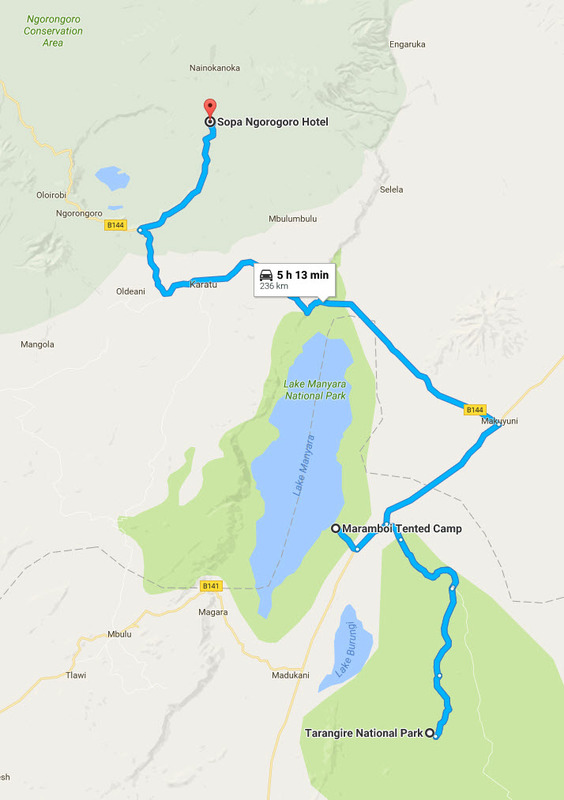 The Mrs. started getting a small headache but luckily the ride was only 1.5 hours to Arusha. William, another driver from Gosheni, picked us up and we paid him $100 USD to take us to the Mama Goodness Coffee plantation, Tegaru Farm. 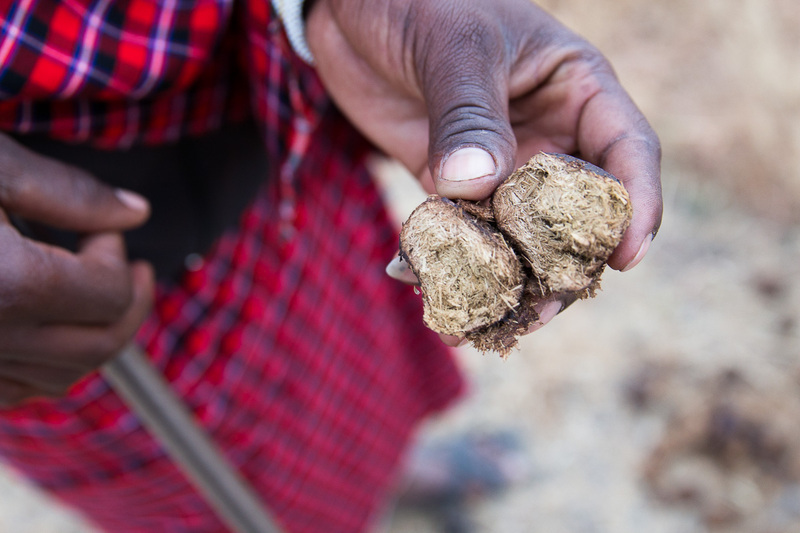 They taught us how to make coffee the traditional way. 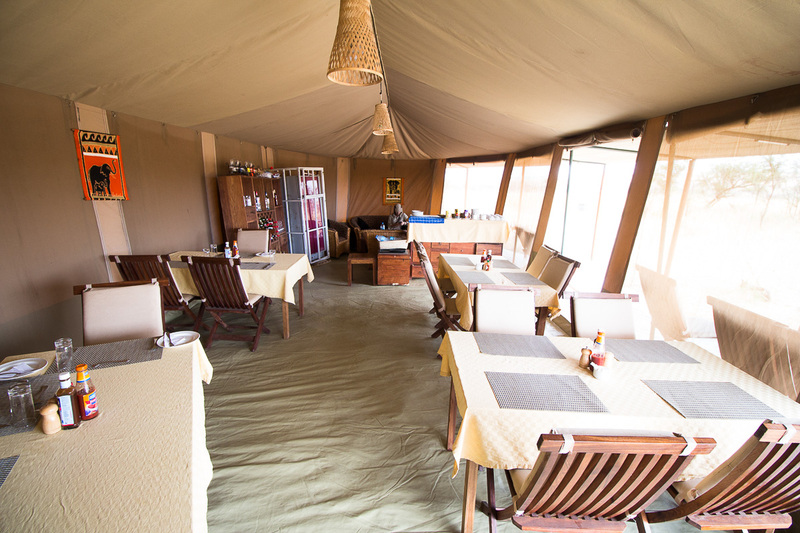 They also prepared a delicious Tanzanian lunch. 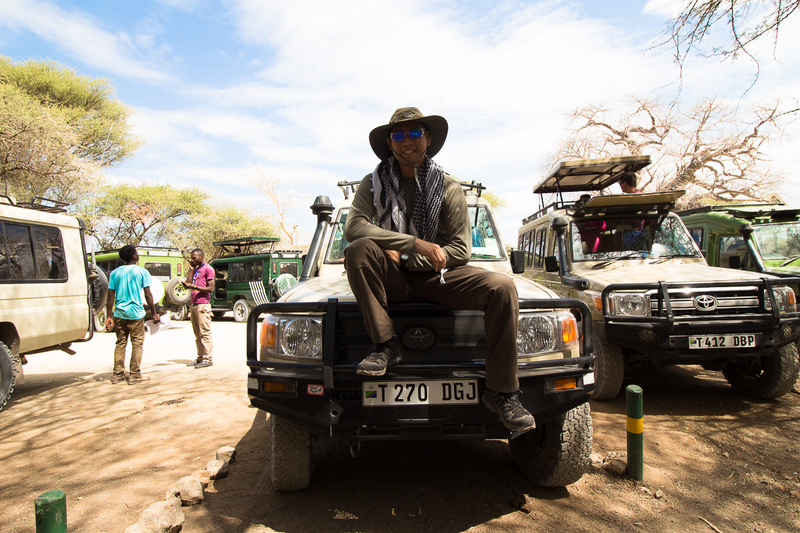 Then we drove an hour to the Kilimanjaro airport for our flight out. Being early paid off as a huge line formed behind us. 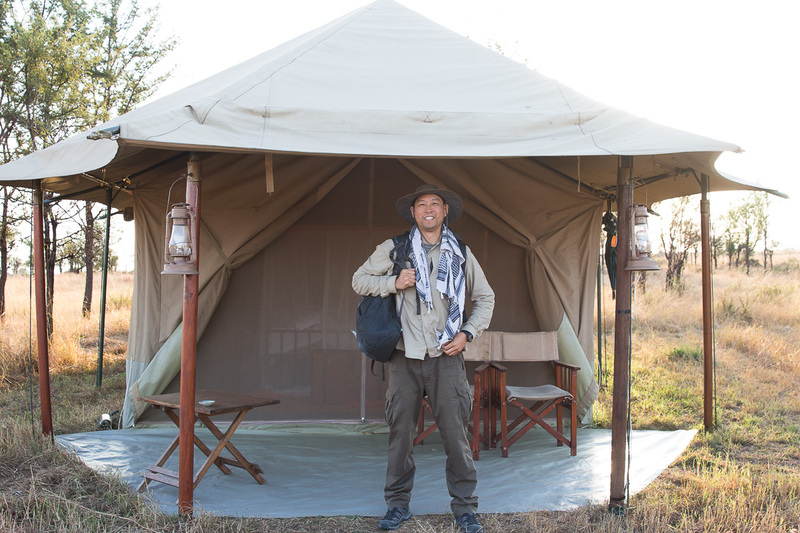 We had an amazing time on our Tanzania Serengeti Safari. It exceeded our expectations and will go down in the books as our favorite trip so far. 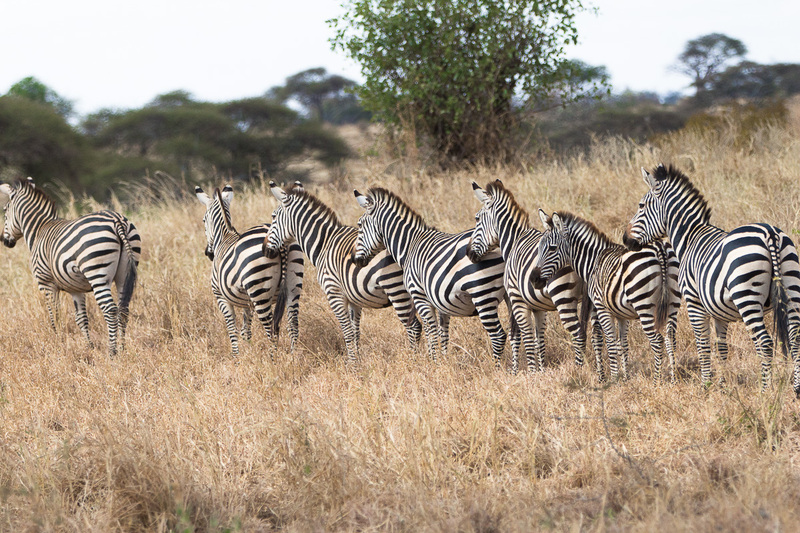 There’s something magical and thrilling about Tanzania, and we can totally see why some people go back to Tanzania almost every year (go find them on TripAdvisor). Every trip is different and you start the day not knowing what to expect. 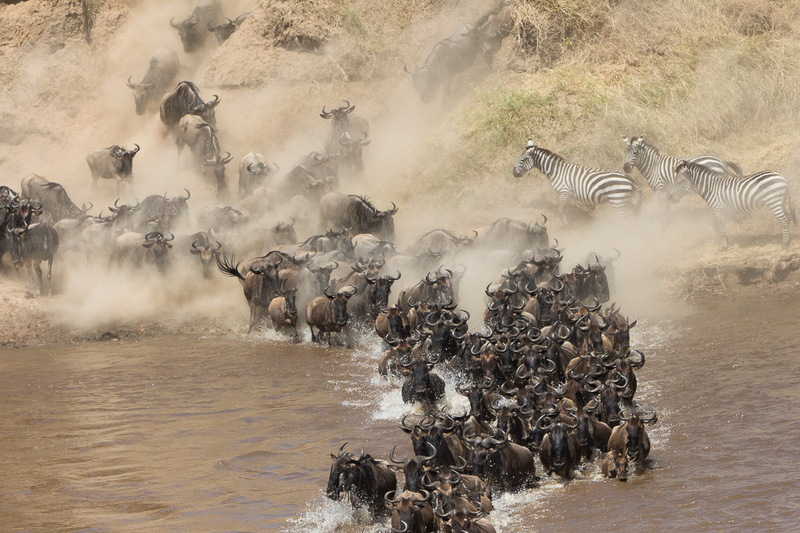 It’s nothing like watching an episode of National Geographic. You’ll walk away with great pictures and even greater stories. We hope you get the chance to visit Tanzania one day!